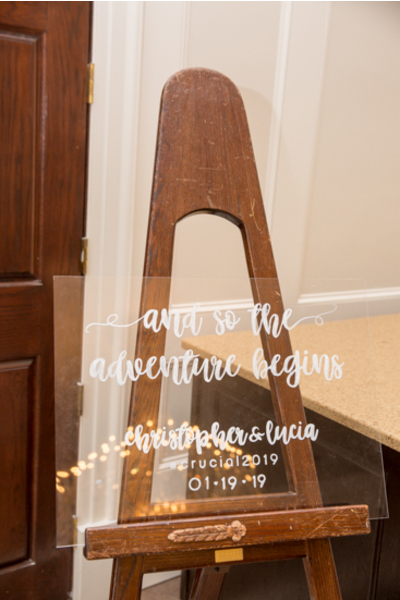 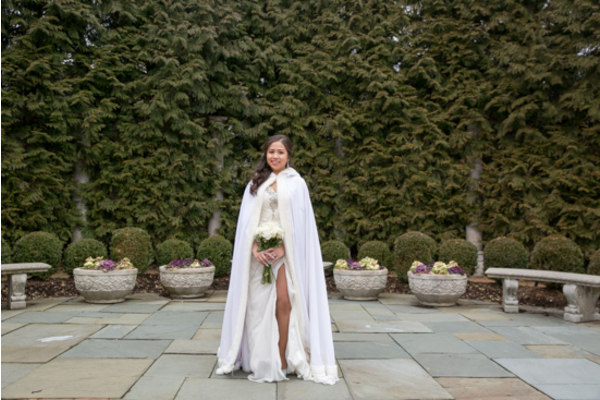 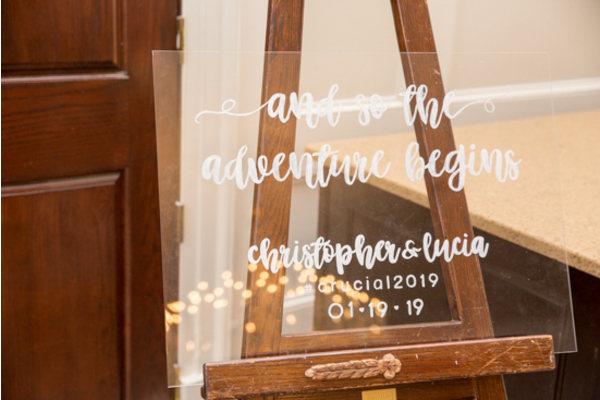 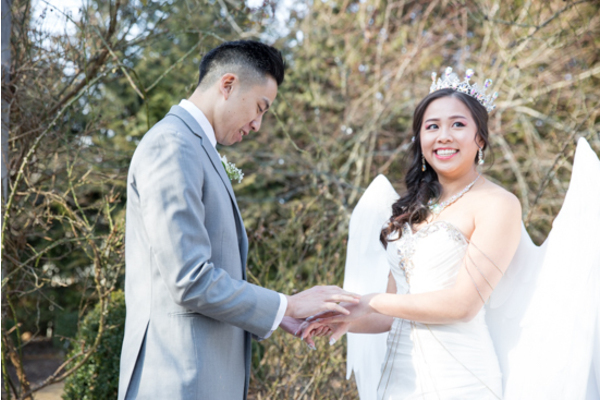 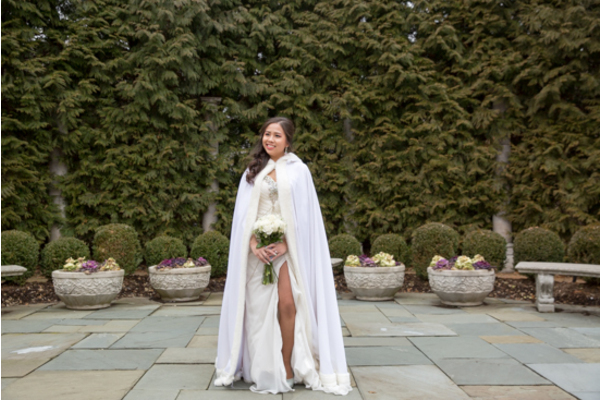 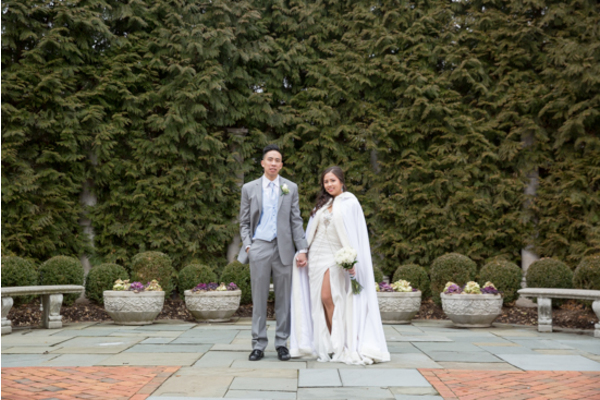 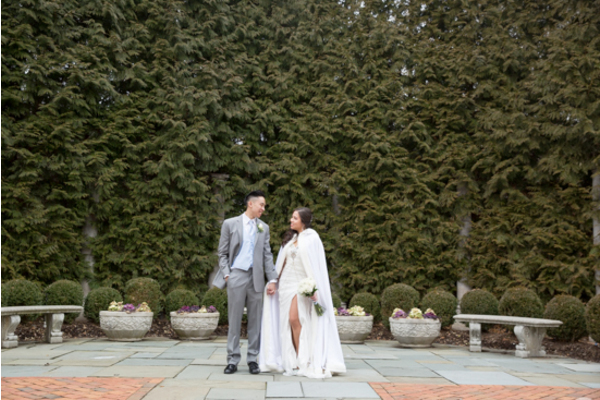 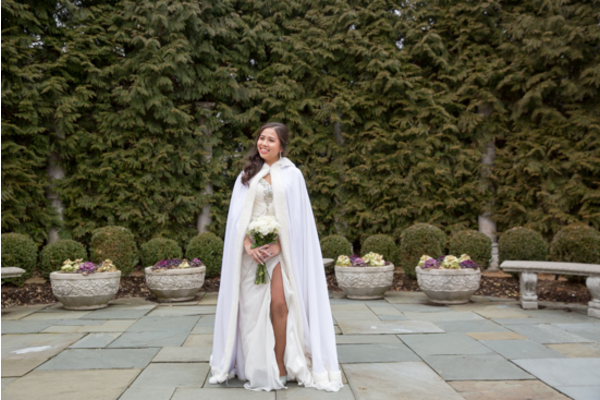 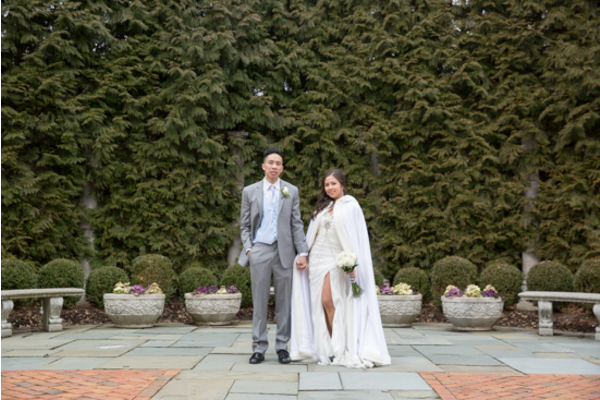 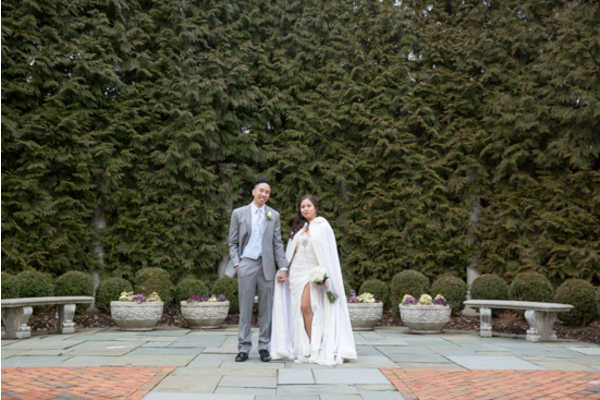 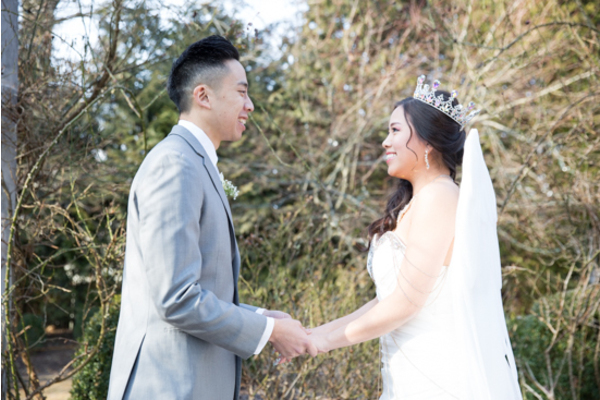 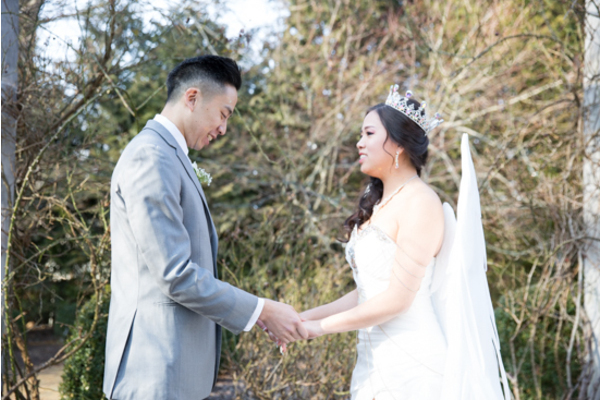 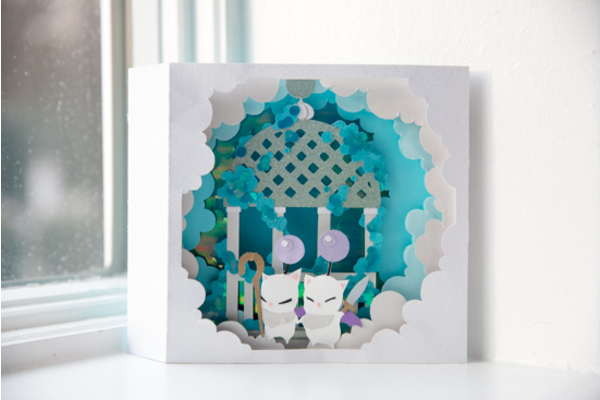 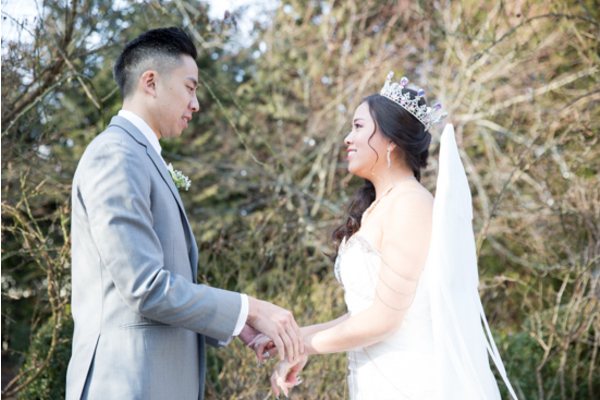 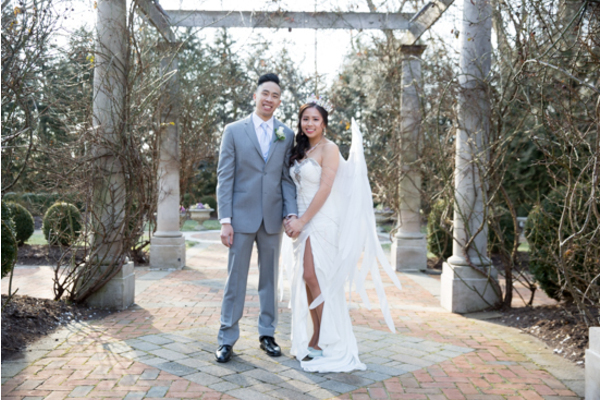 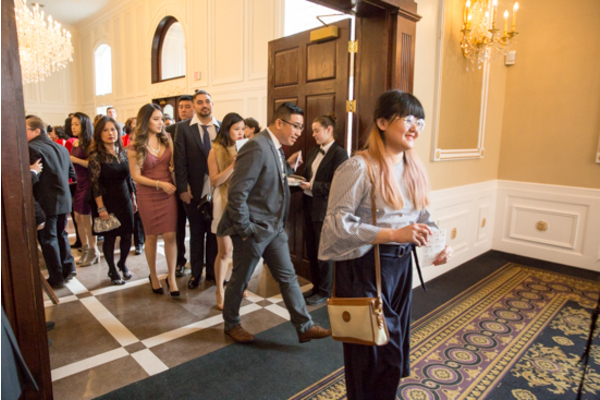 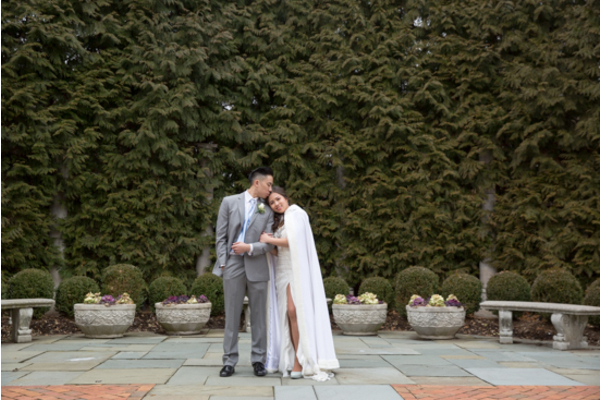 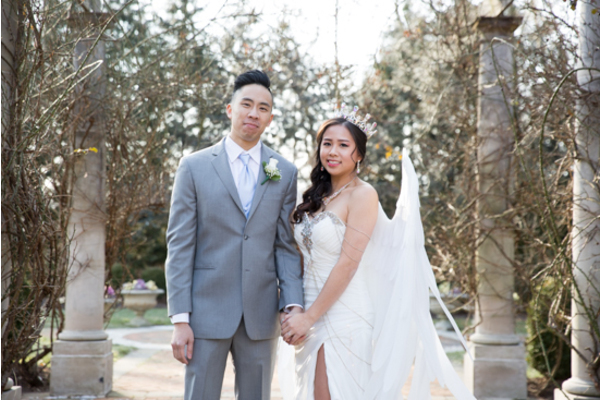 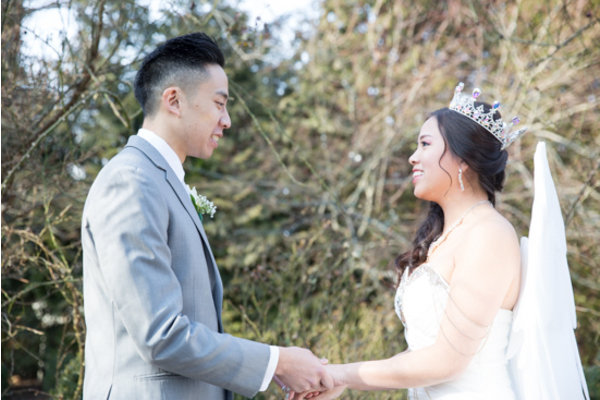 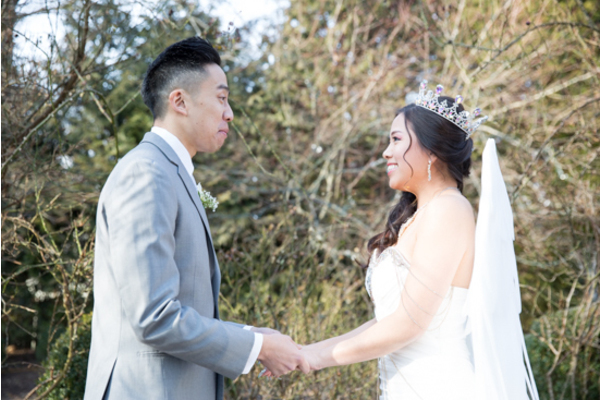 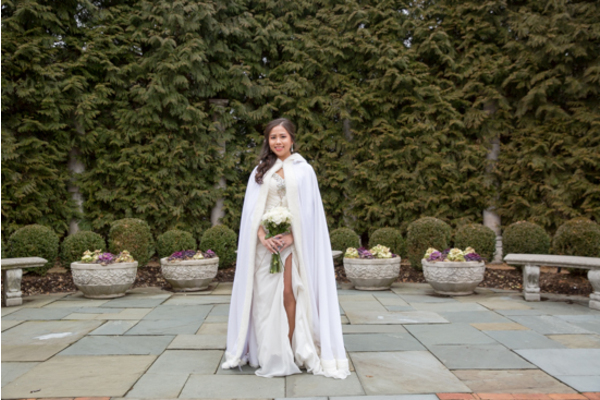 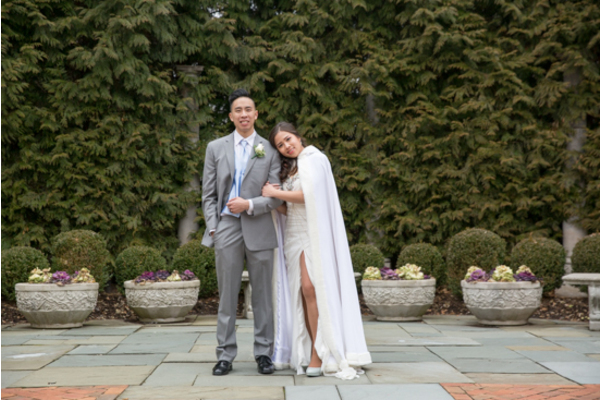 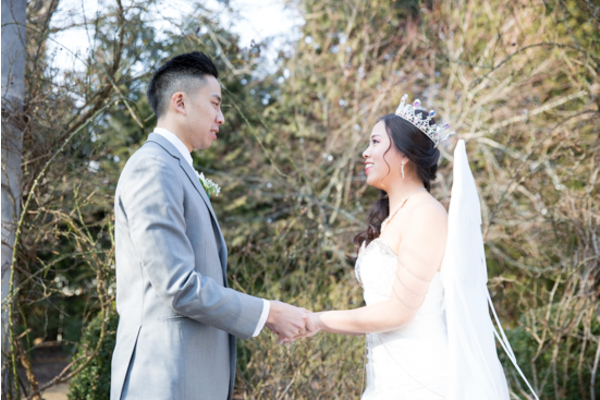 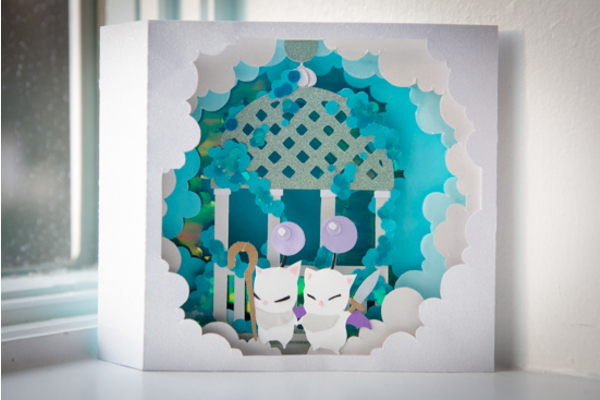 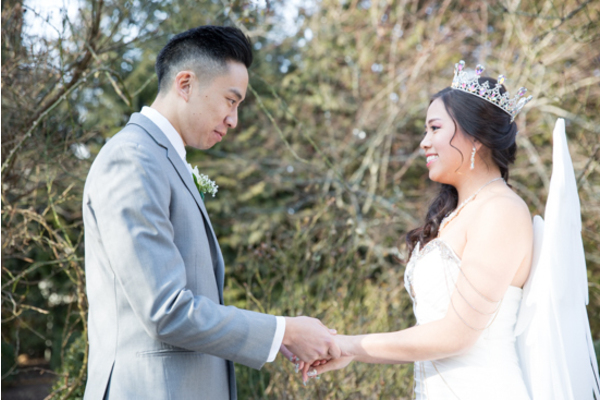 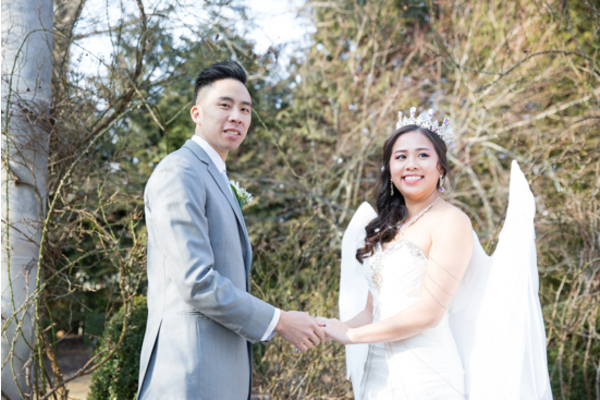 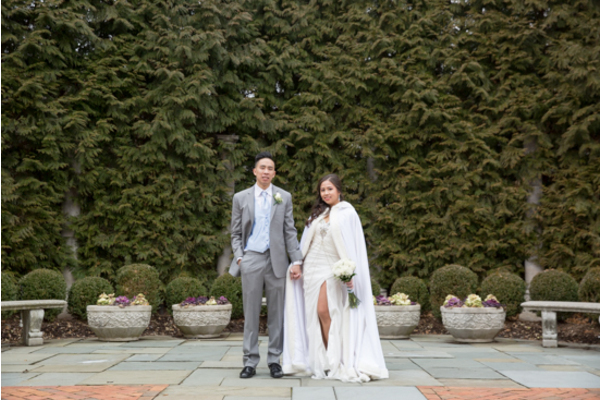 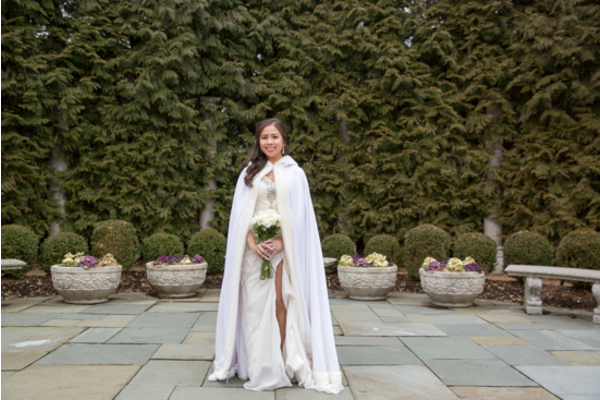 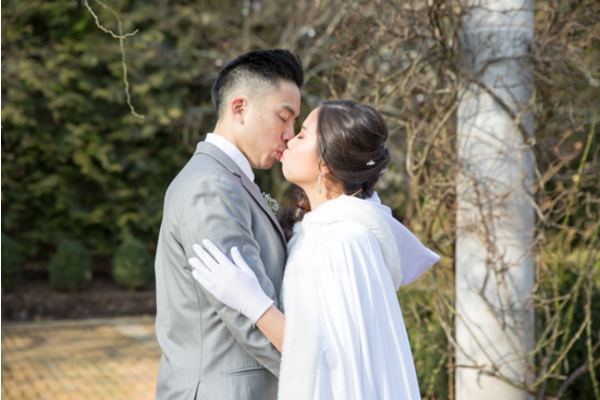 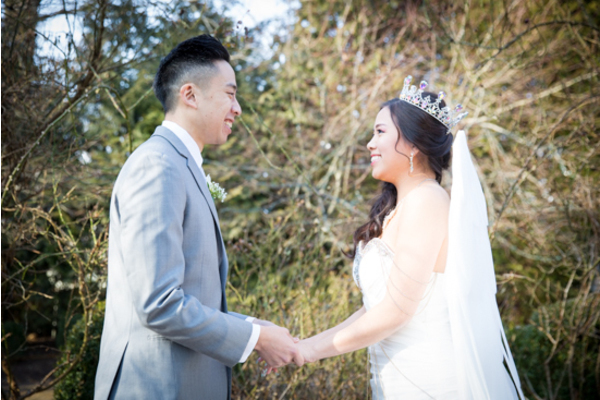 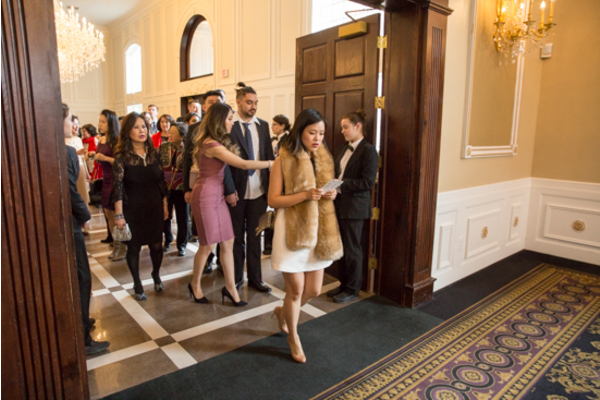 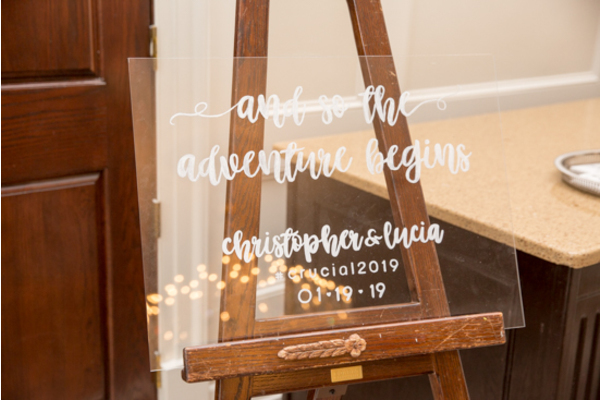 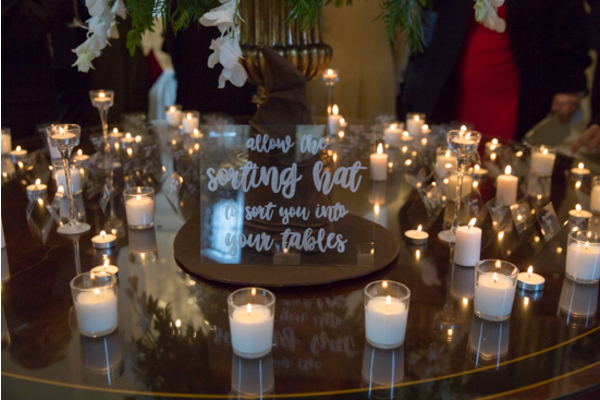 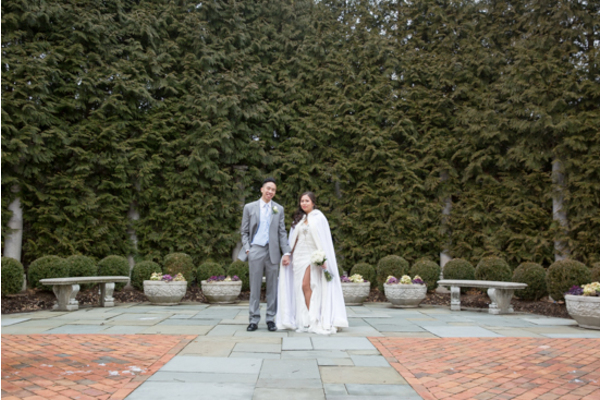 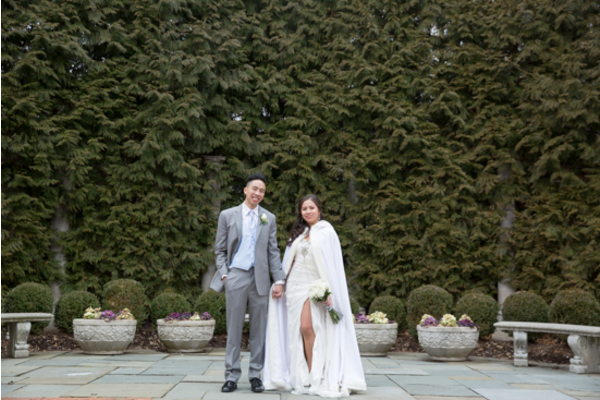 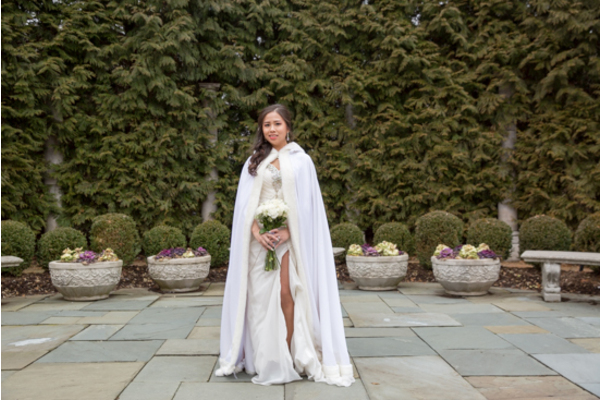 Congratulations to Lucia and Chris on their extravagant January 2019 wedding! 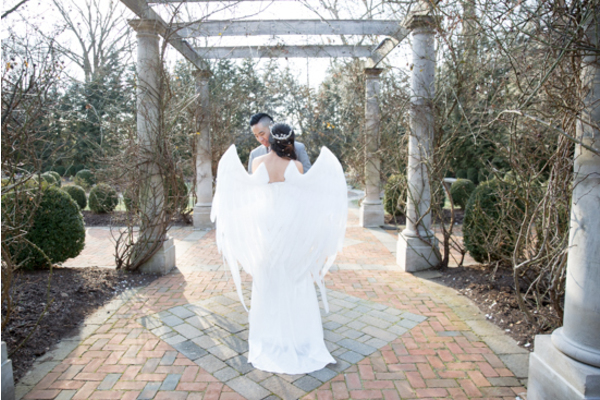 The sweethearts wed at The Estate at Florentine Gardens. 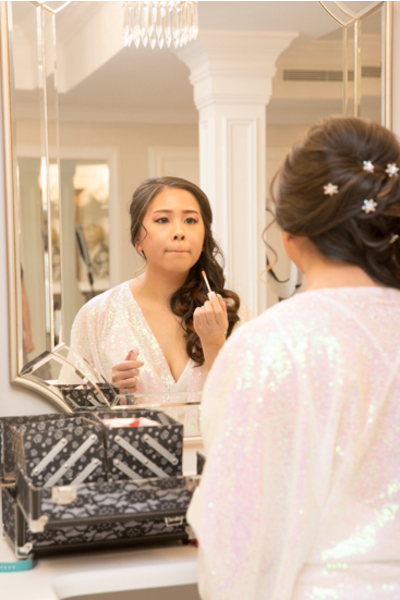 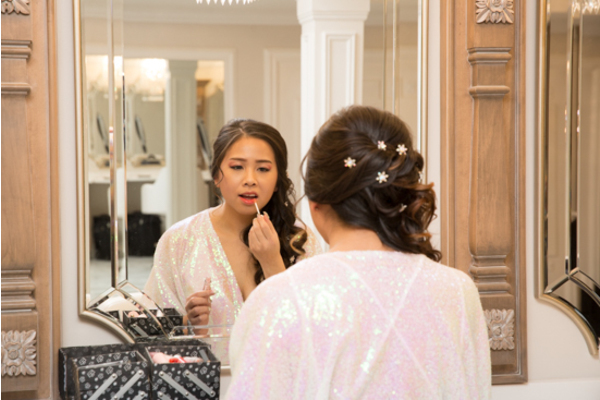 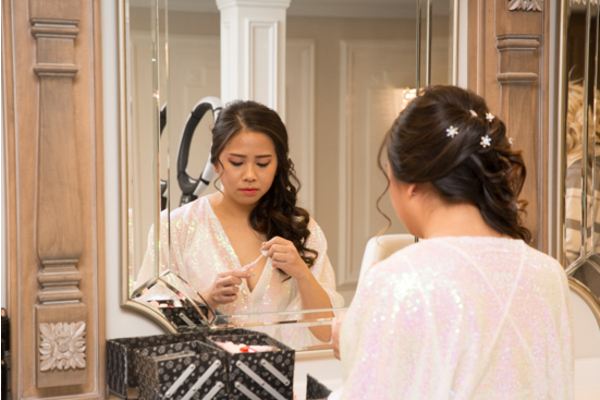 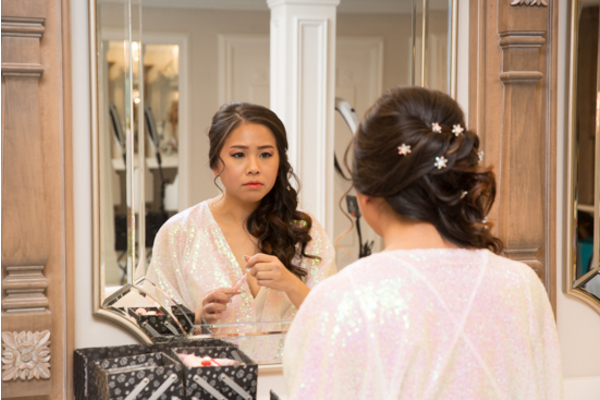 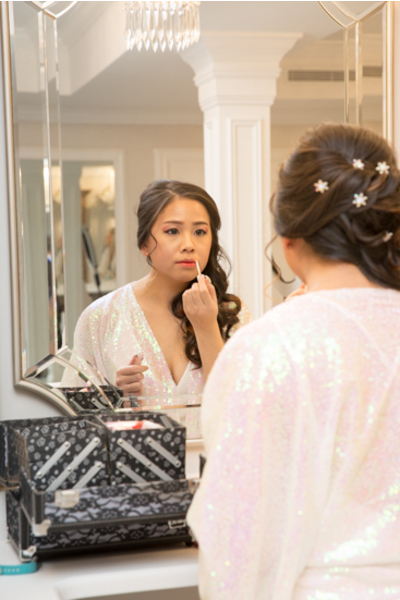 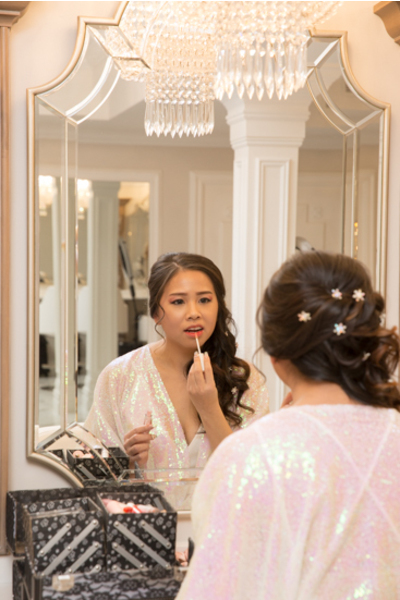 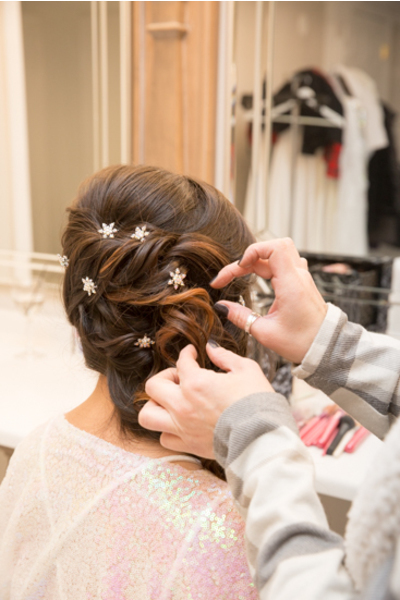 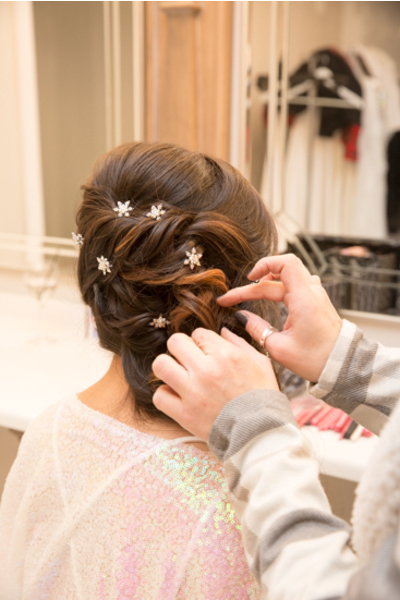 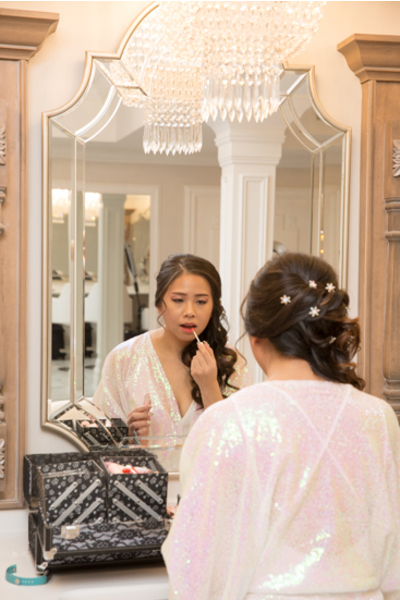 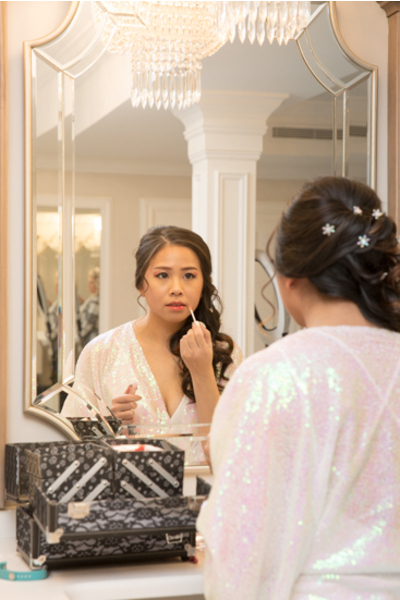 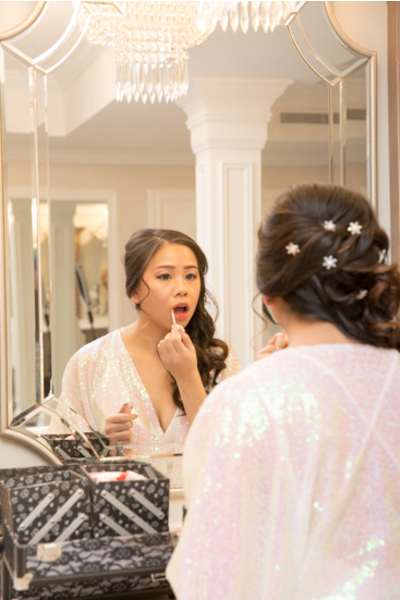 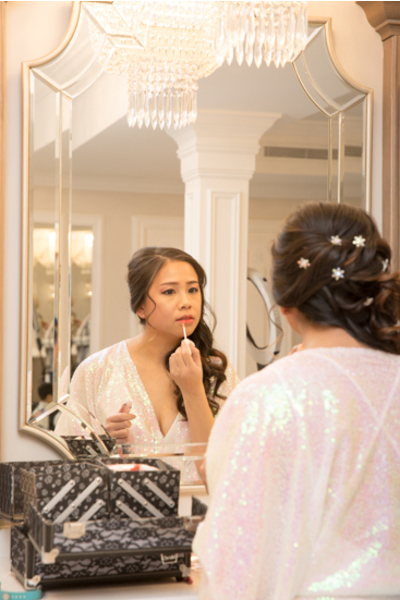 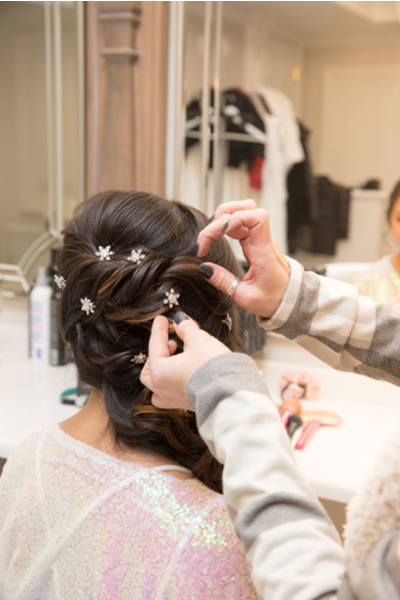 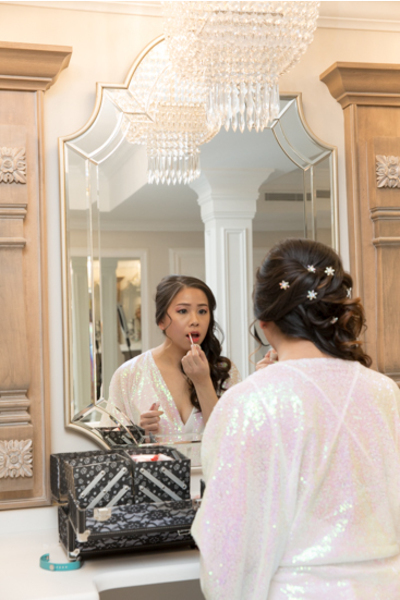 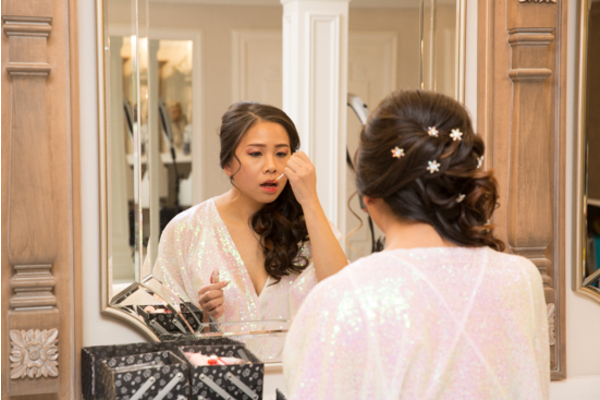 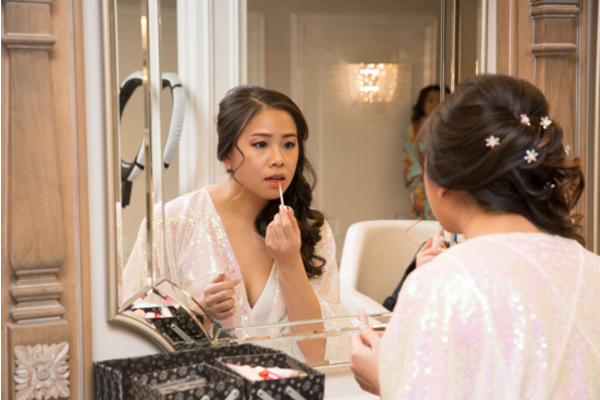 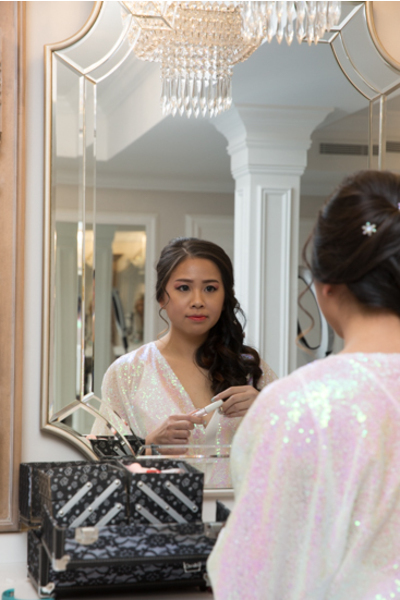 The lovely bride spent her morning getting ready for her big day ahead! 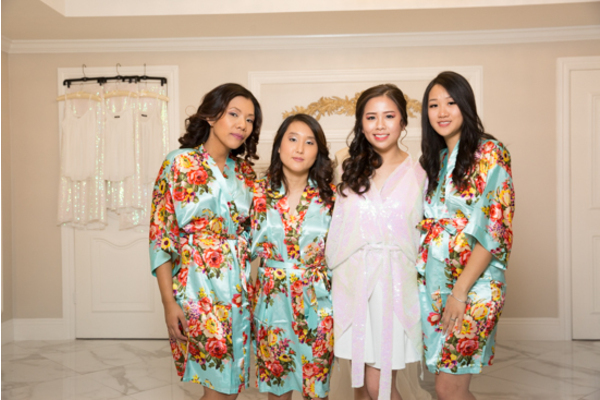 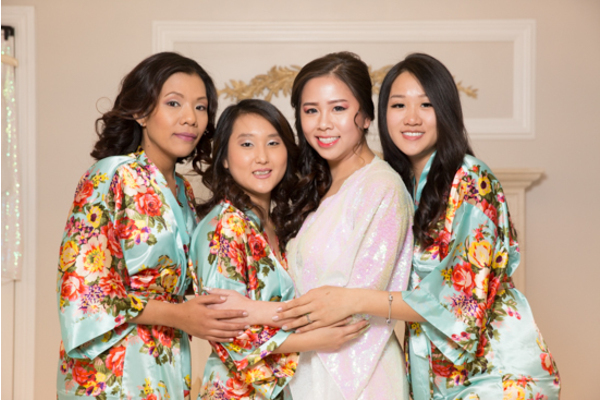 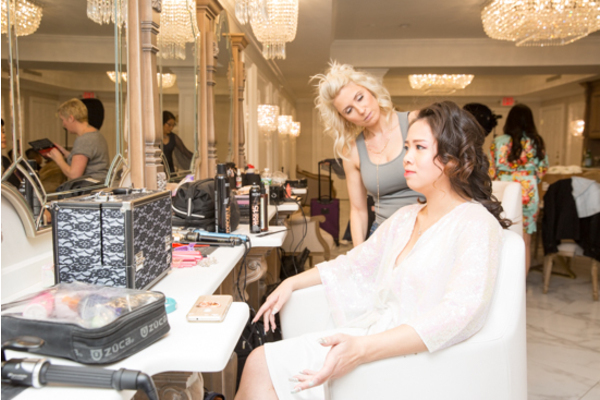 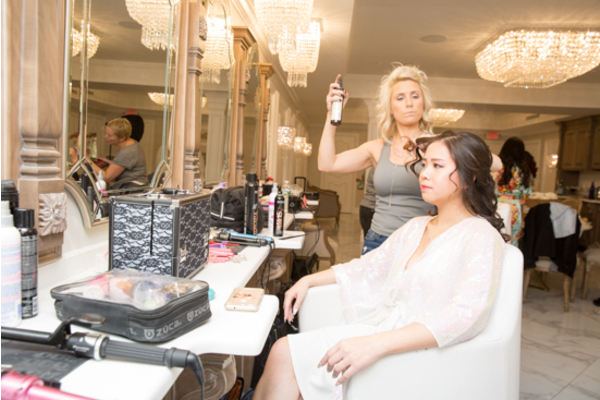 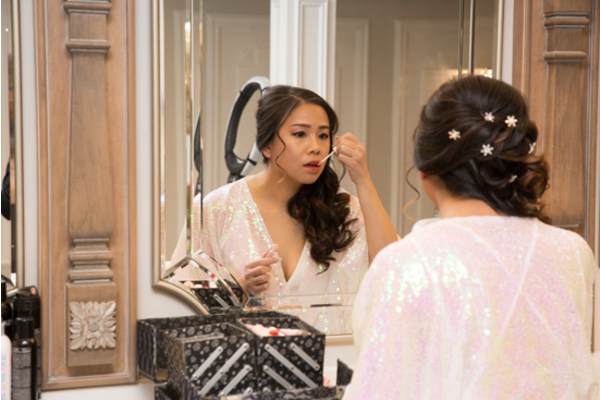 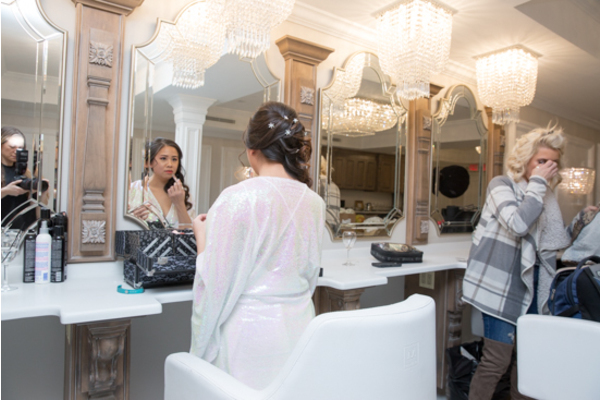 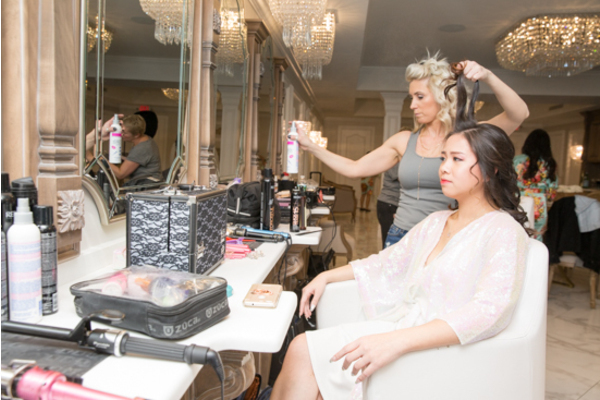 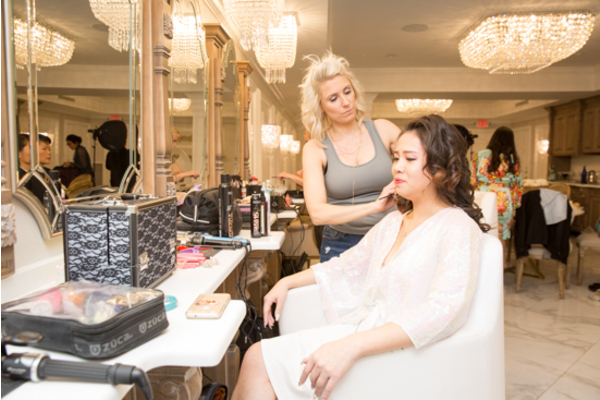 She dressed in a sparkly white robe while her bridal party wore bright floral robes to get pampered before the festivities began. 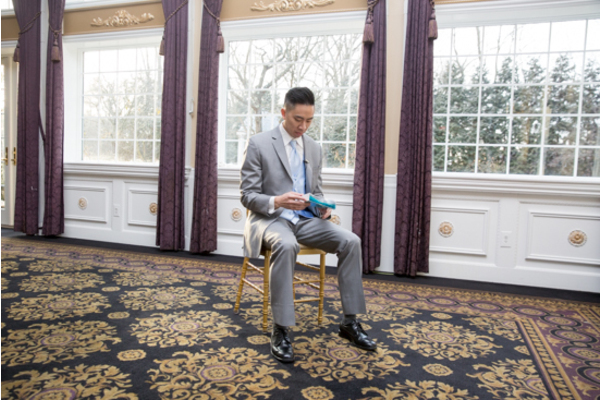 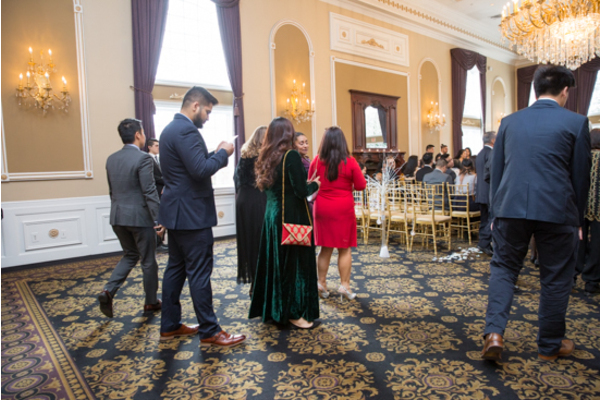 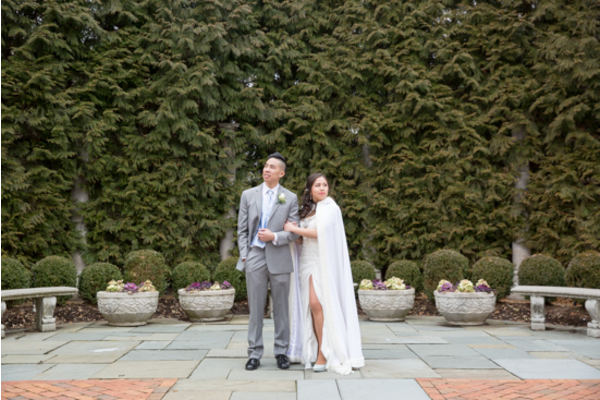 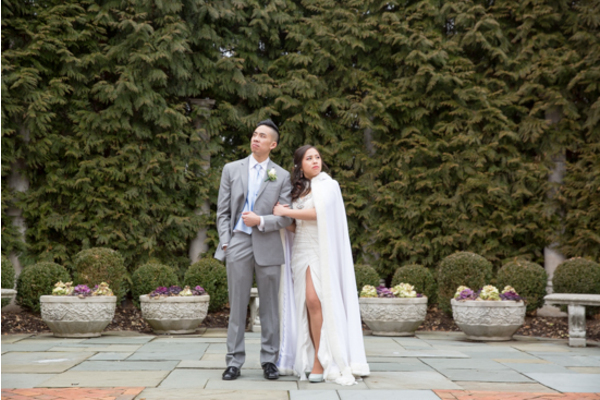 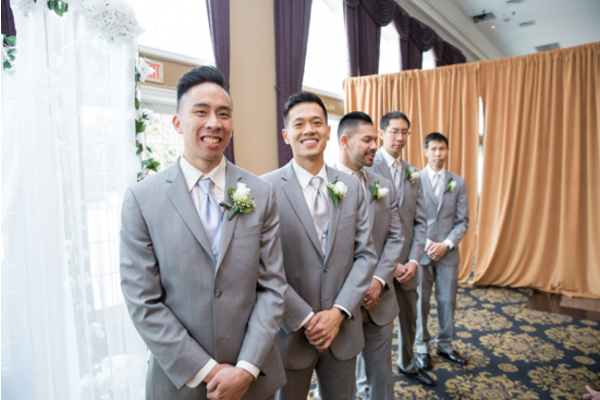 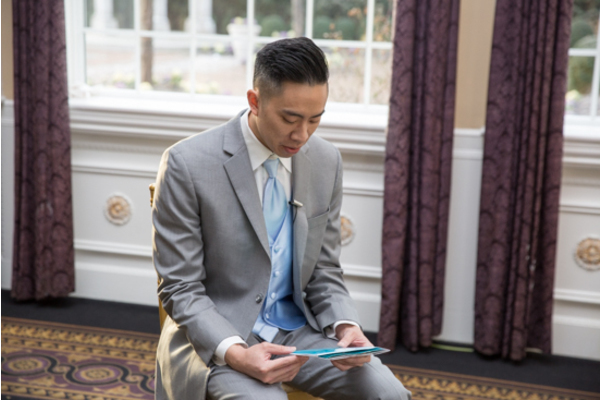 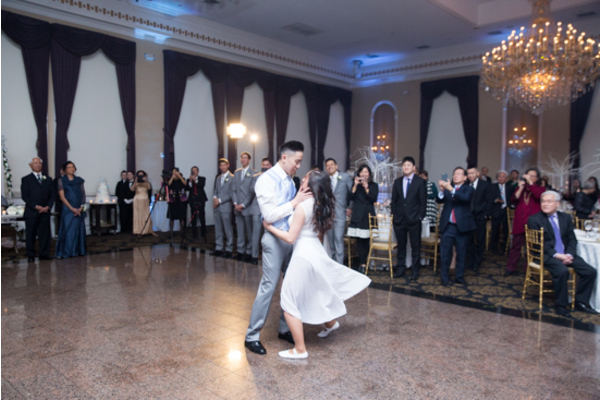 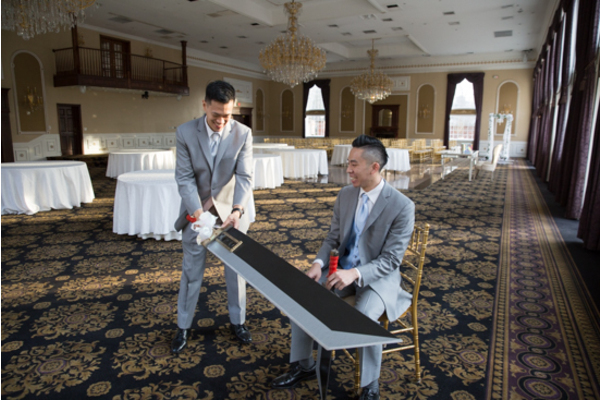 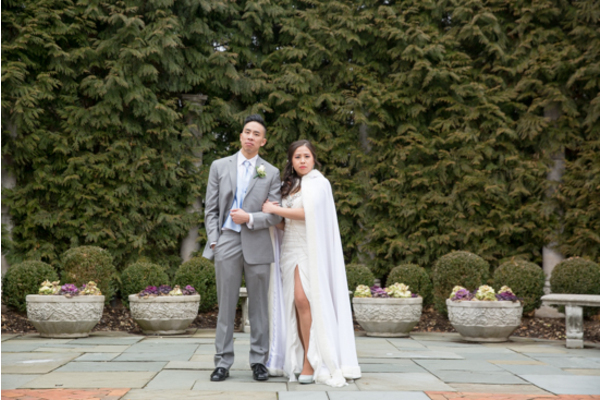 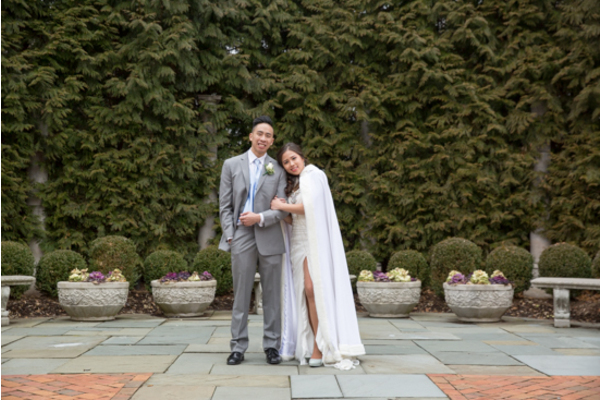 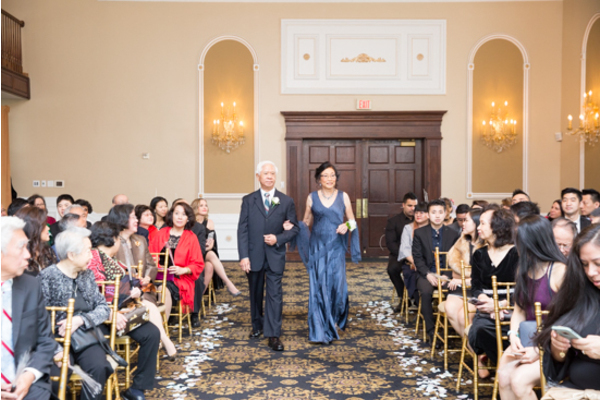 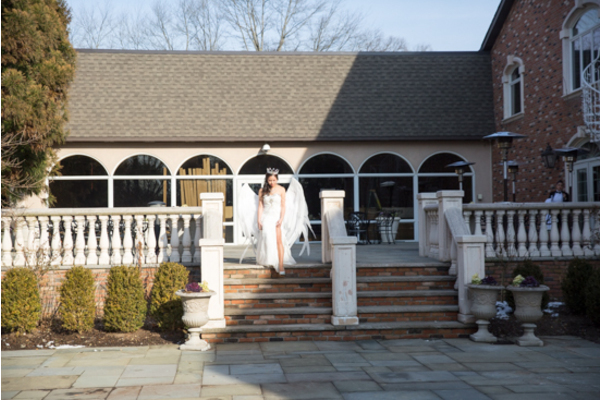 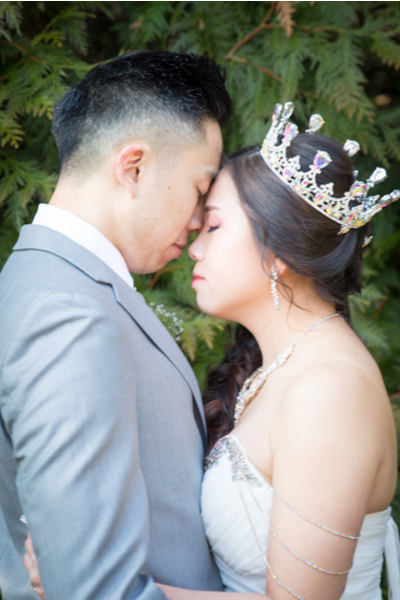 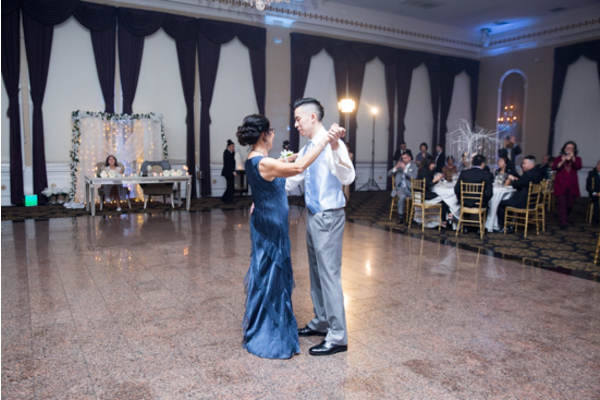 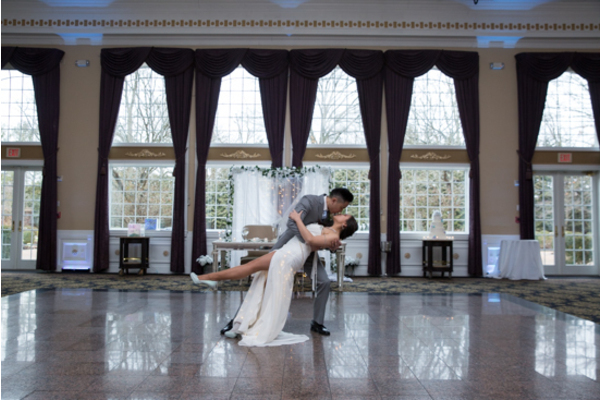 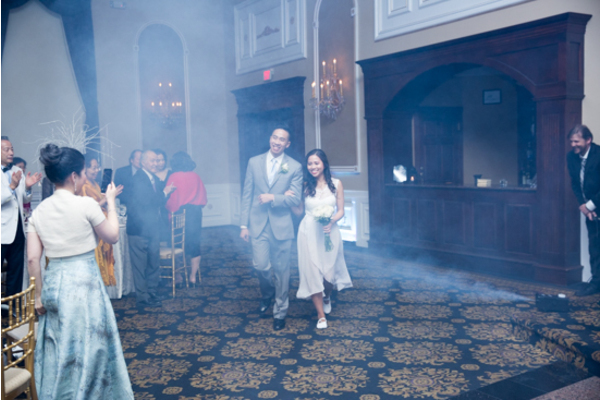 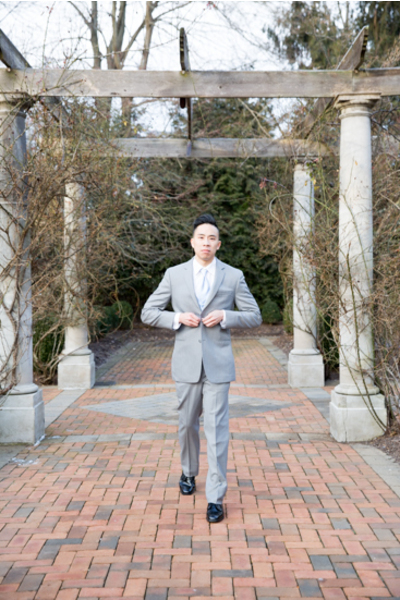 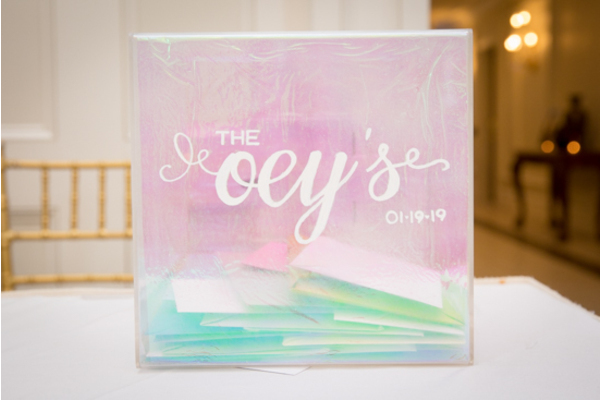 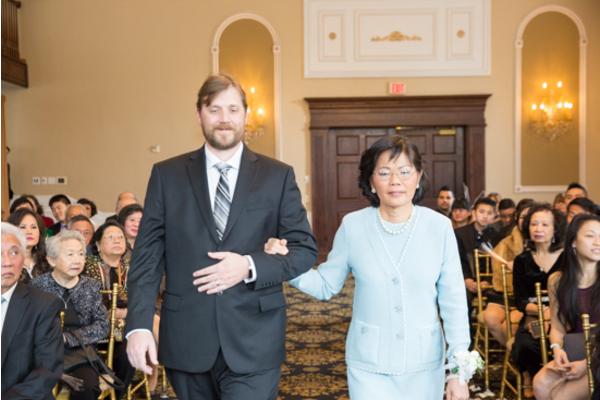 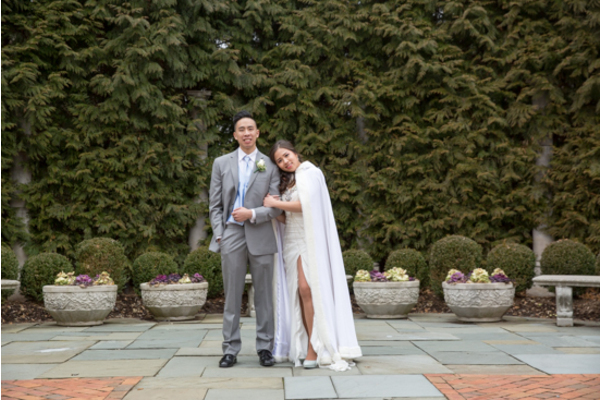 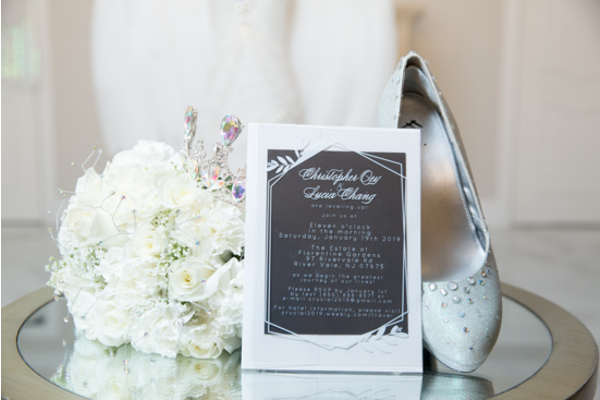 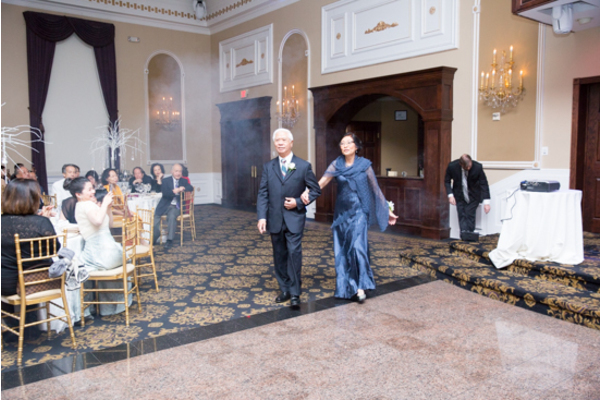 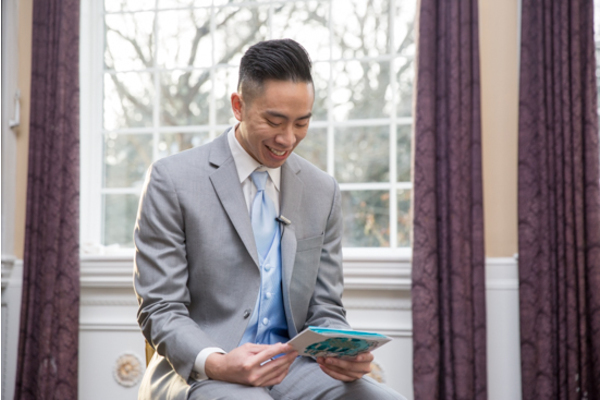 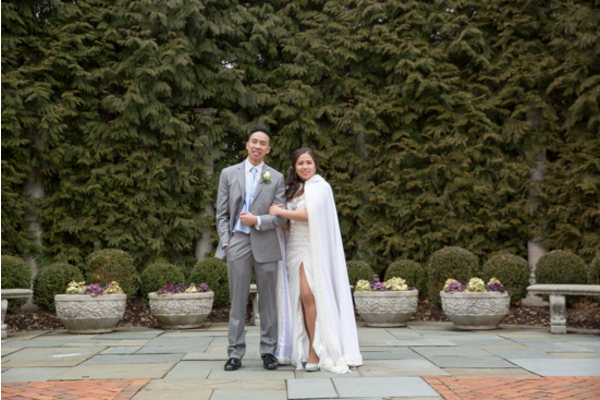 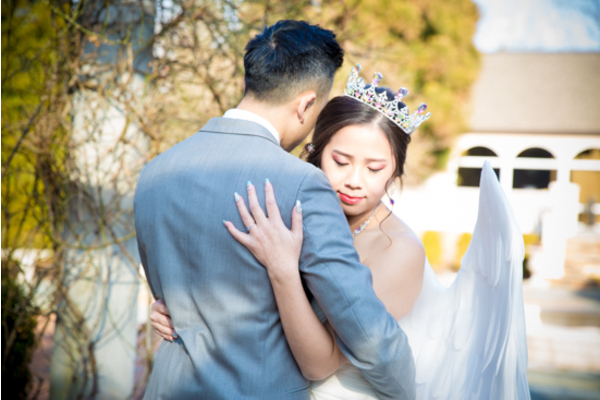 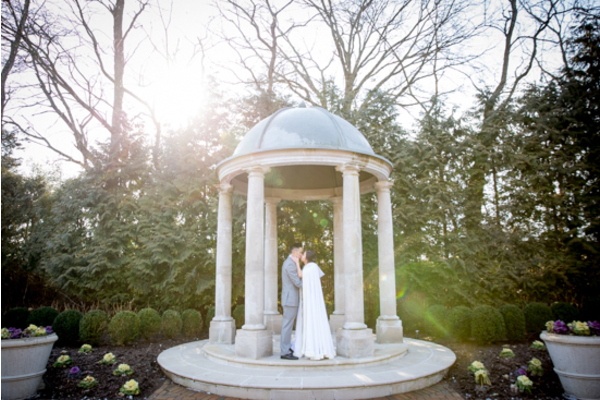 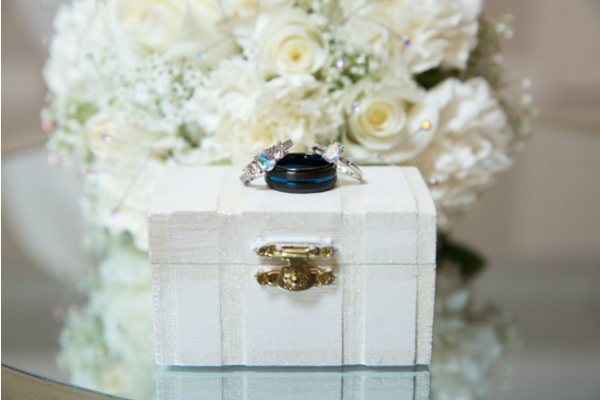 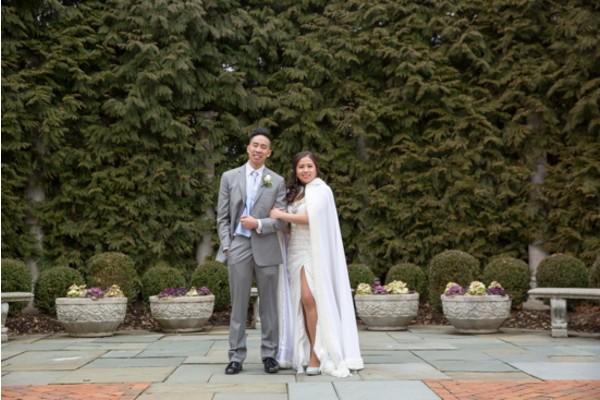 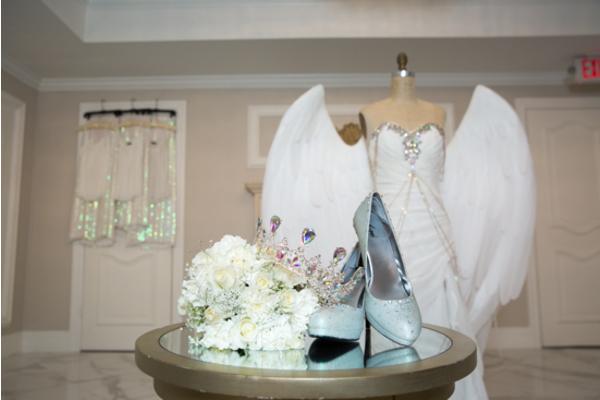 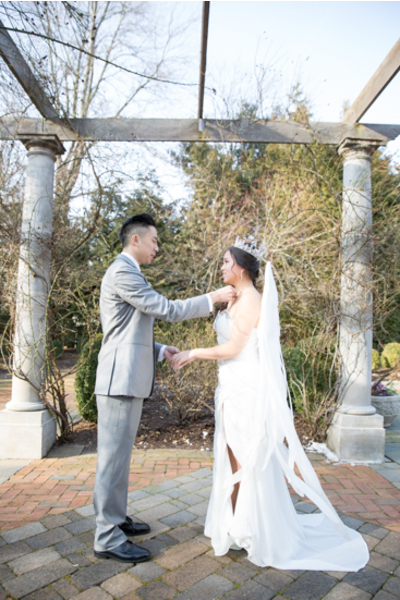 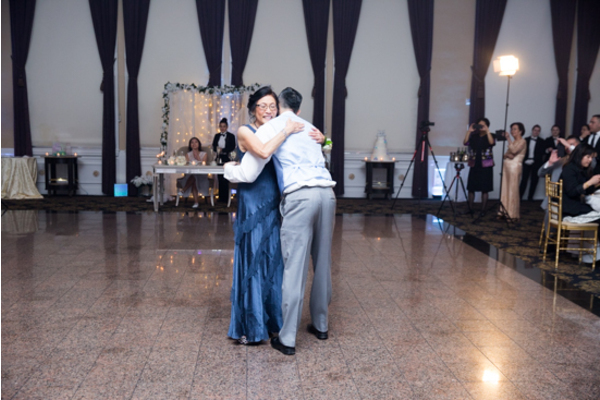 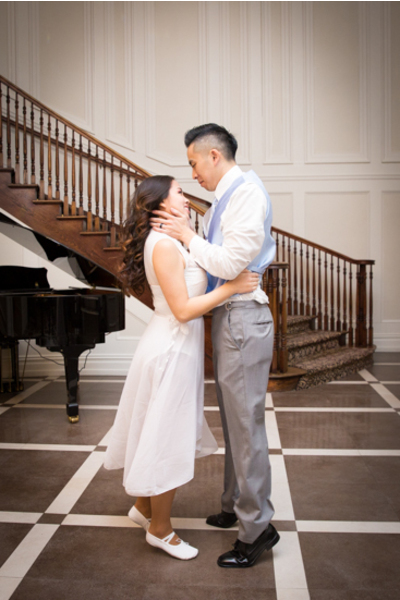 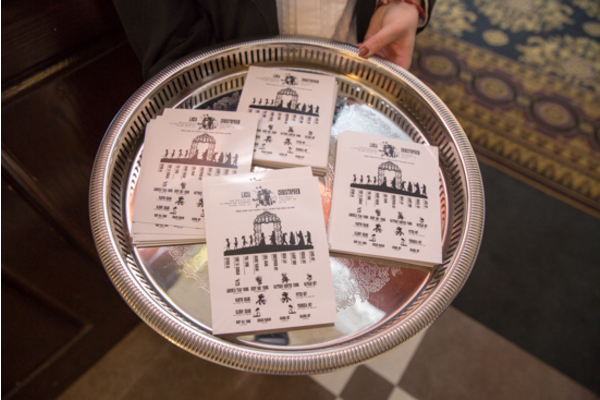 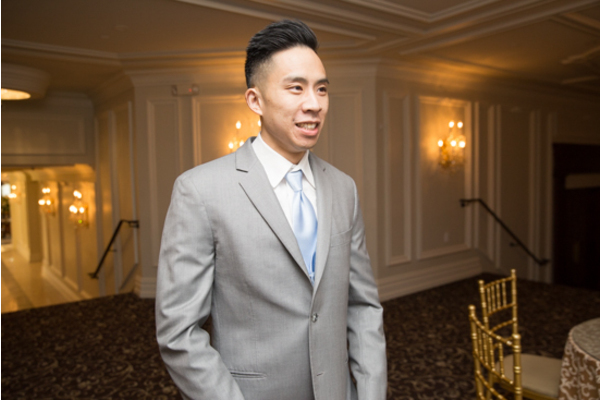 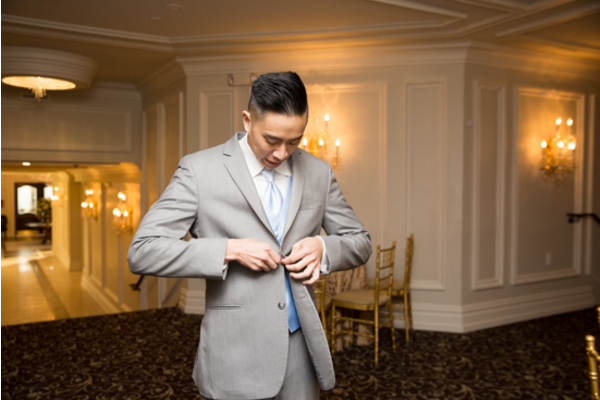 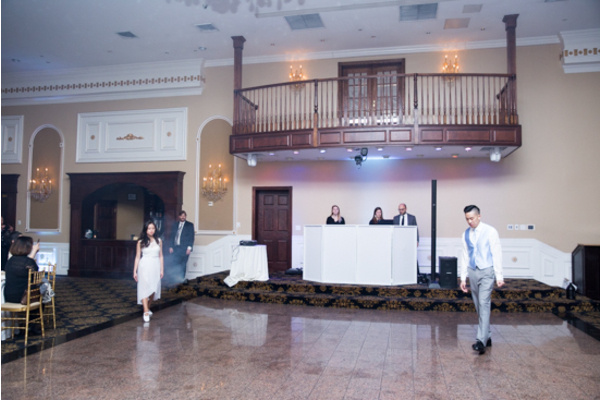 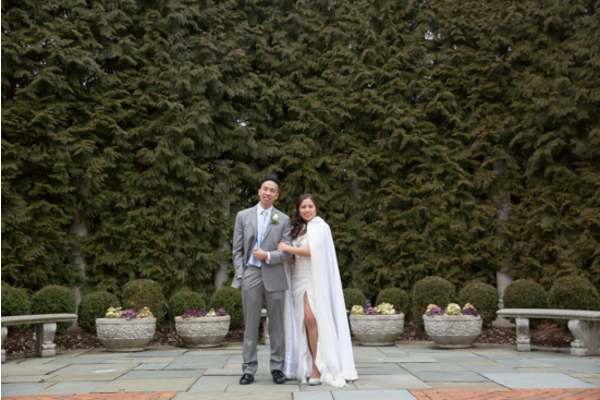 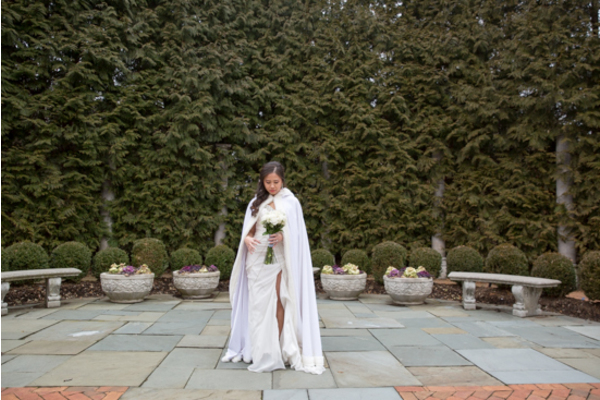 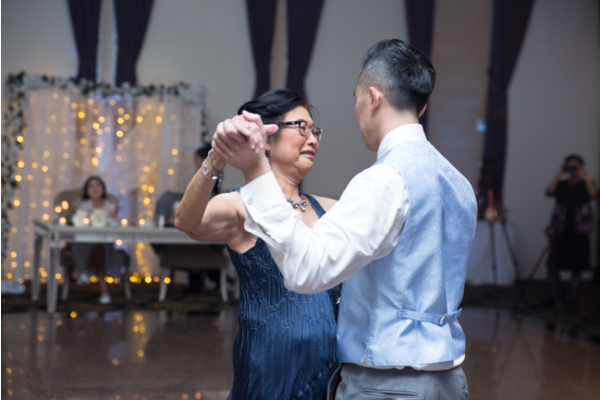 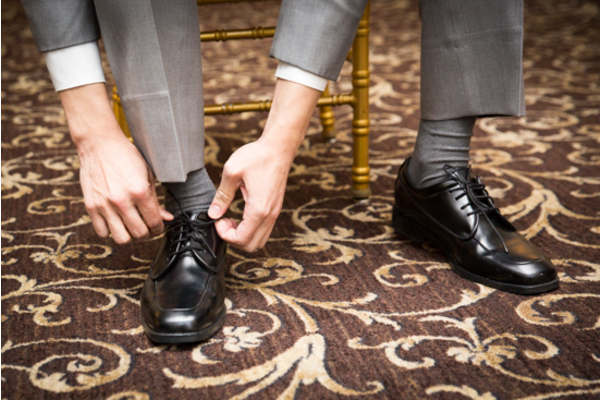 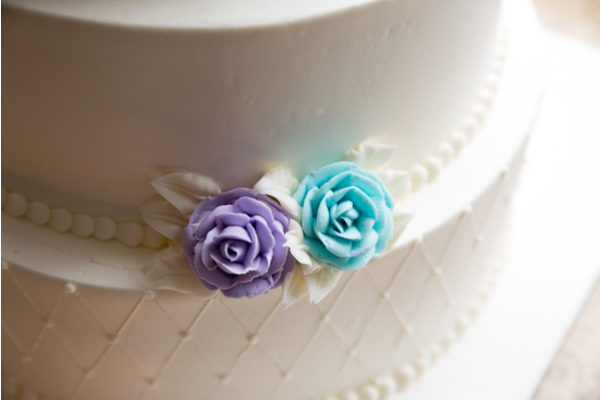 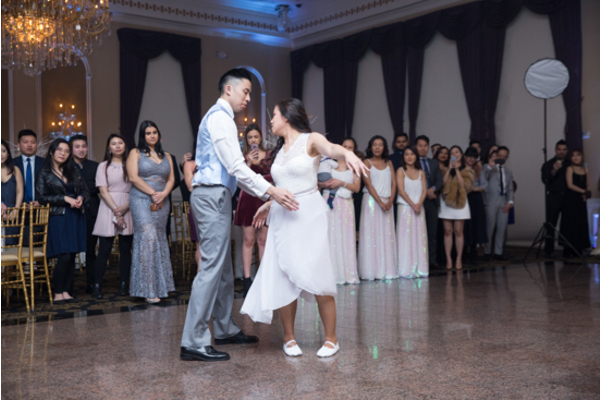 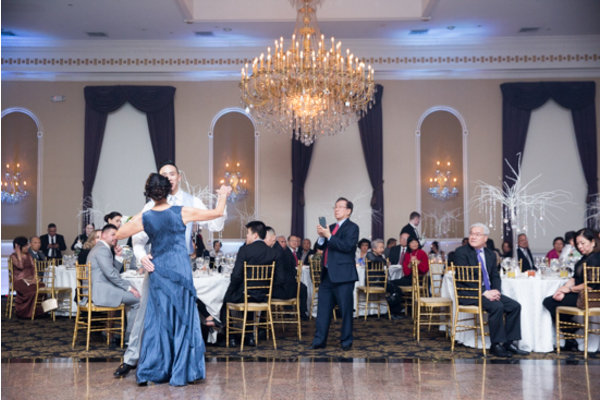 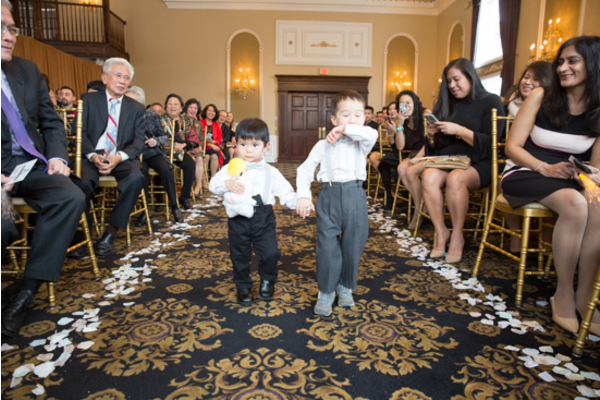 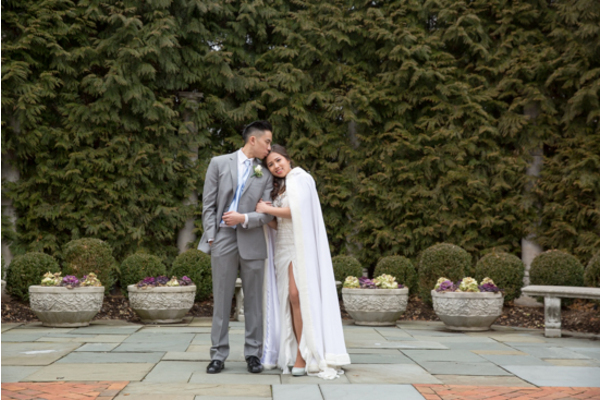 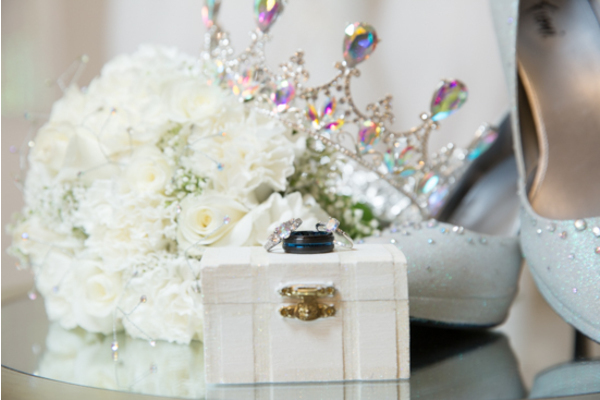 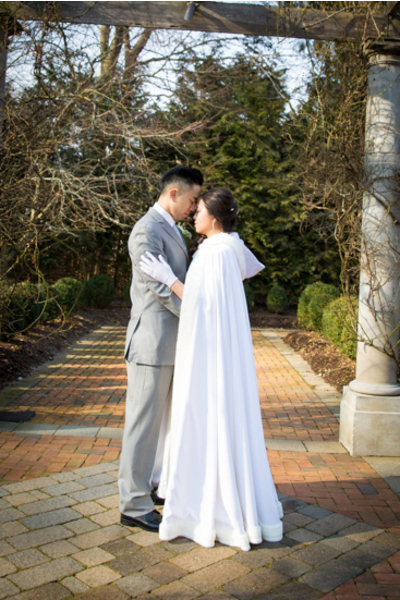 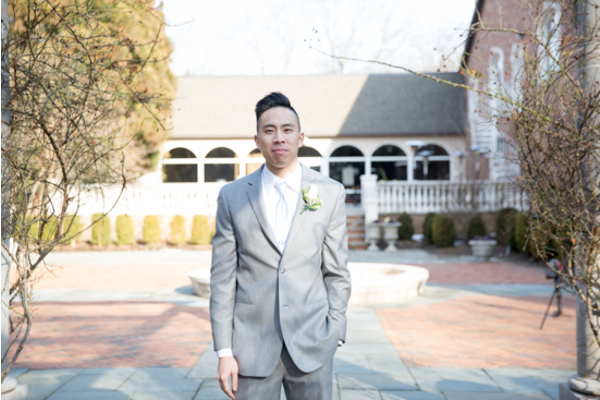 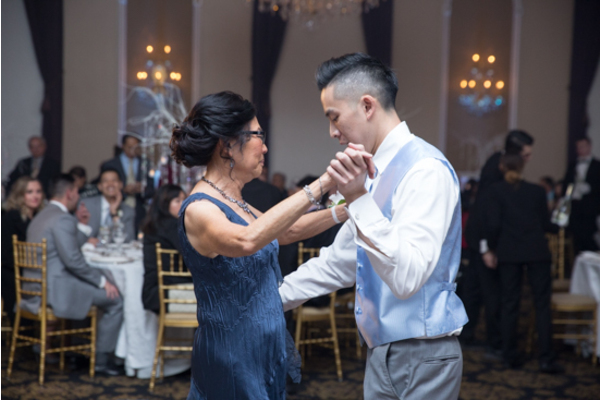 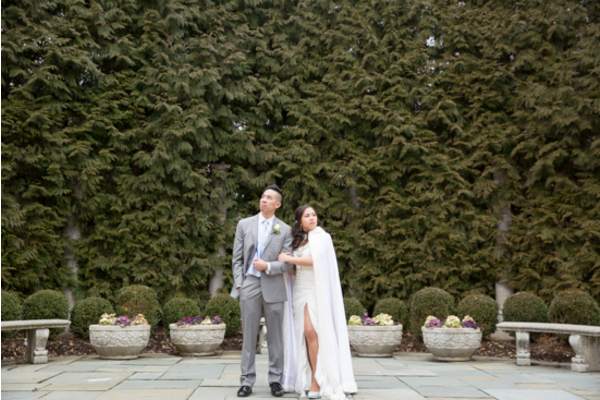 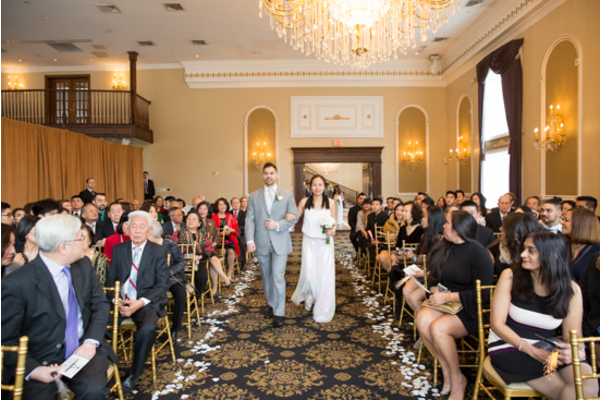 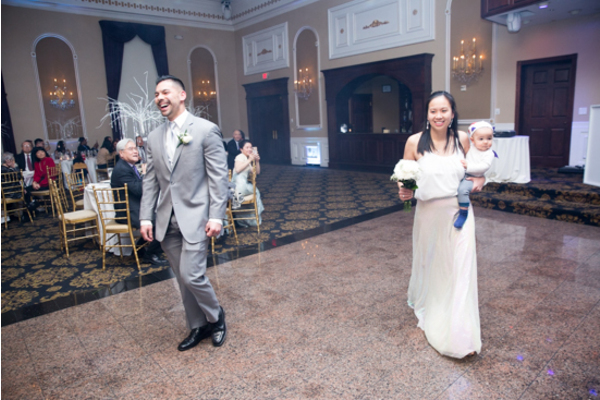 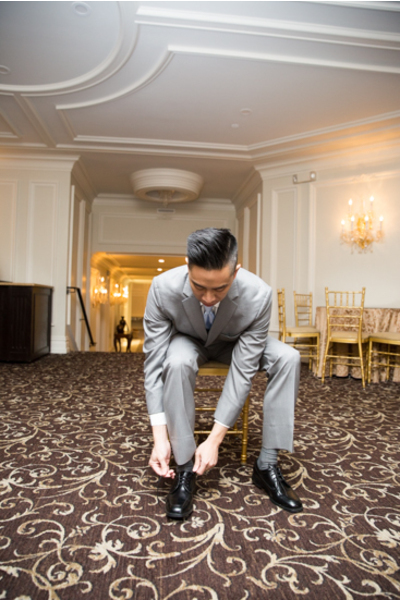 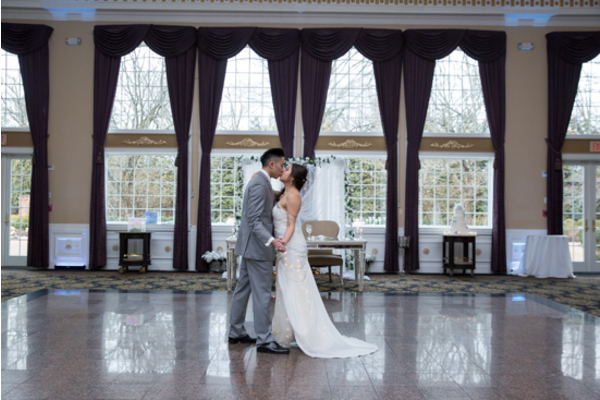 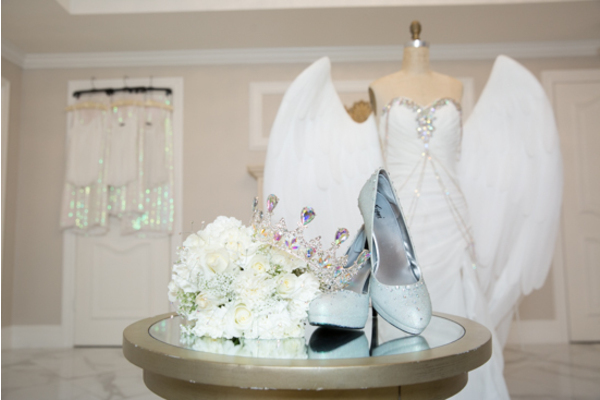 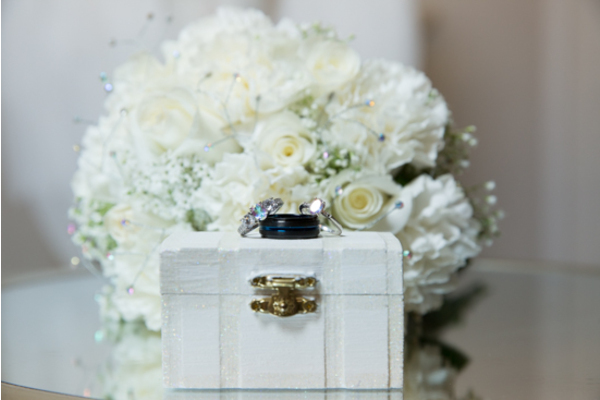 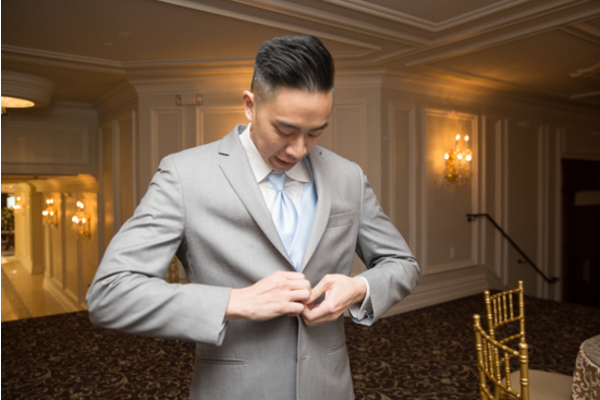 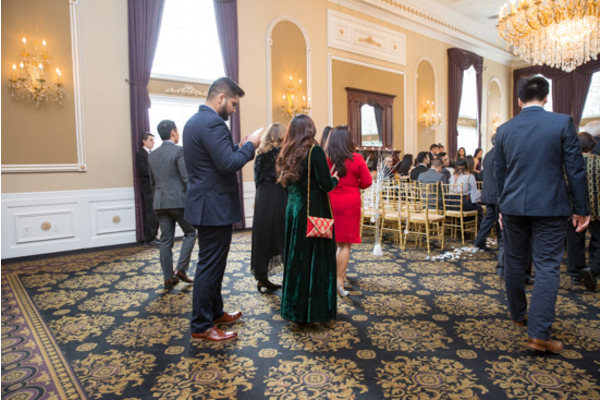 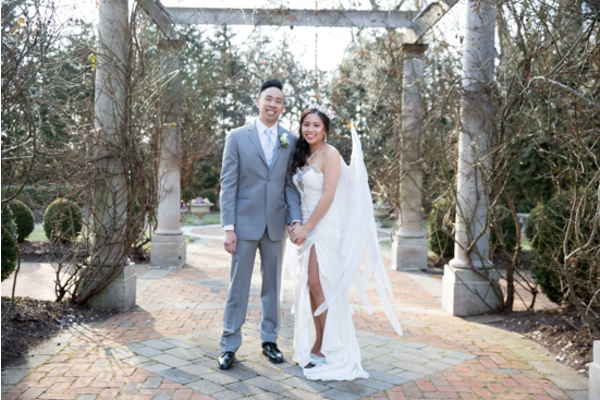 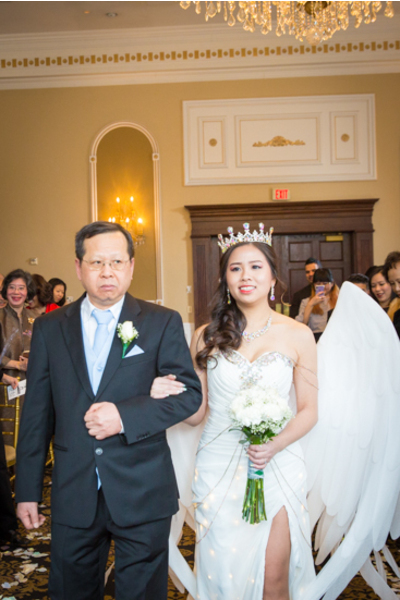 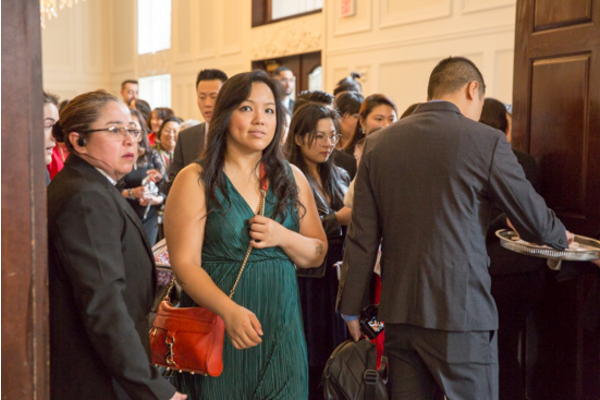 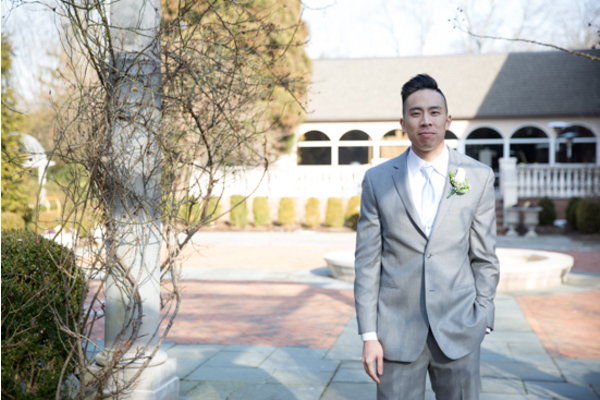 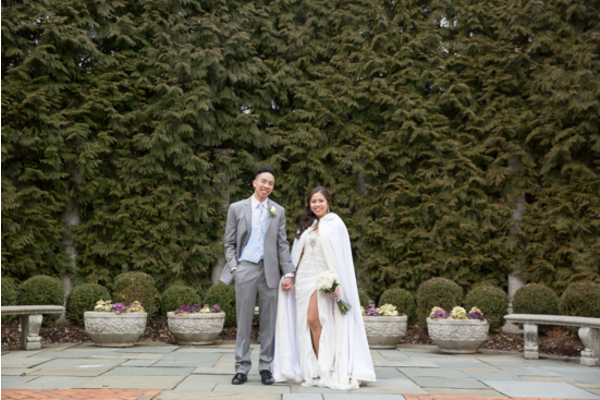 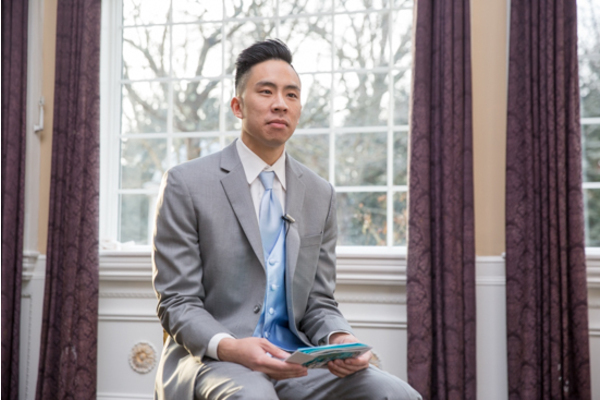 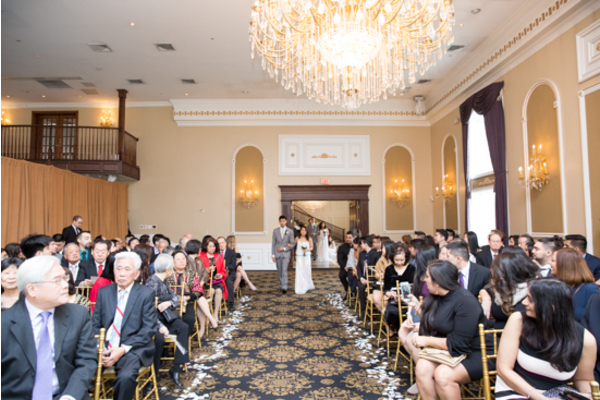 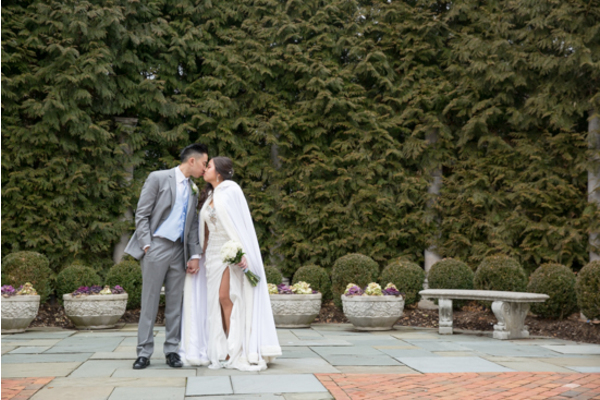 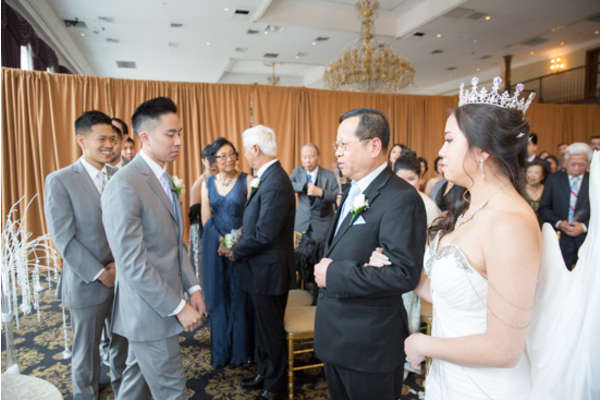 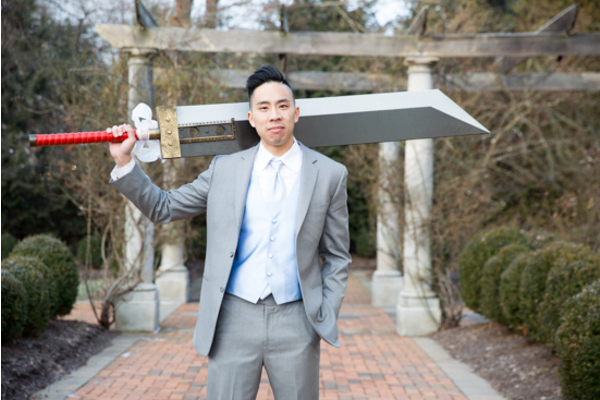 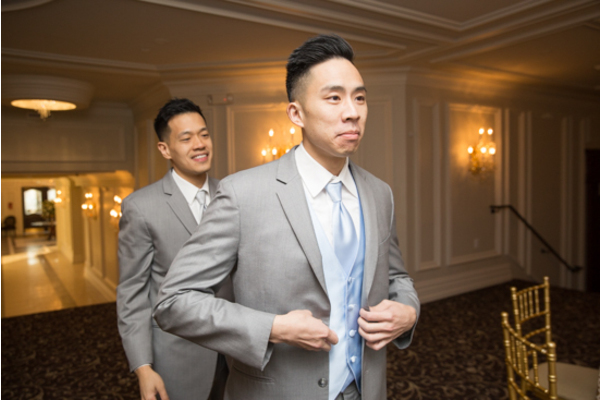 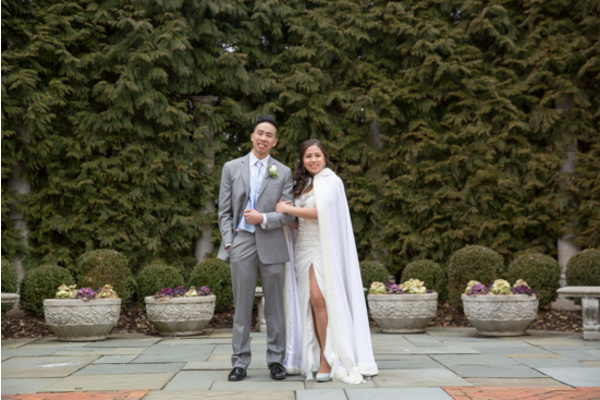 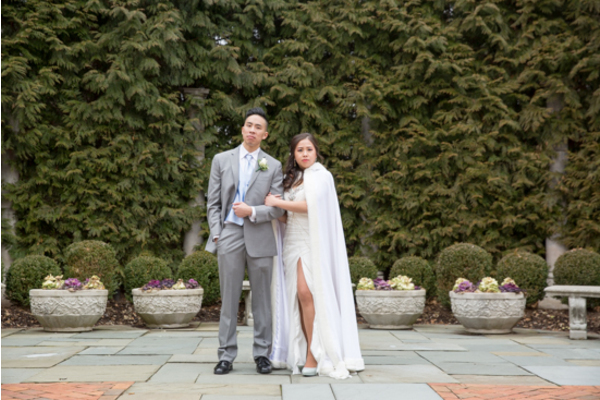 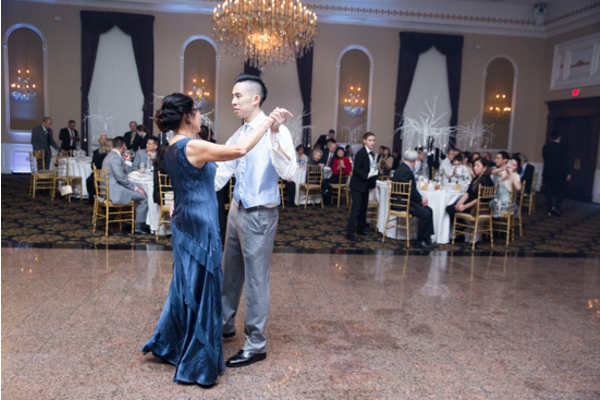 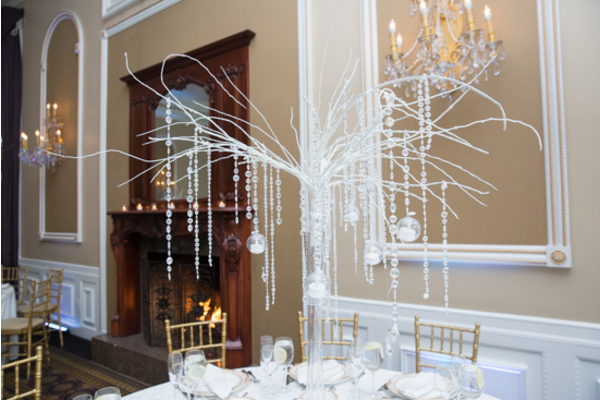 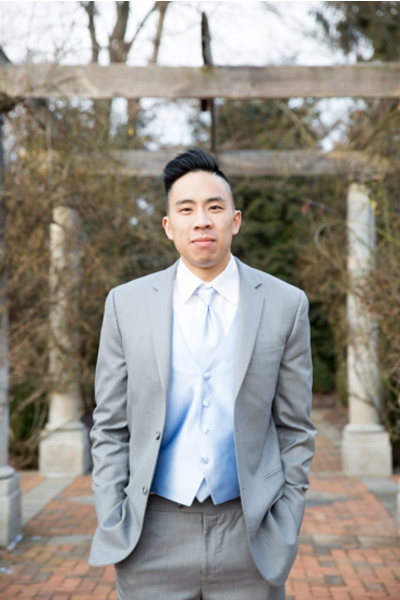 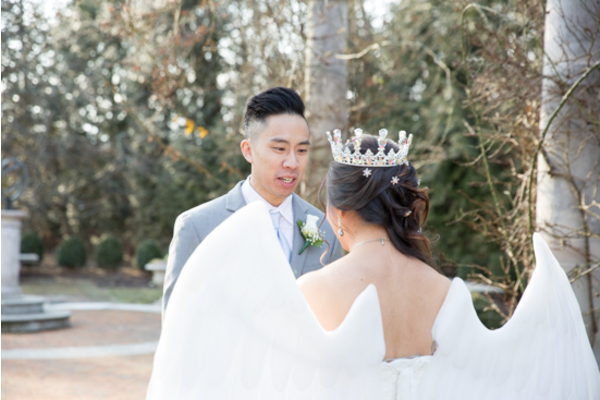 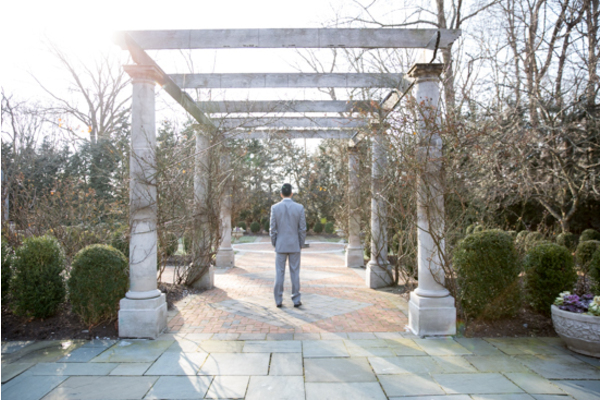 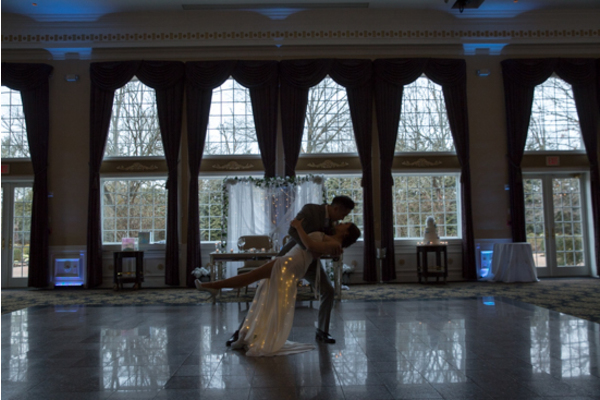 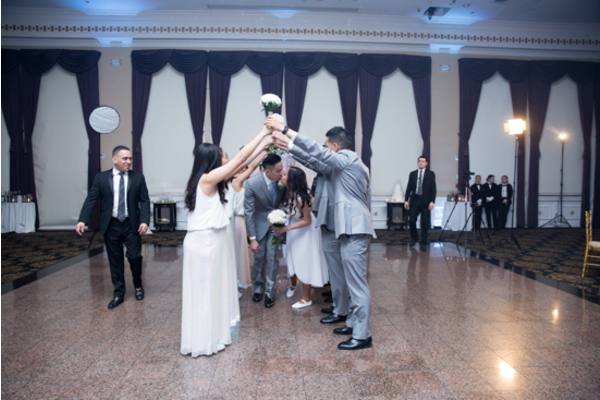 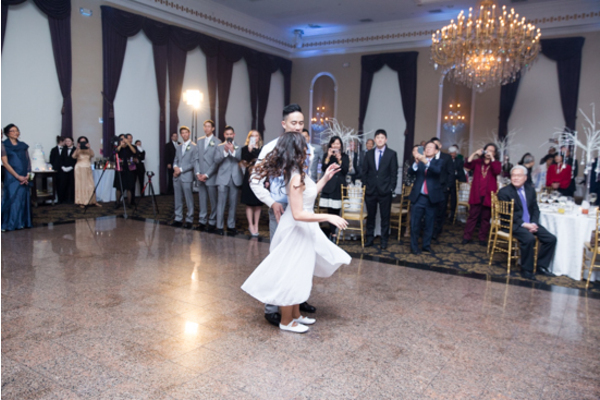 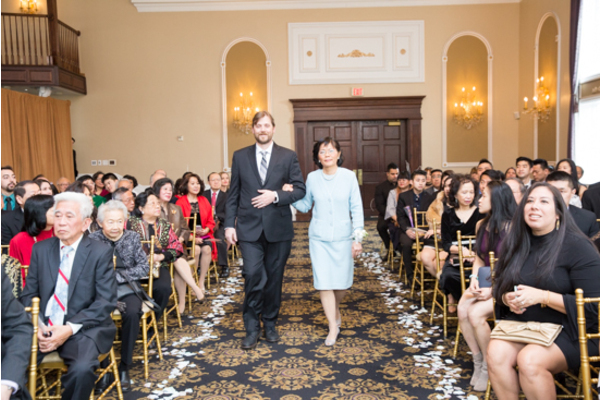 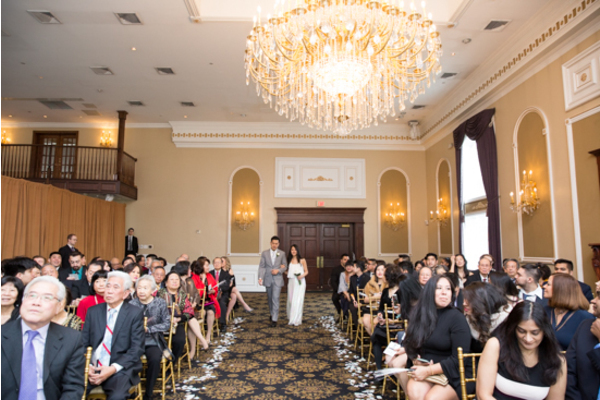 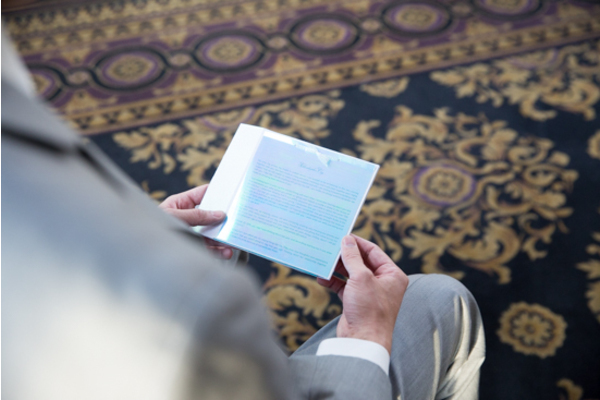 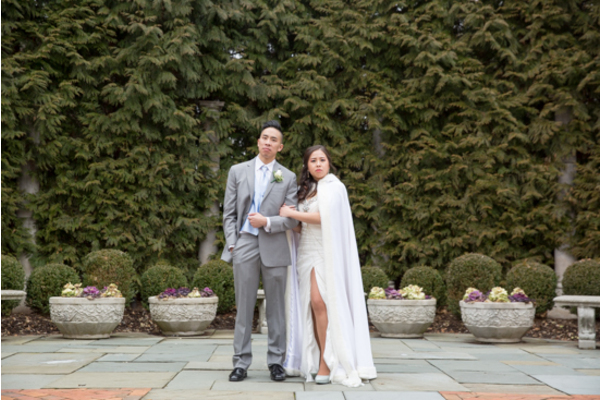 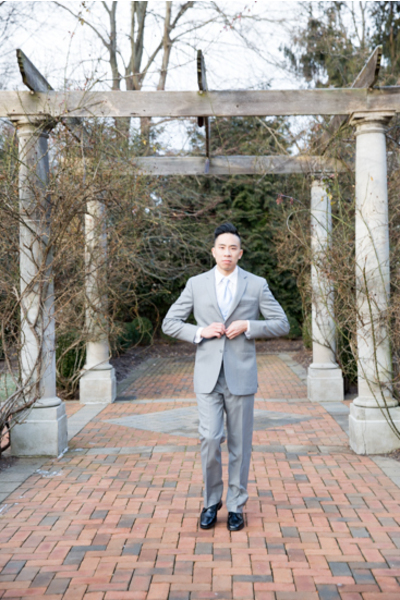 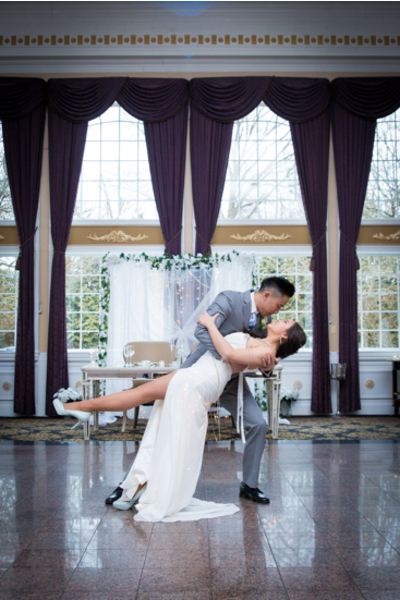 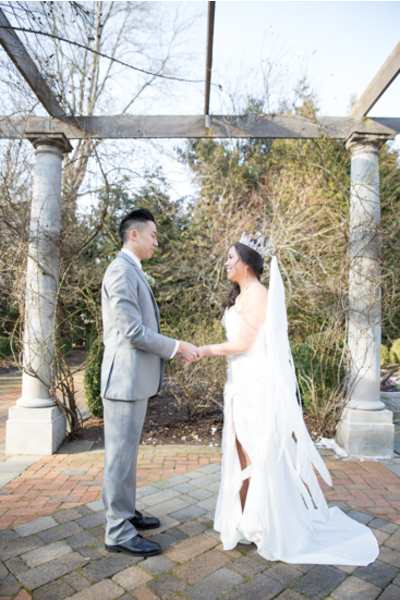 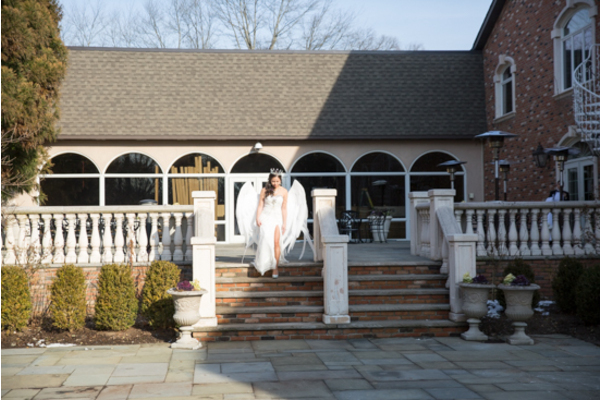 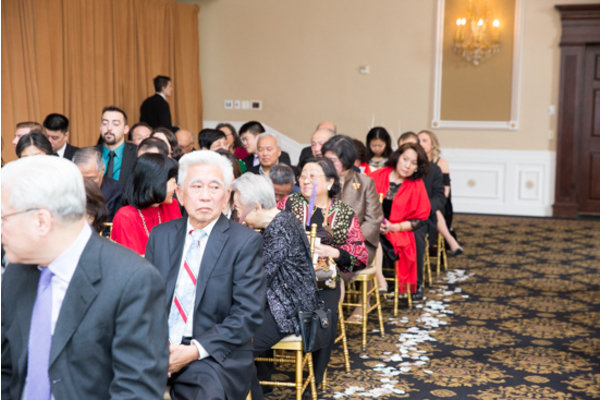 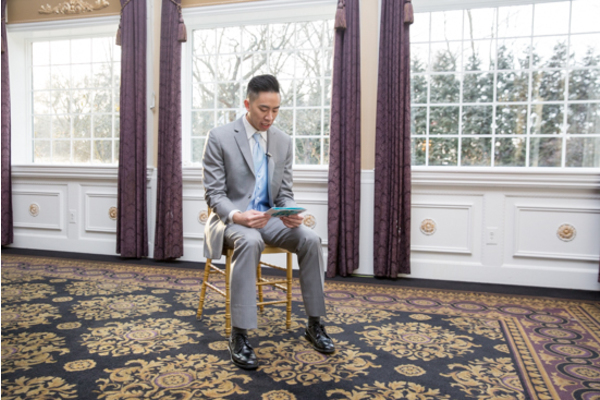 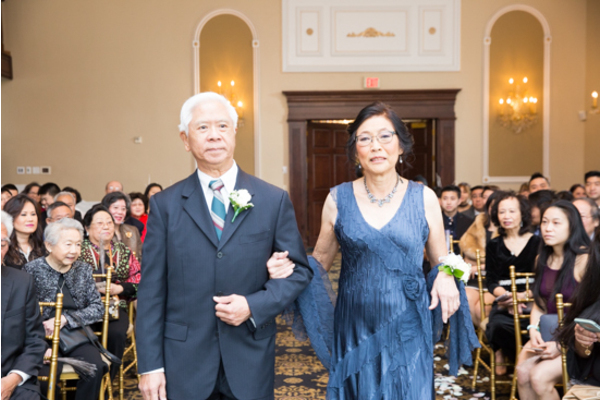 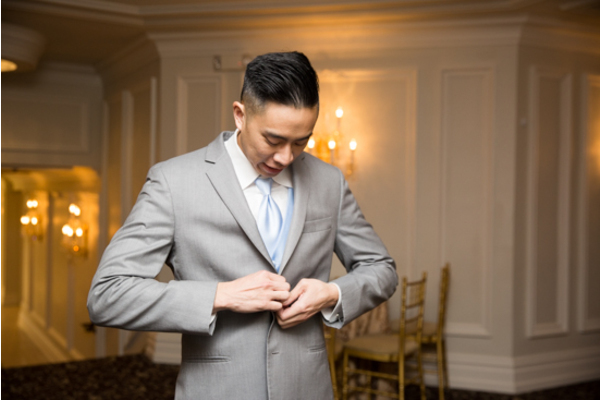 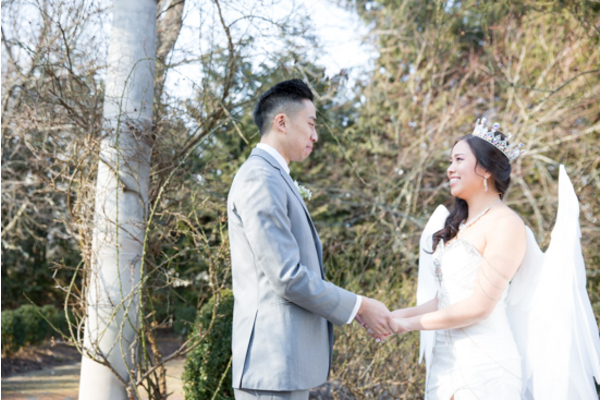 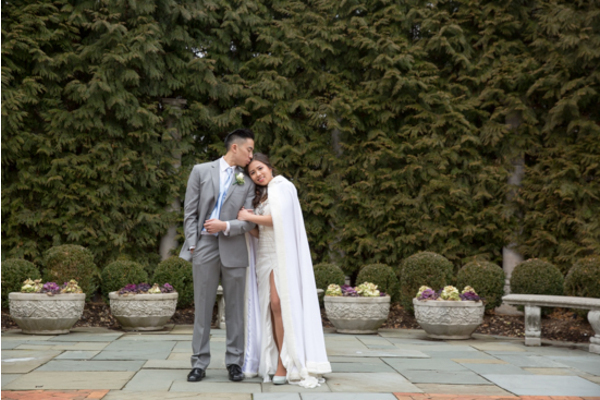 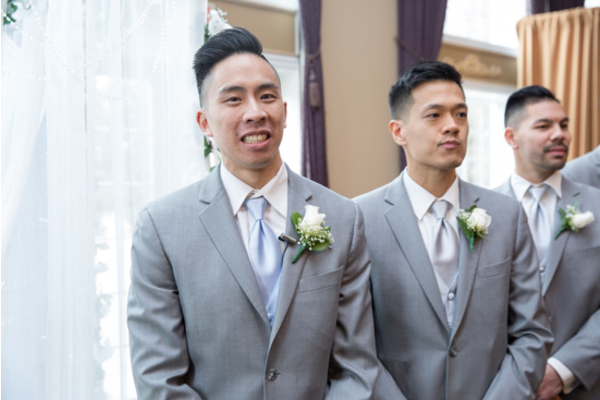 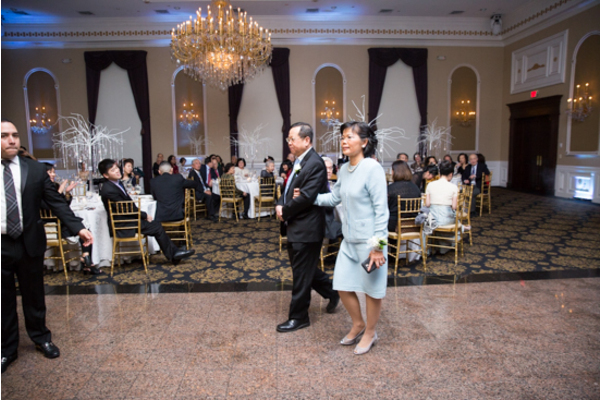 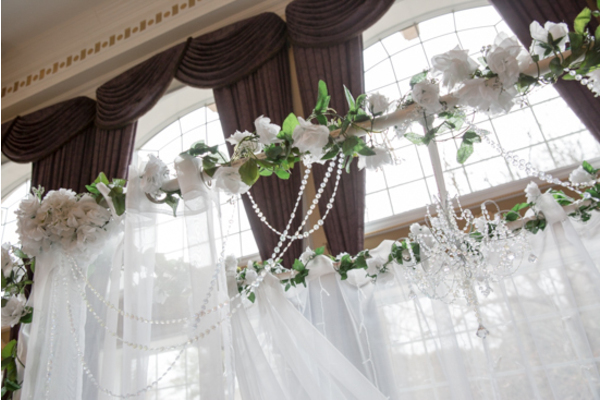 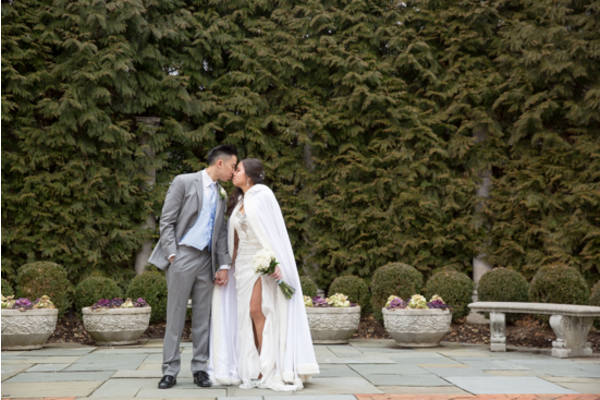 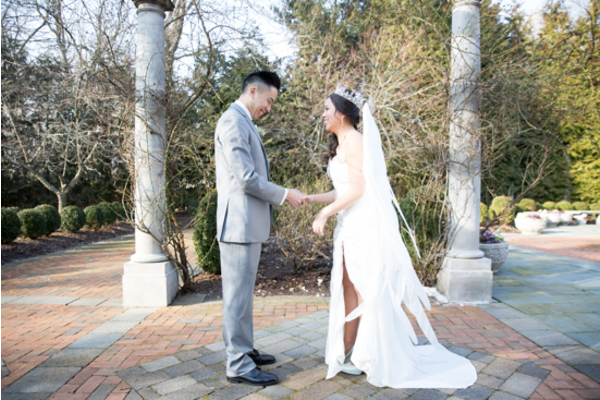 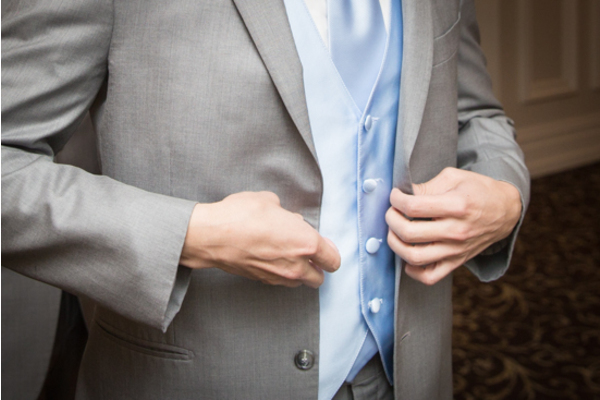 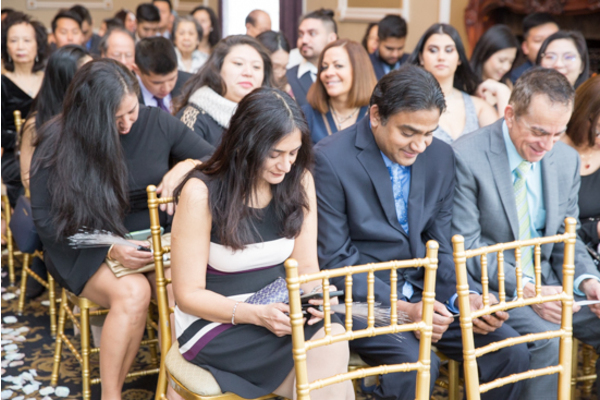 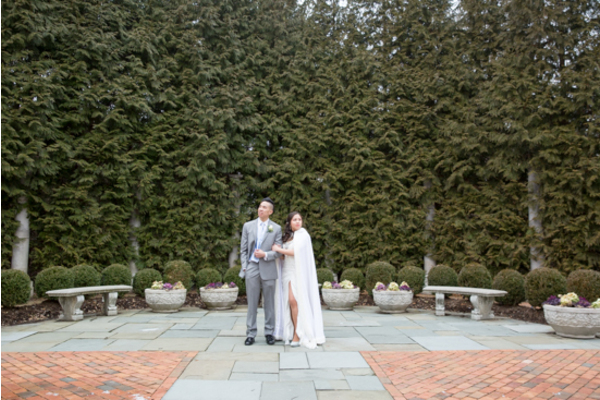 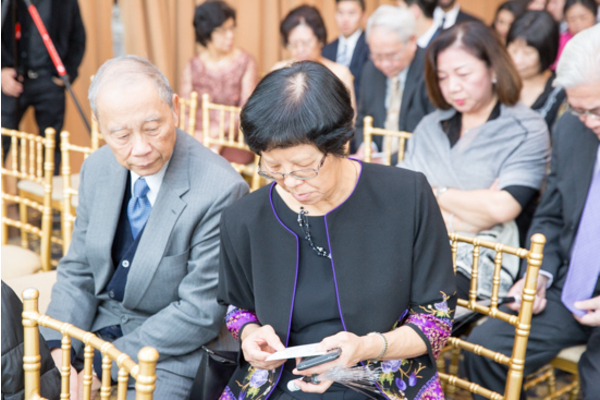 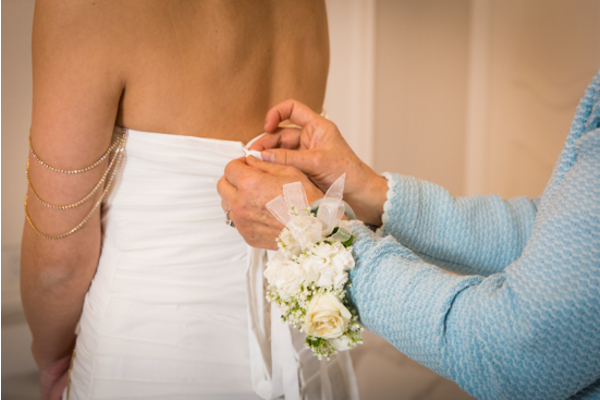 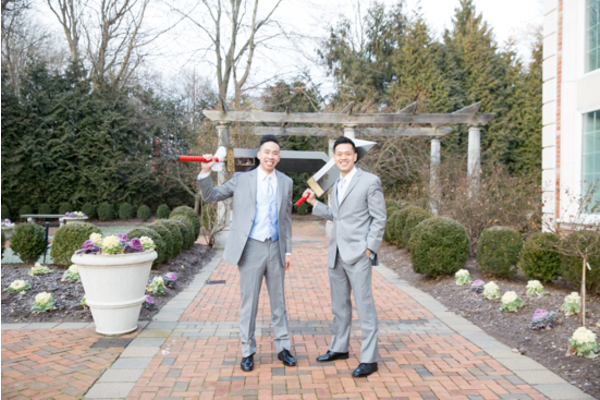 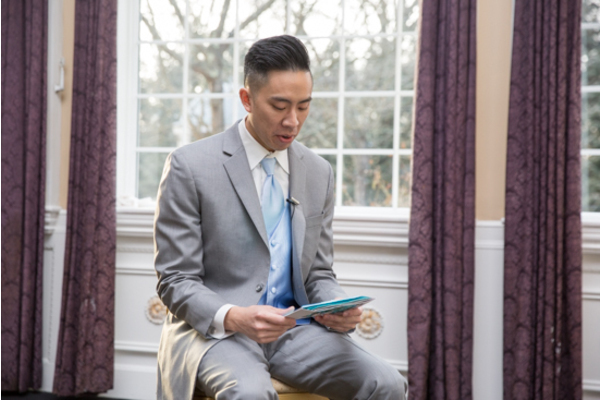 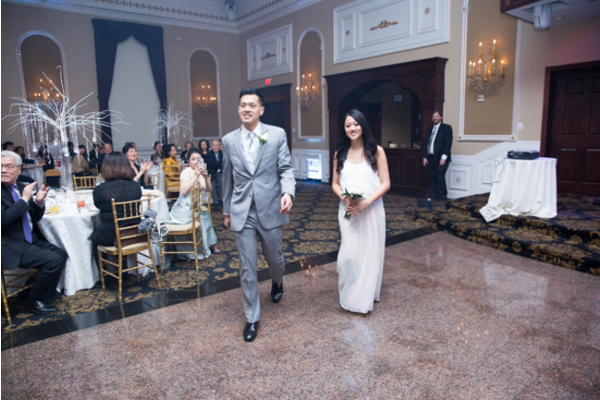 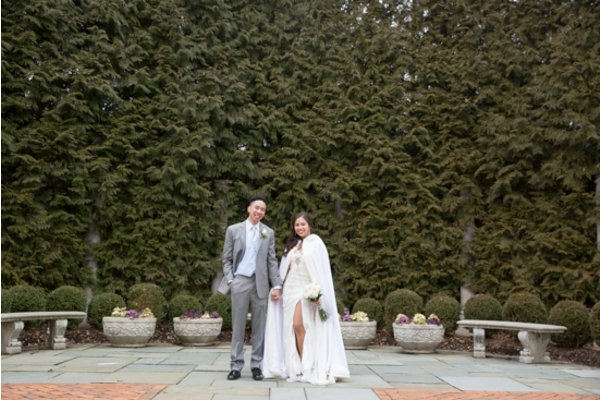 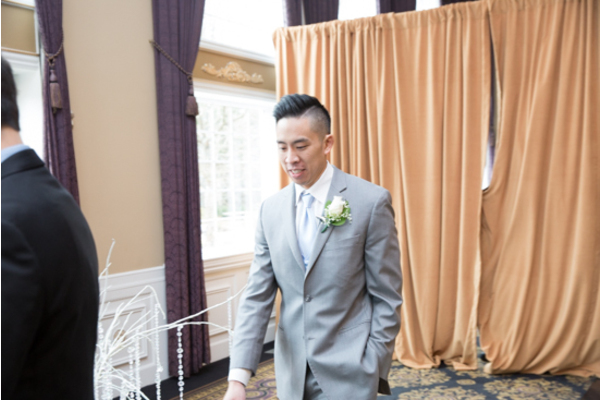 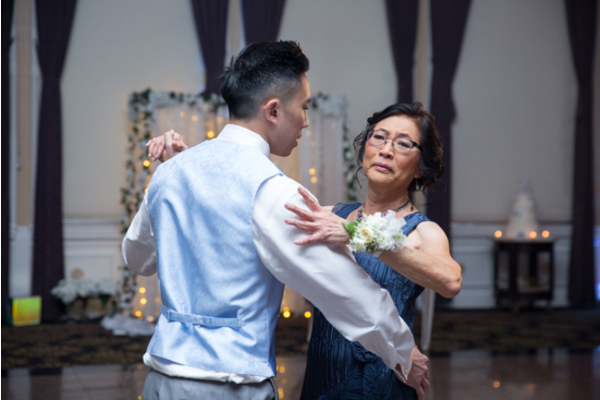 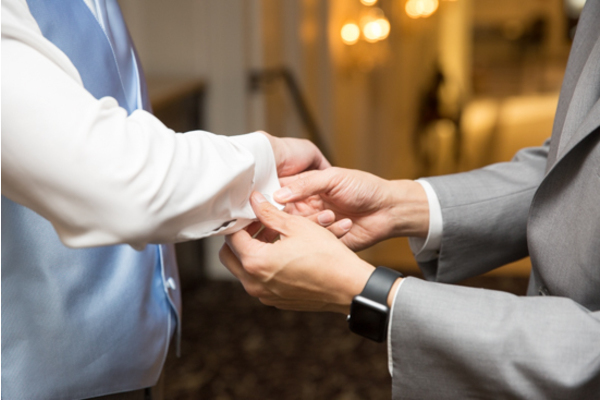 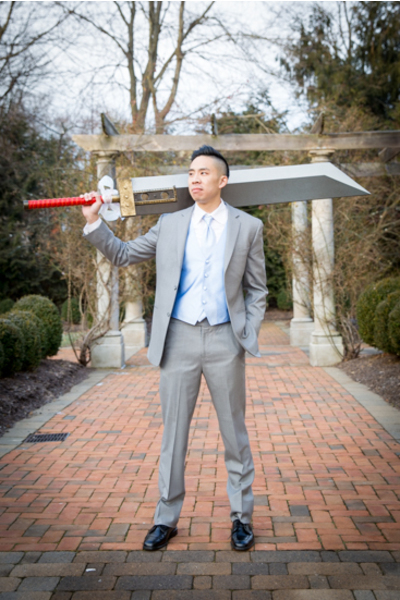 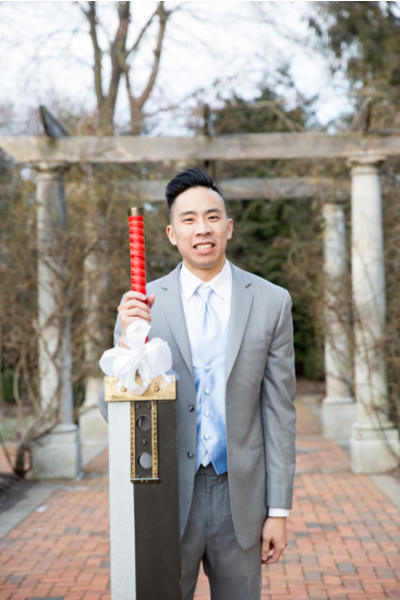 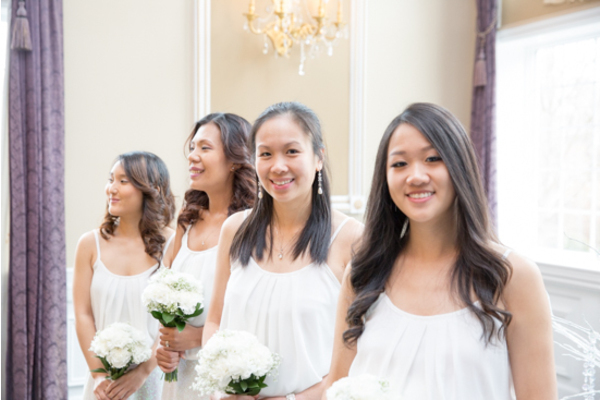 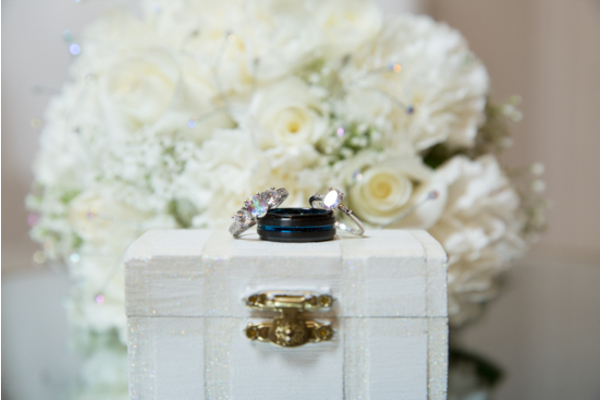 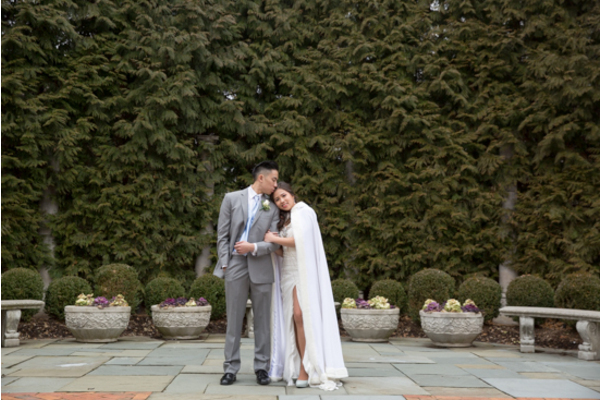 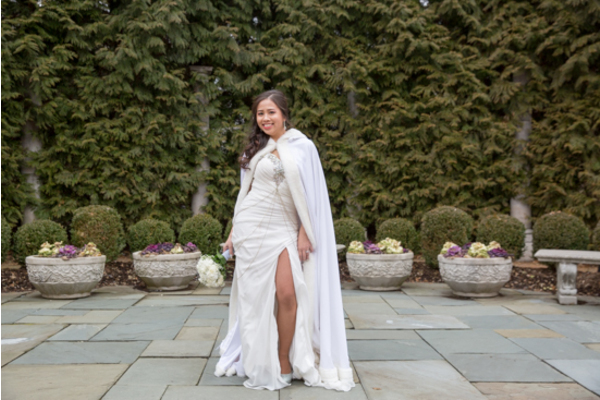 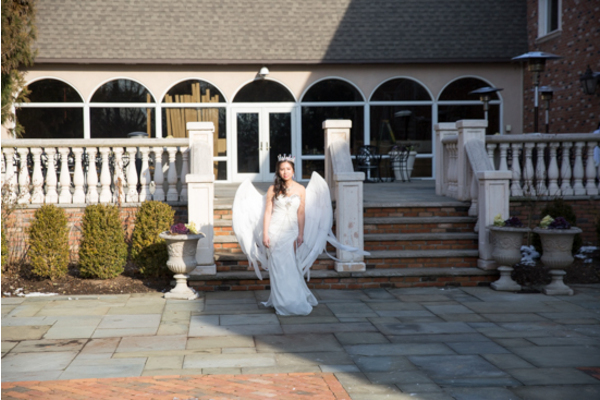 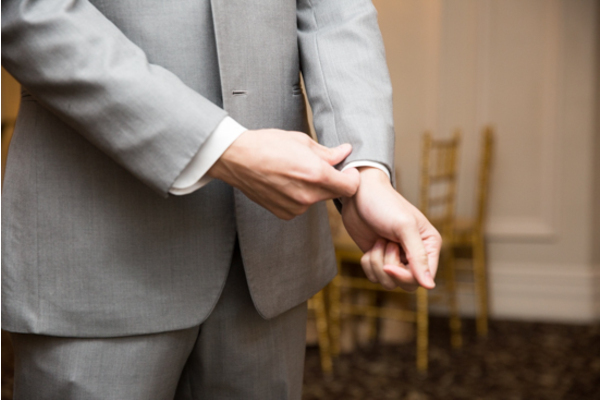 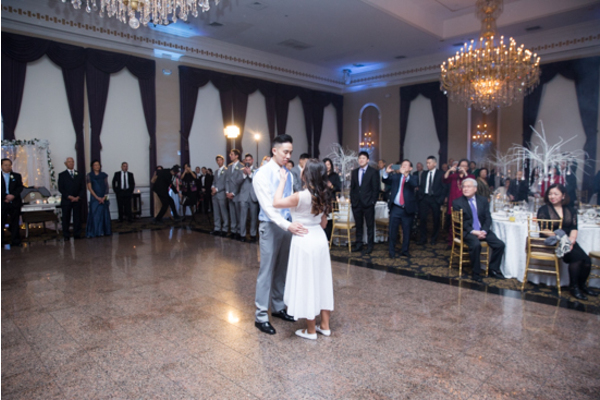 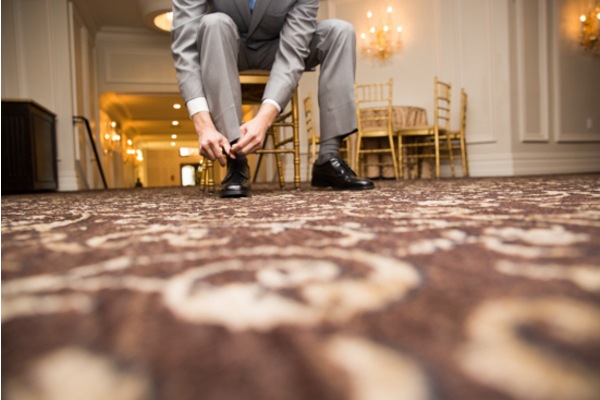 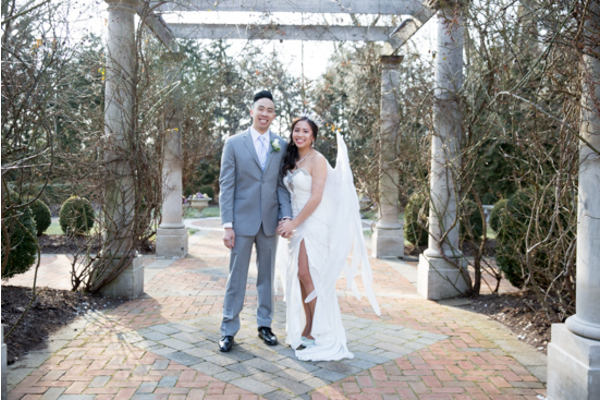 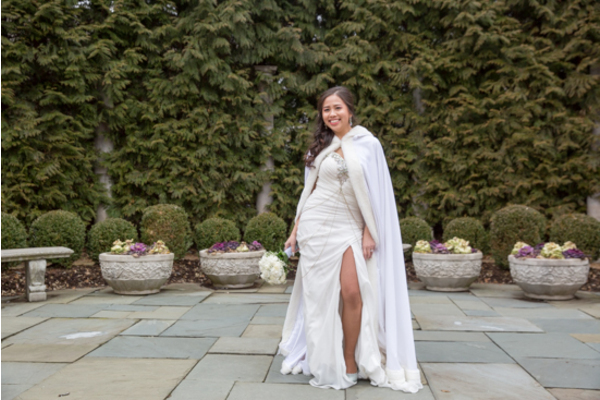 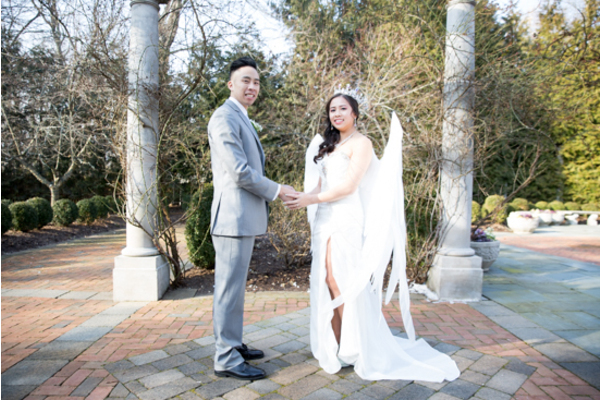 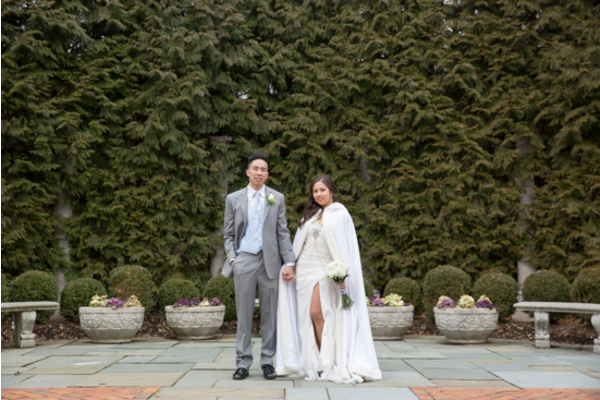 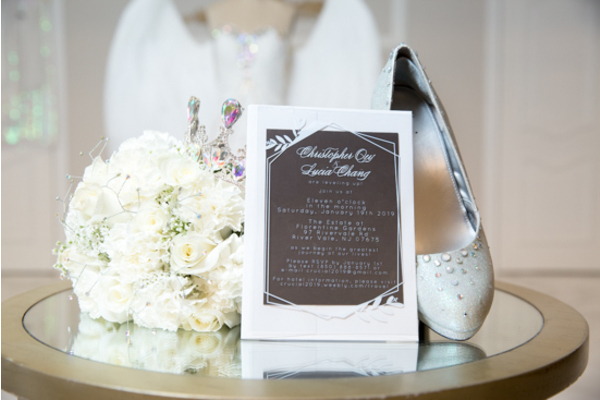 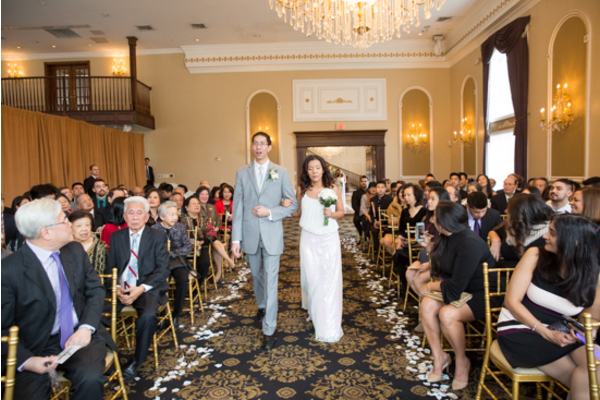 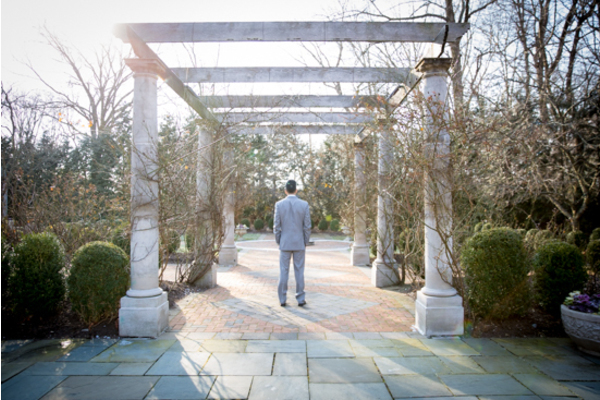 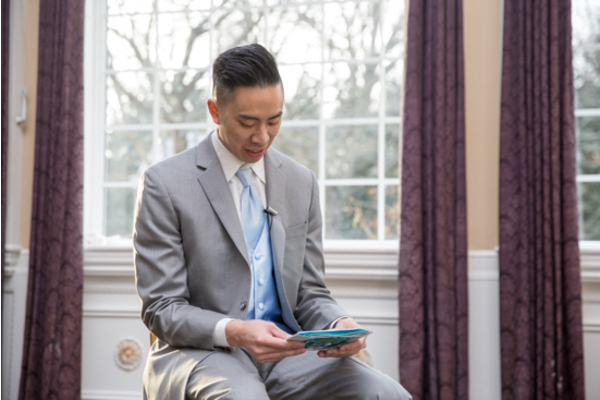 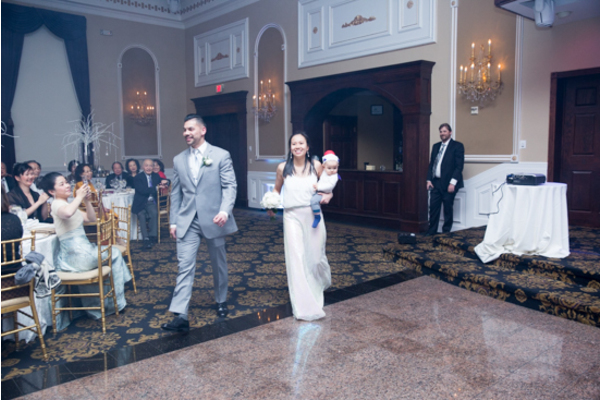 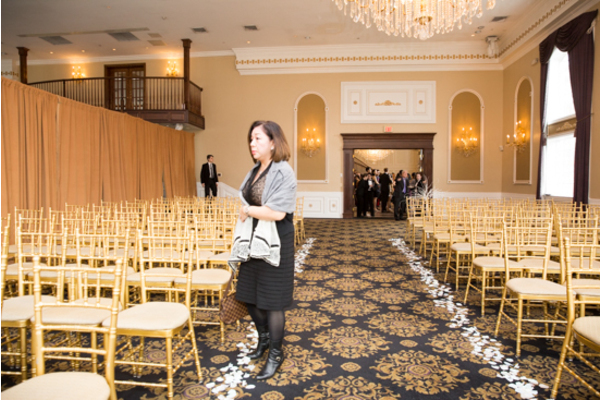 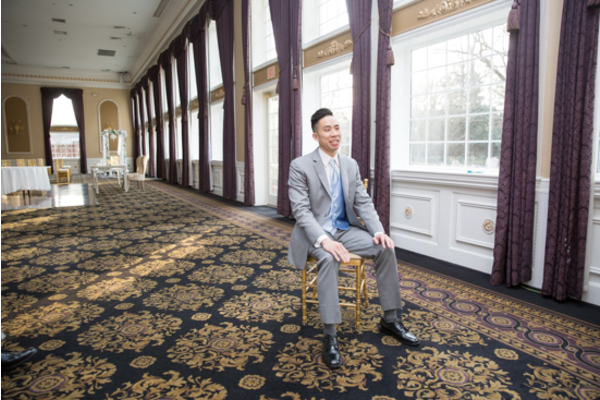 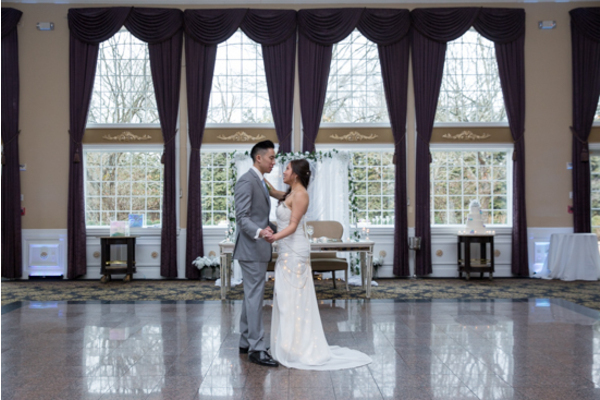 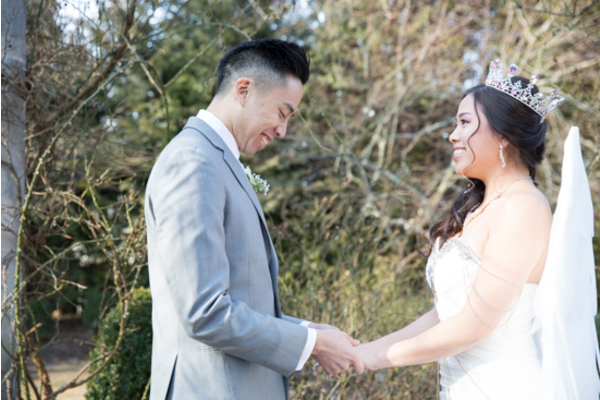 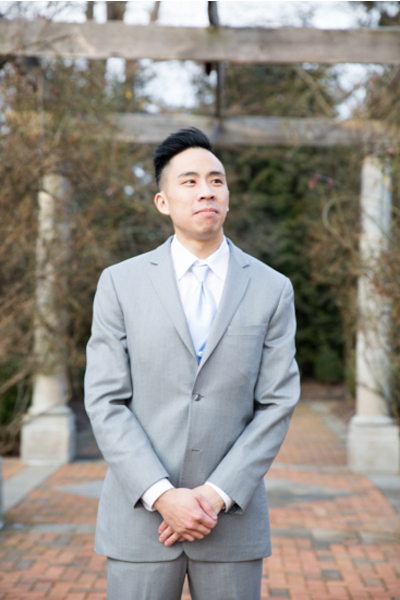 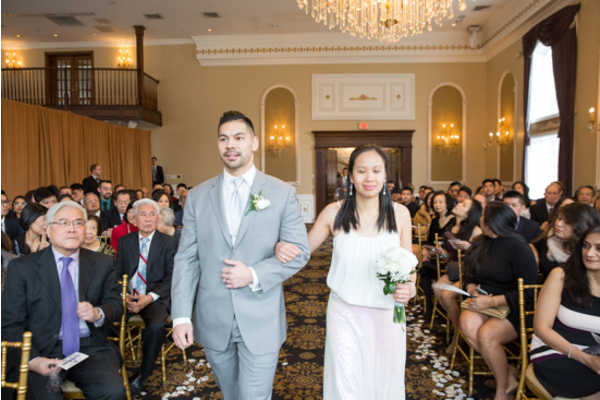 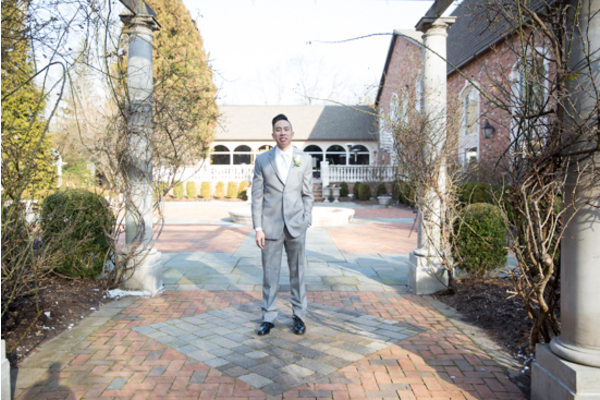 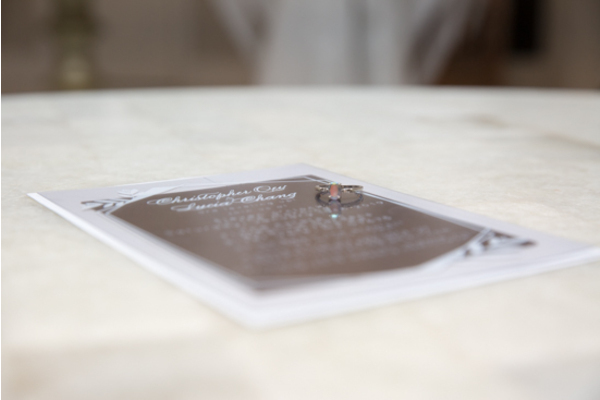 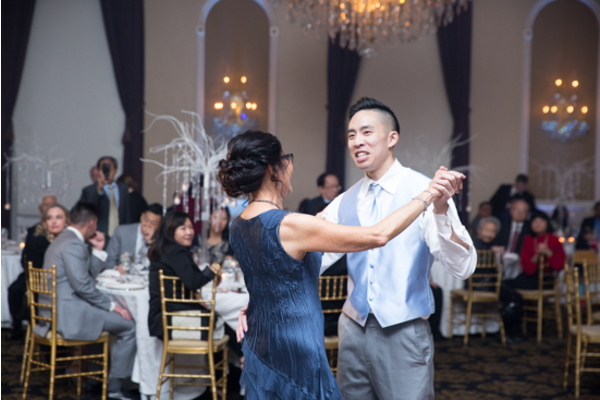 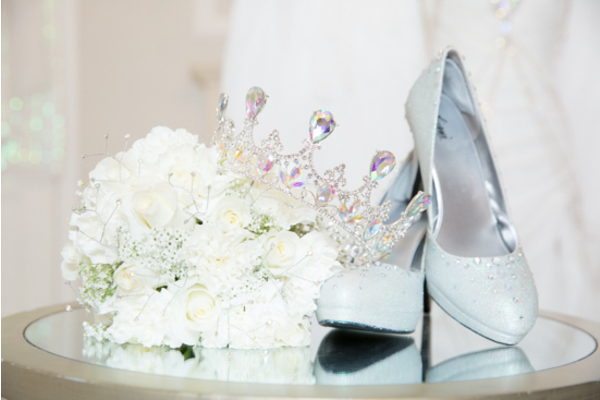 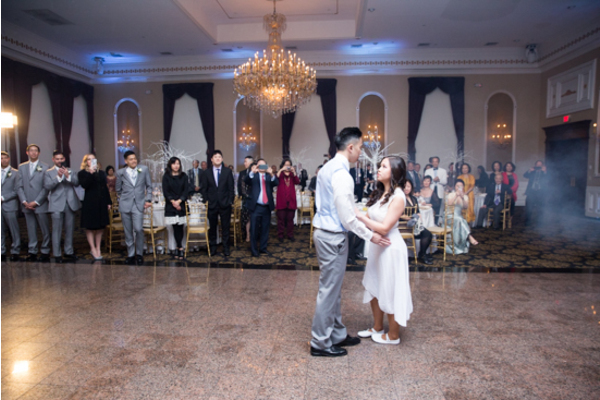 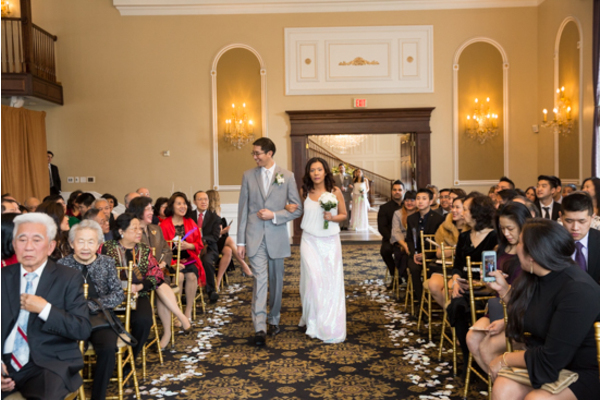 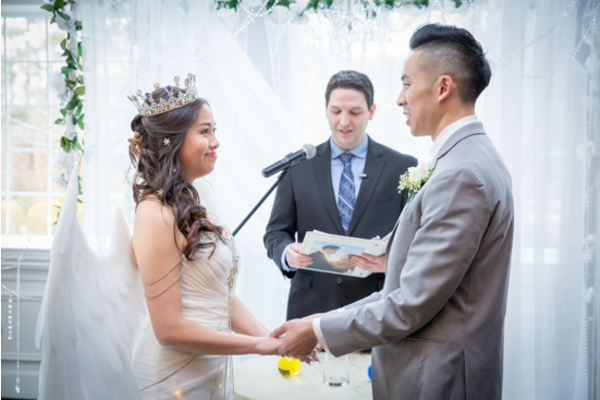 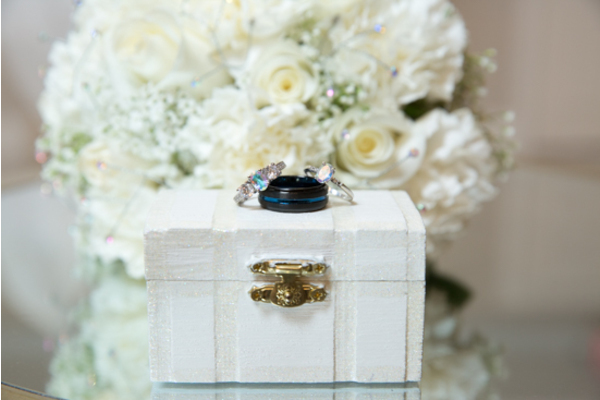 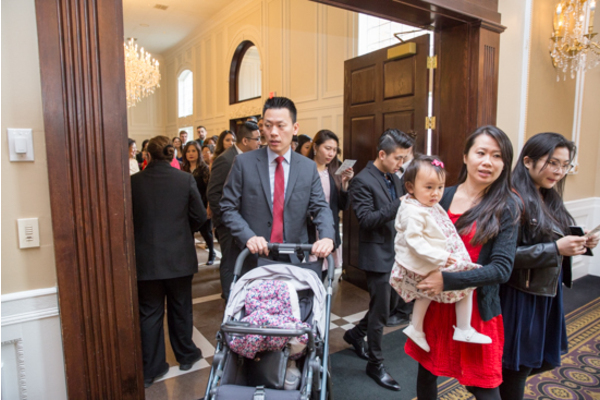 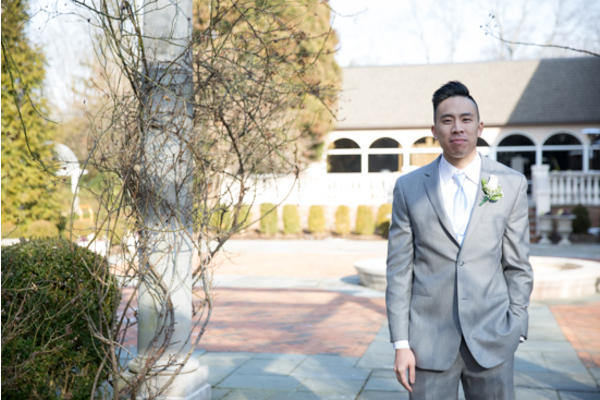 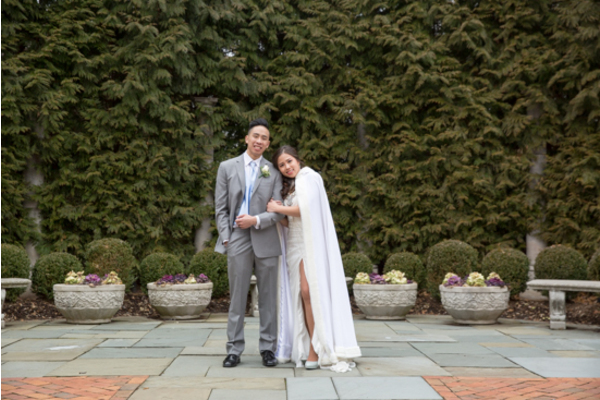 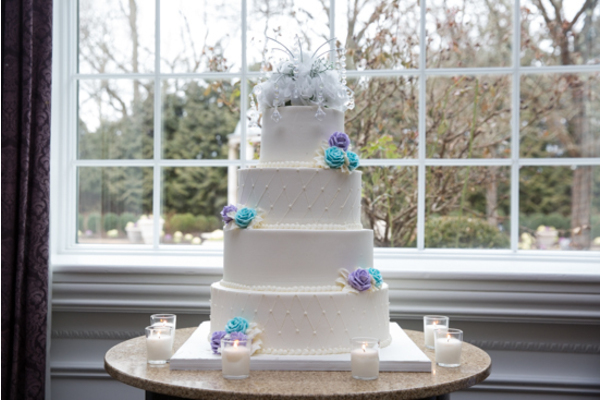 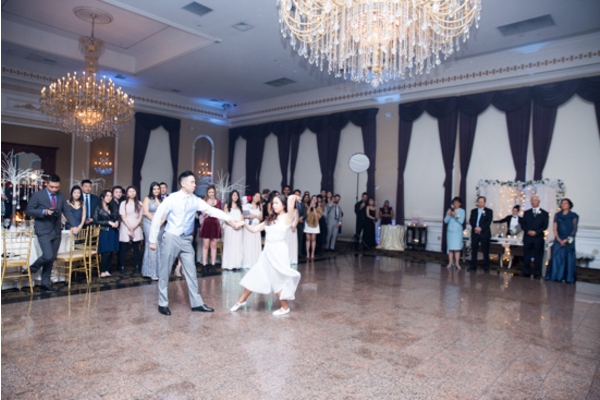 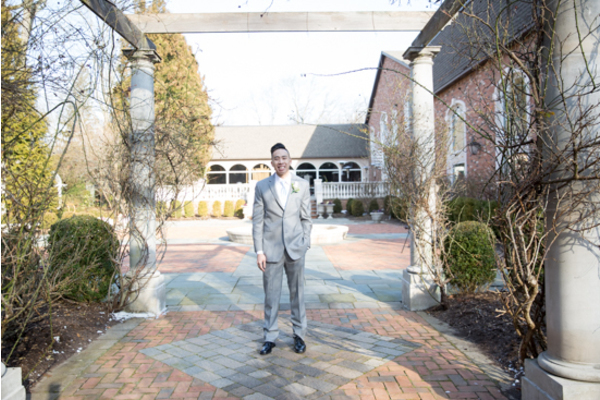 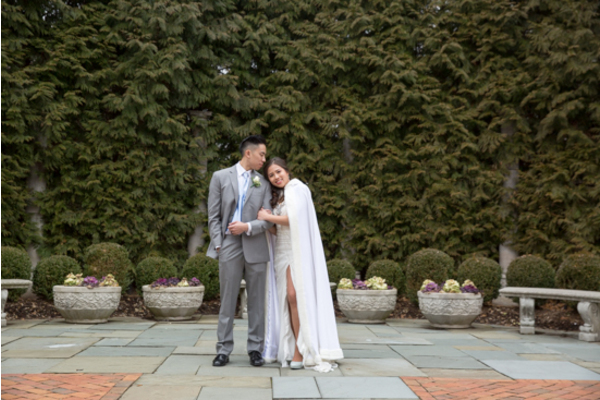 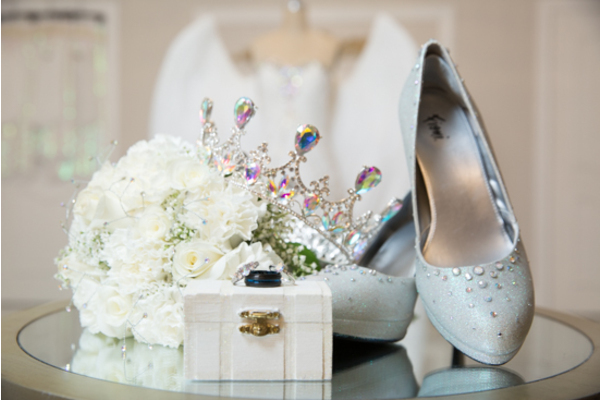 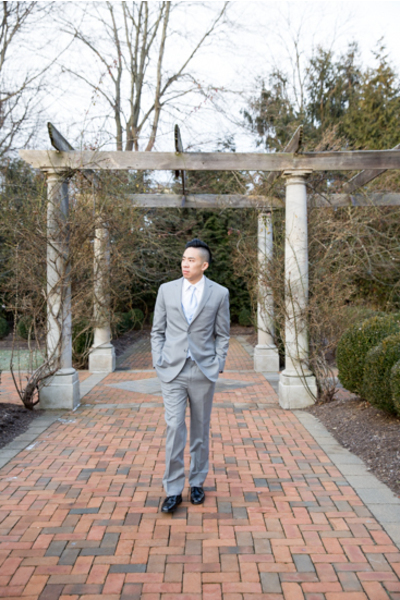 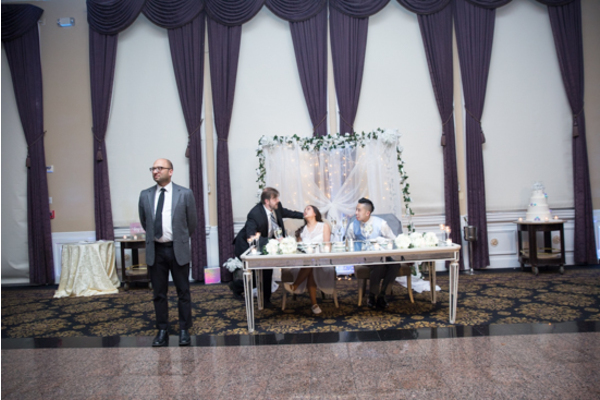 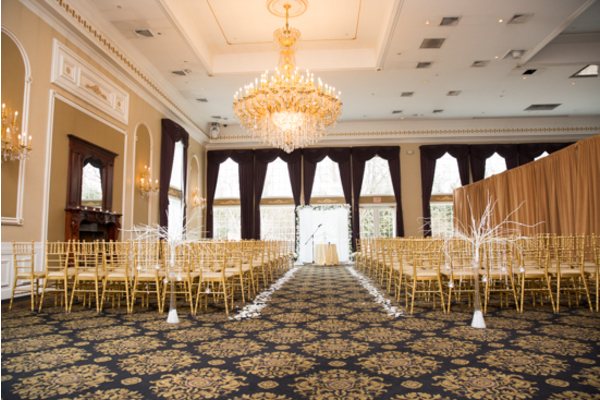 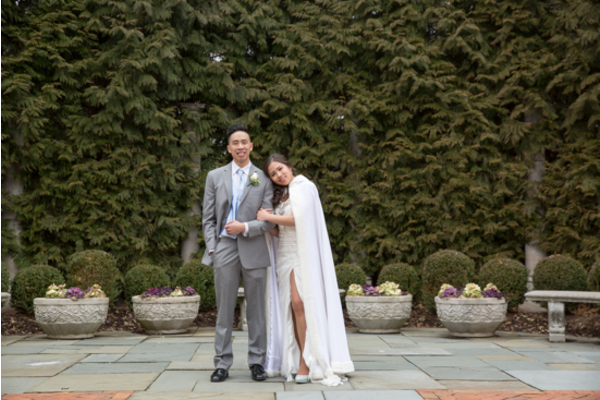 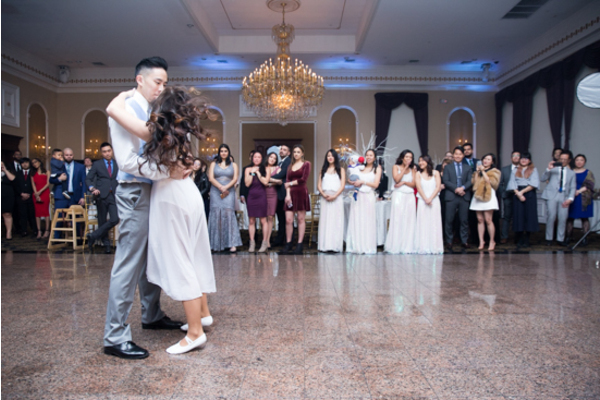 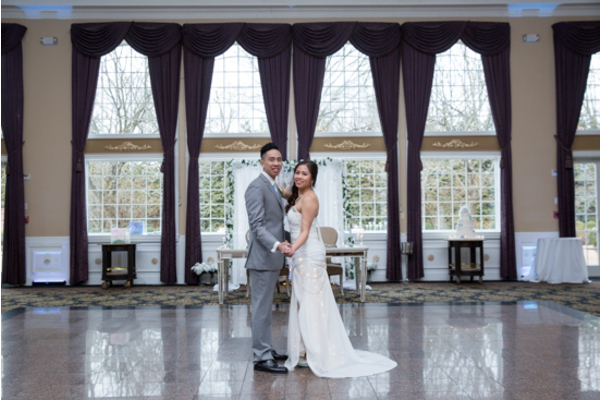 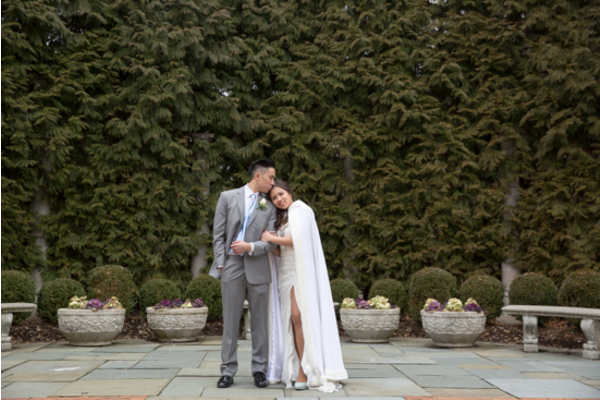 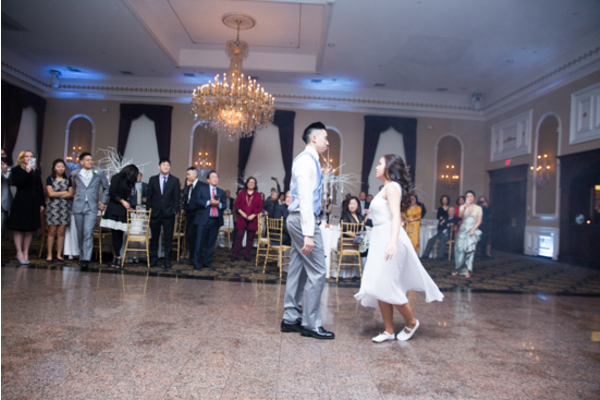 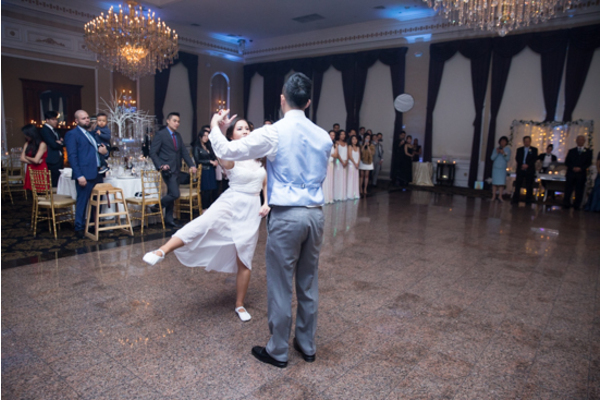 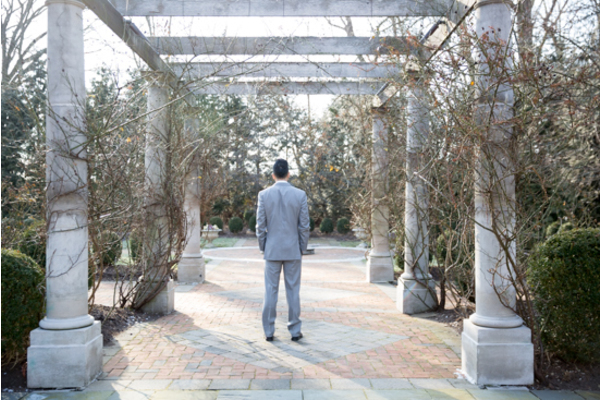 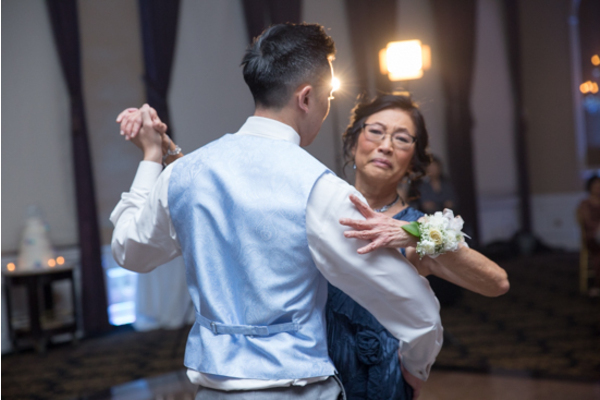 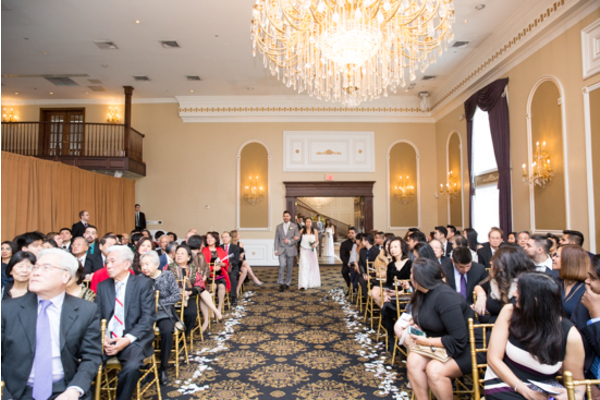 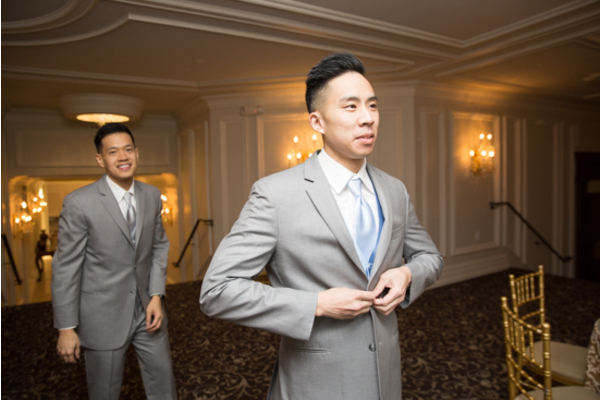 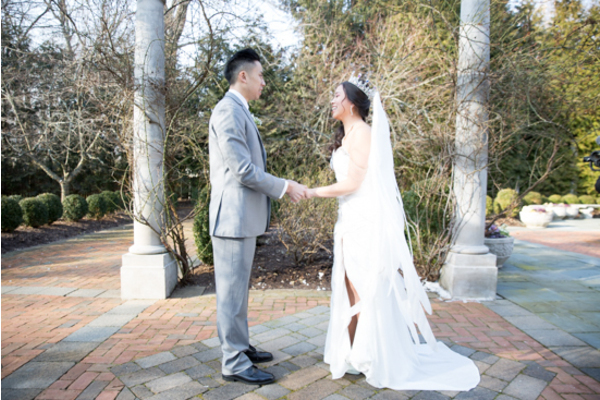 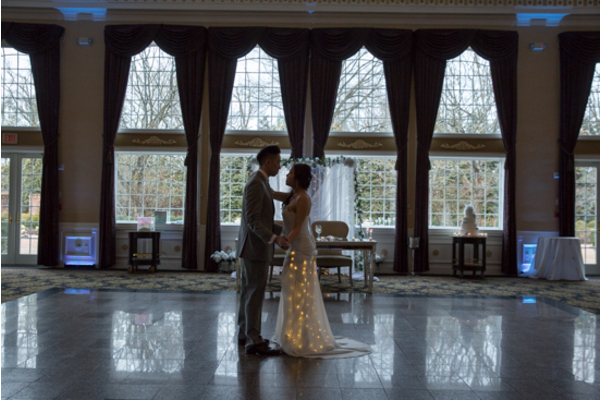 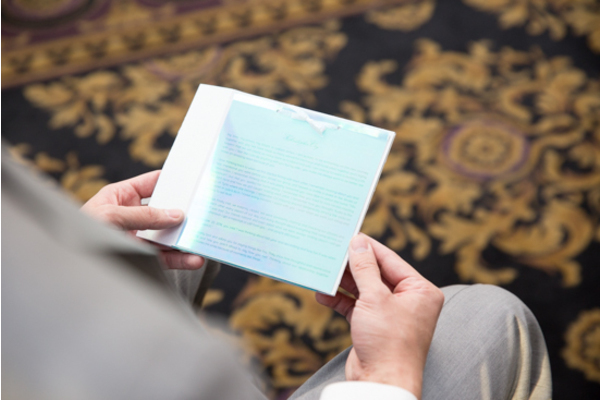 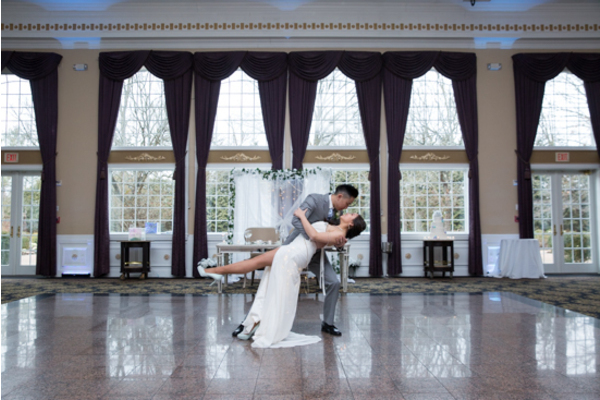 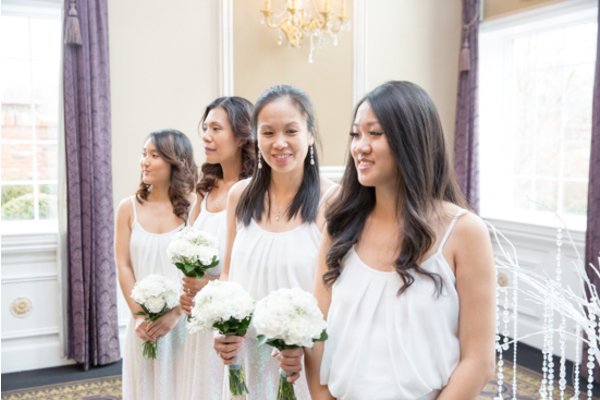 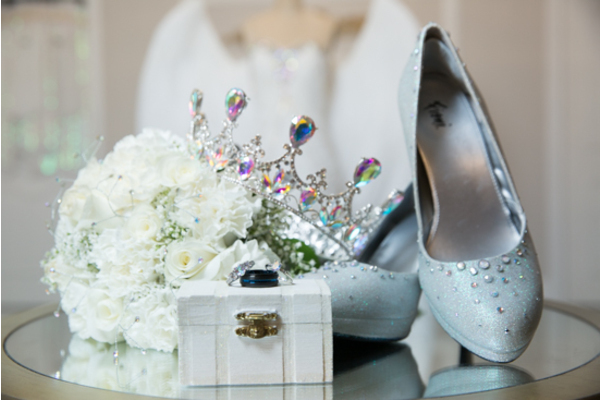 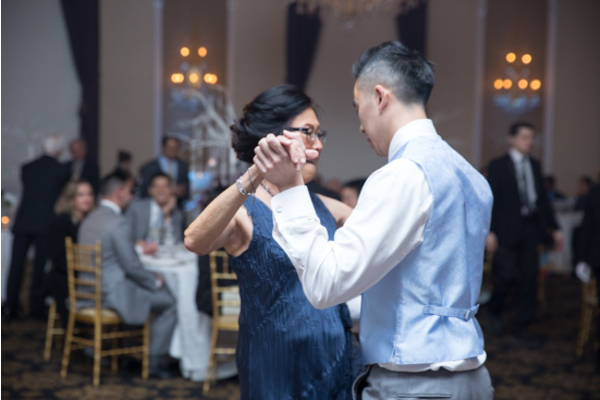 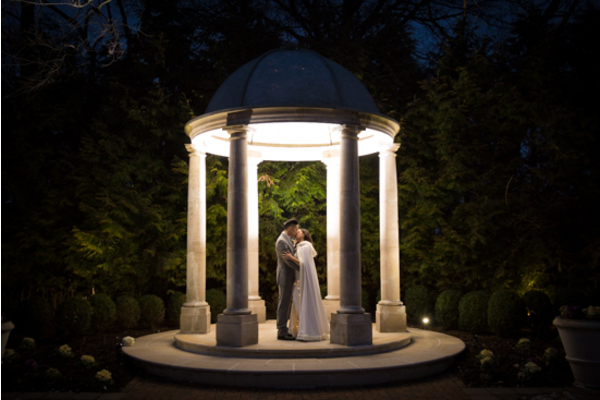 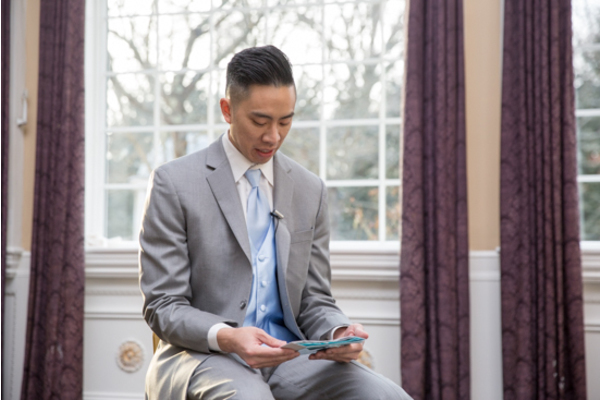 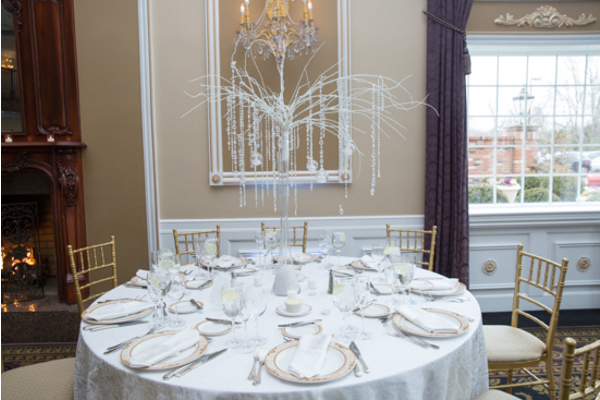 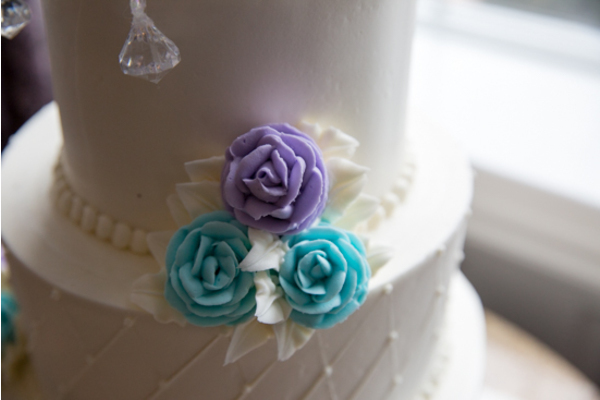 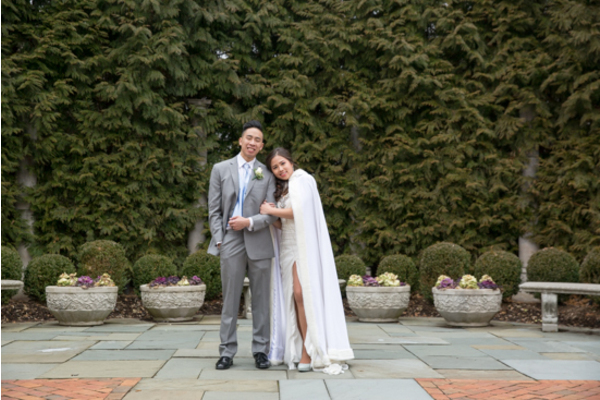 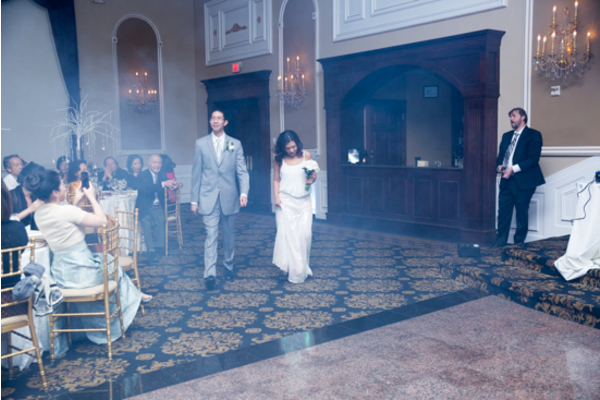 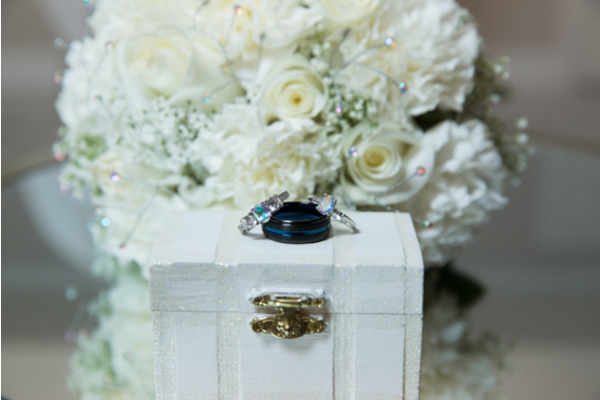 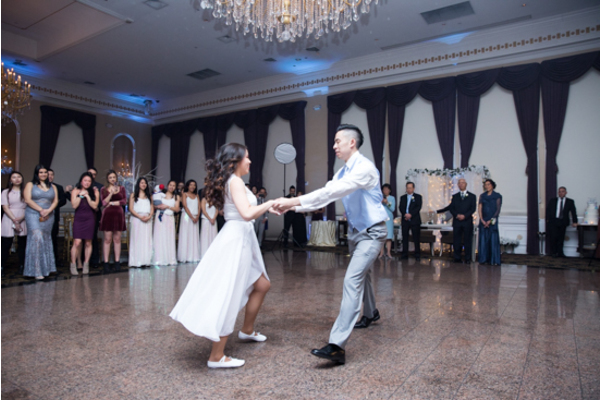 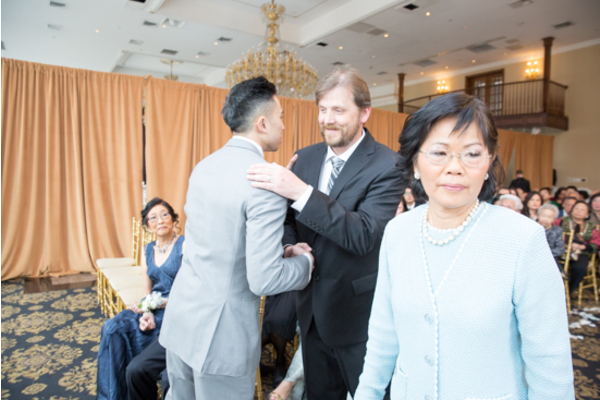 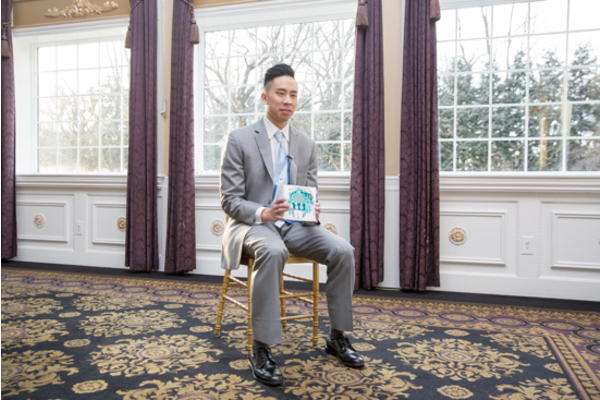 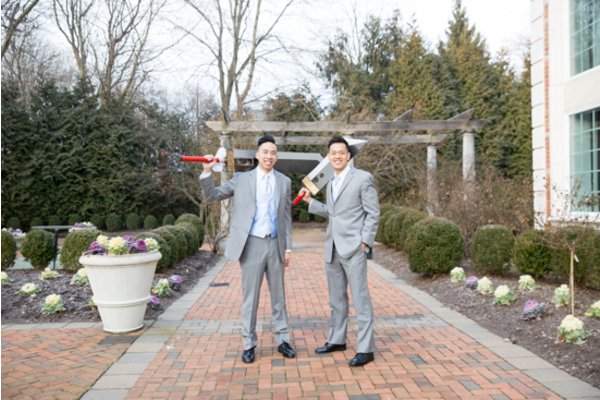 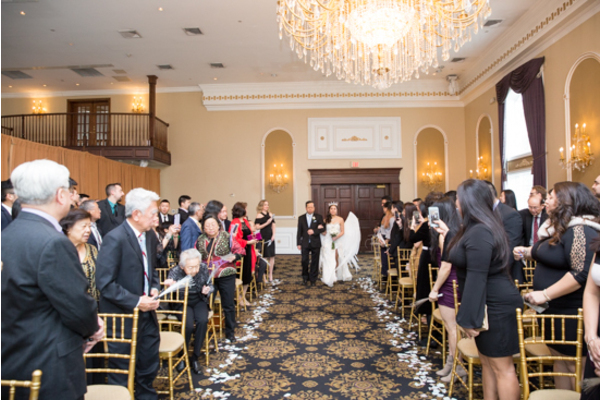 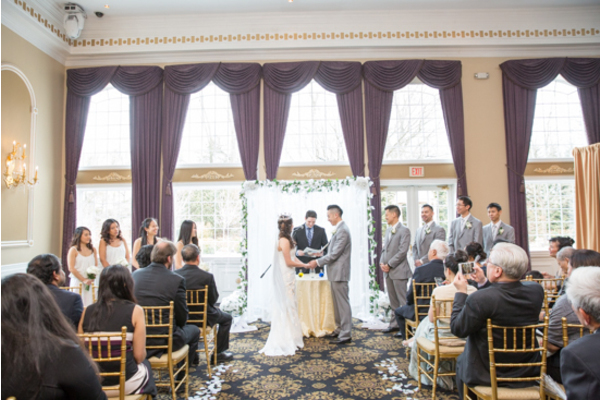 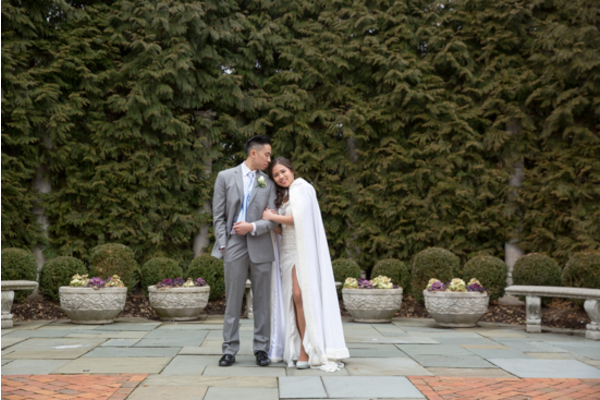 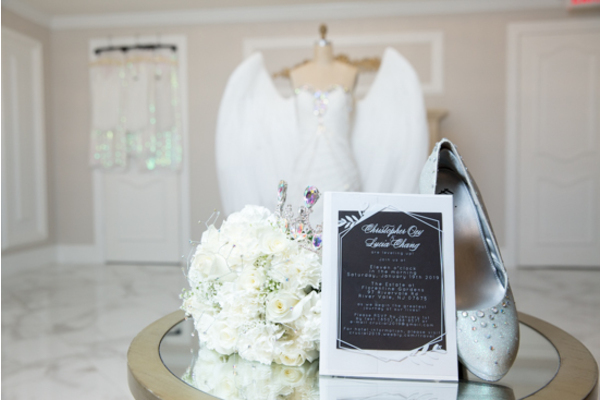 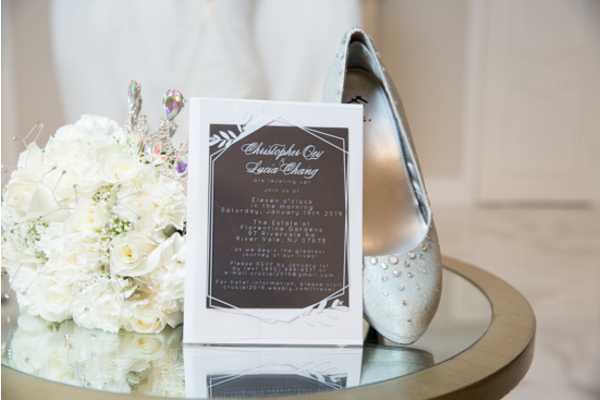 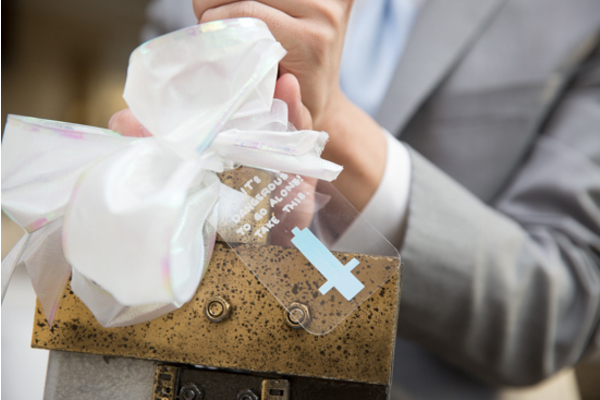 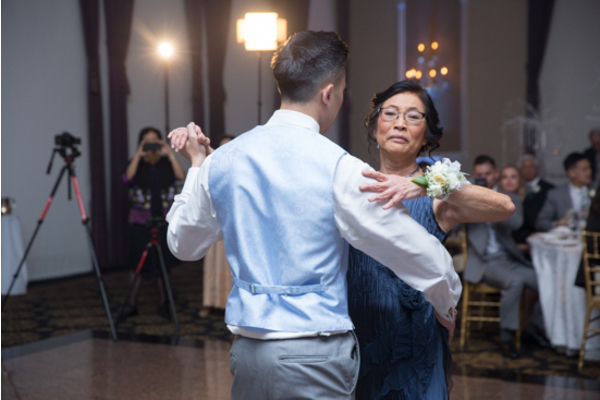 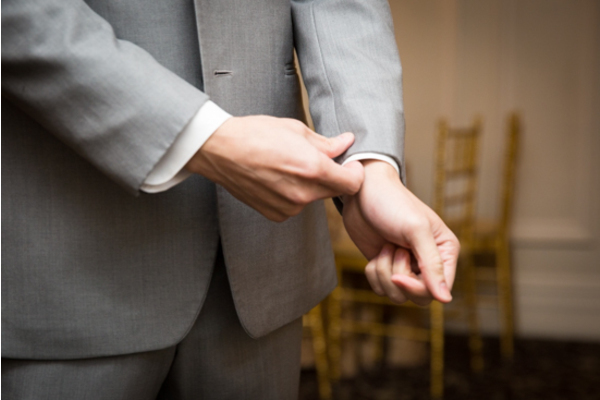 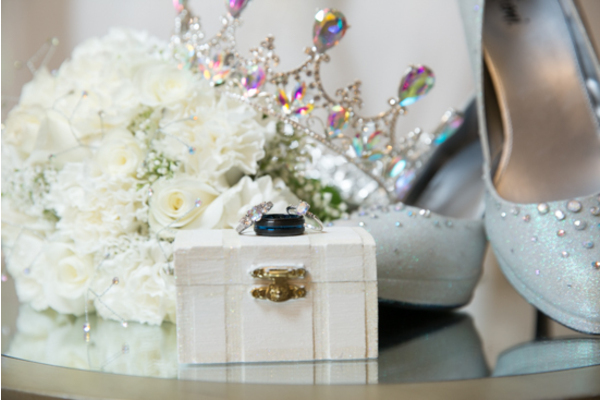 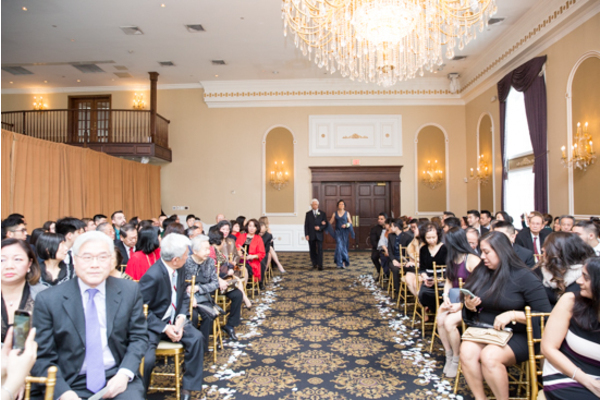 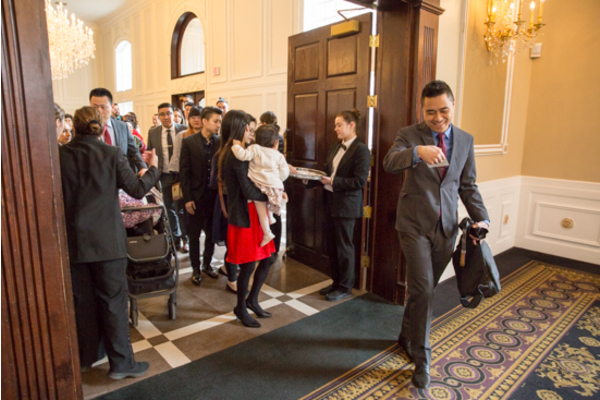 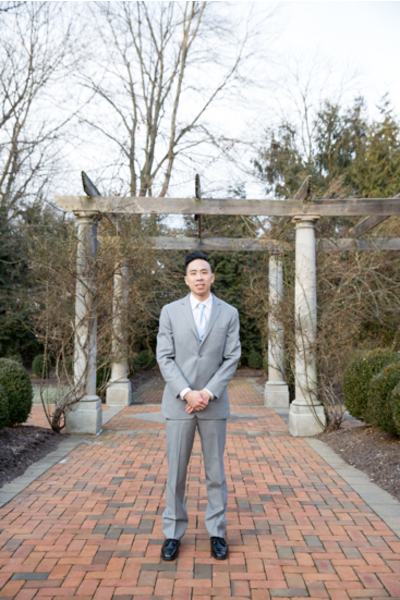 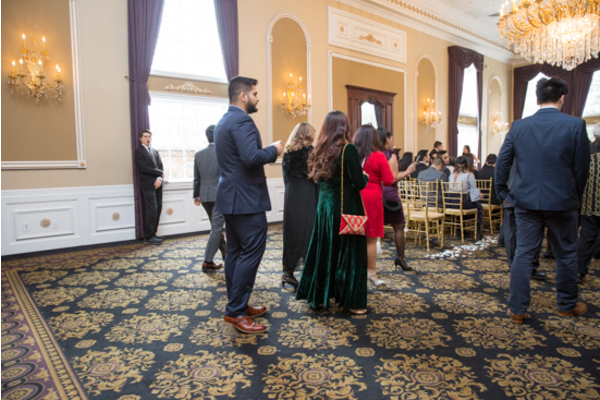 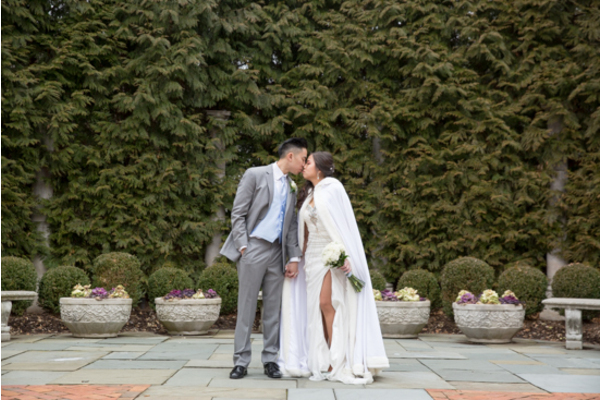 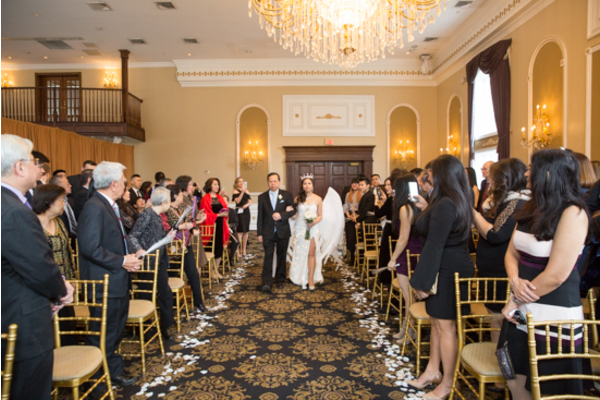 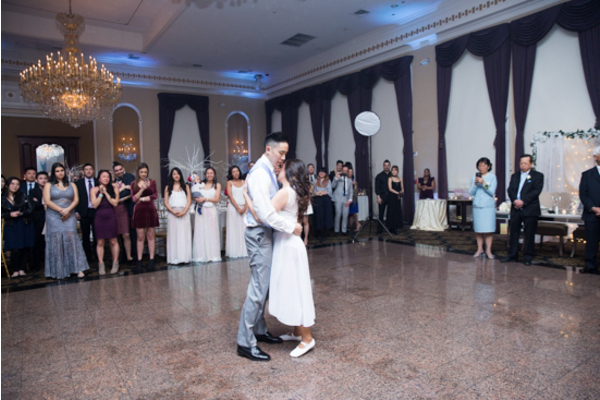 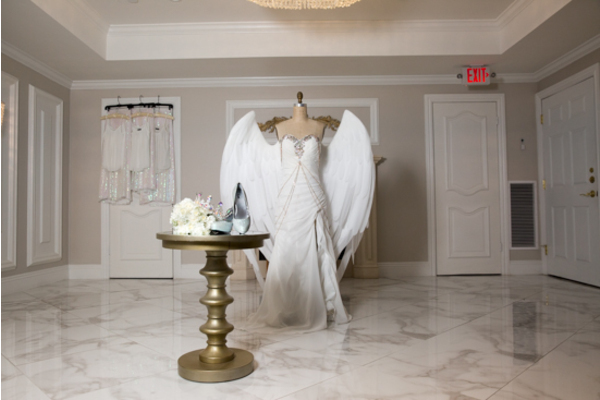 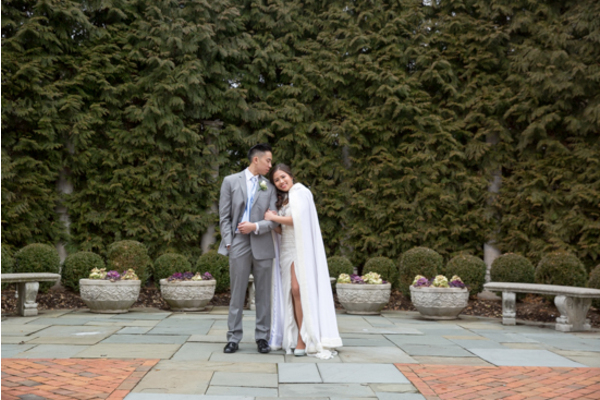 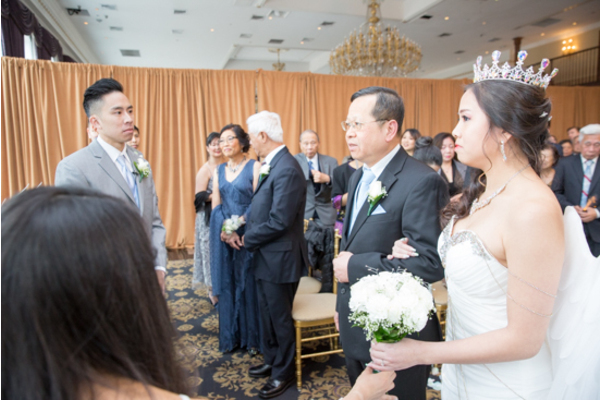 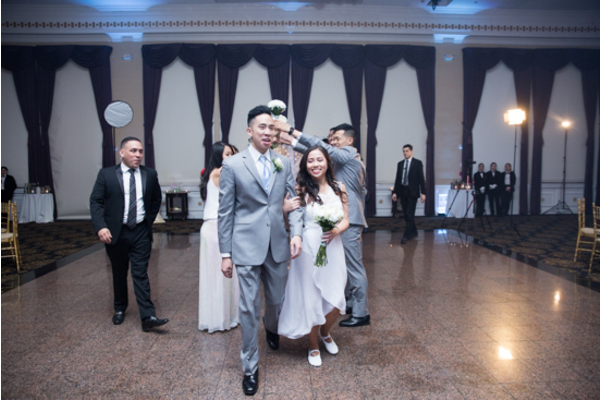 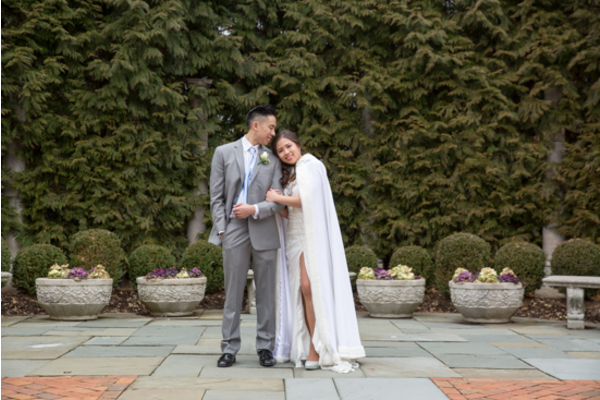 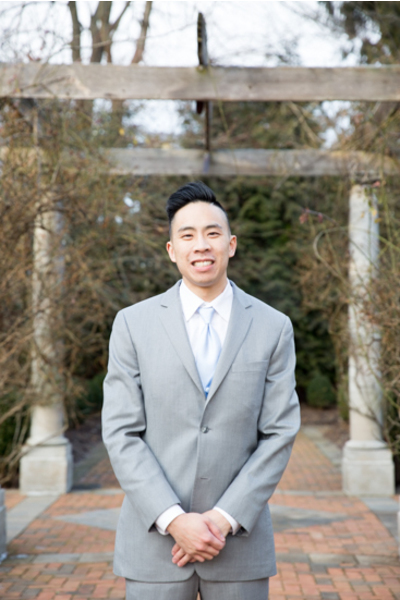 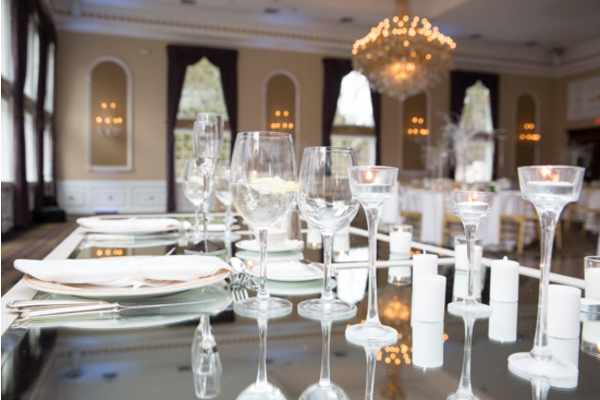 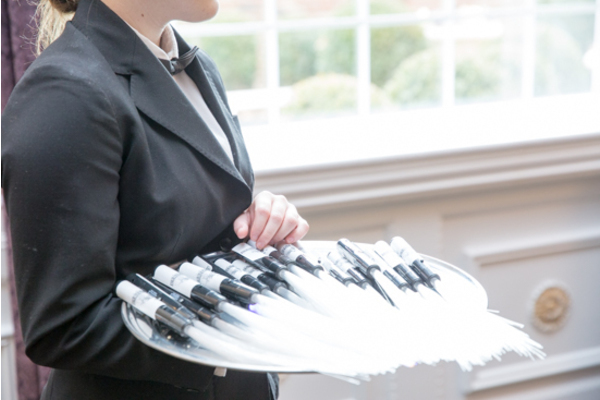 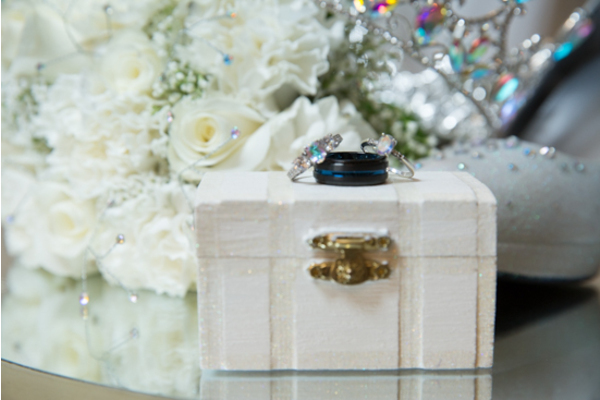 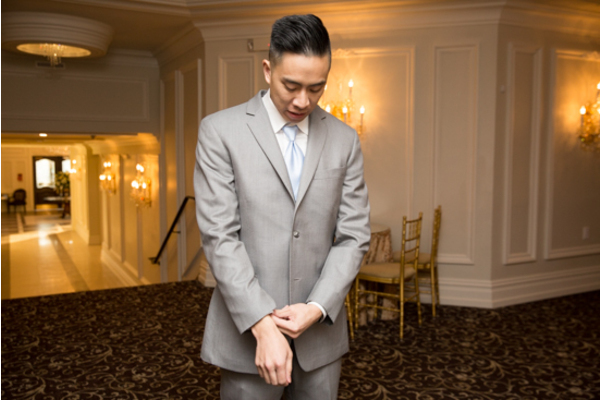 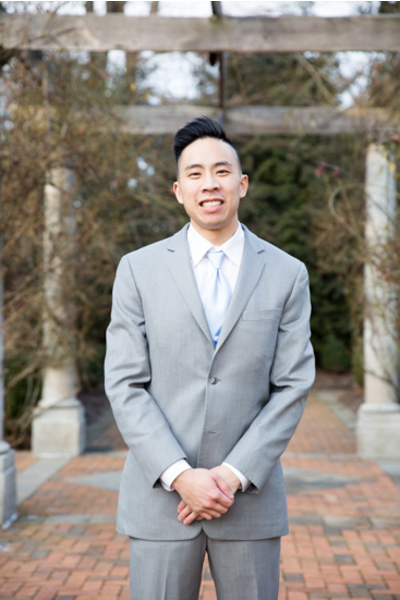 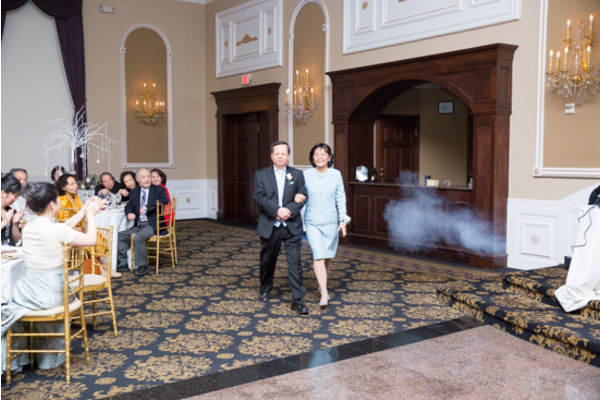 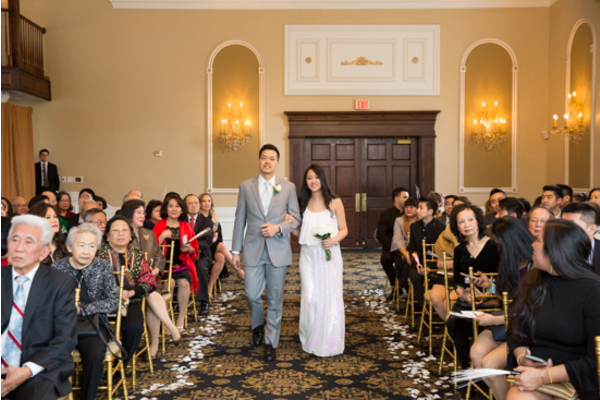 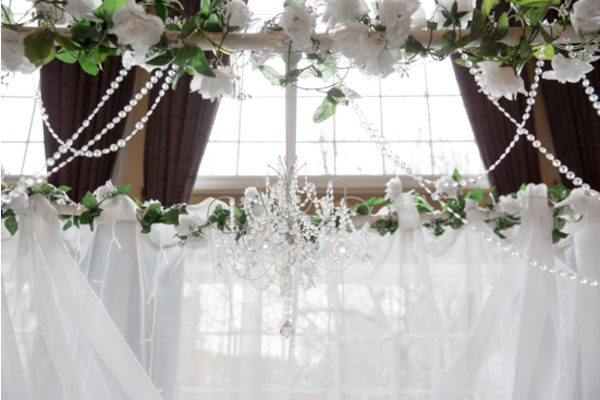 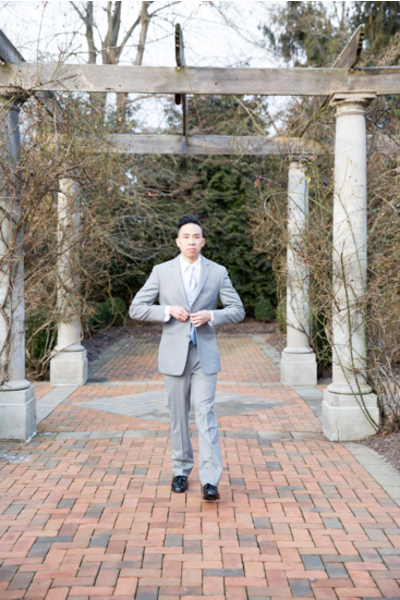 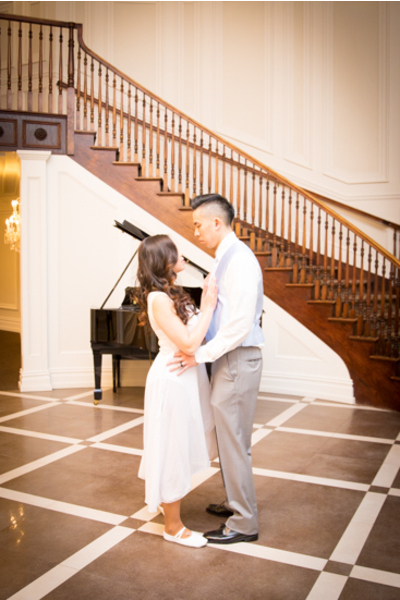 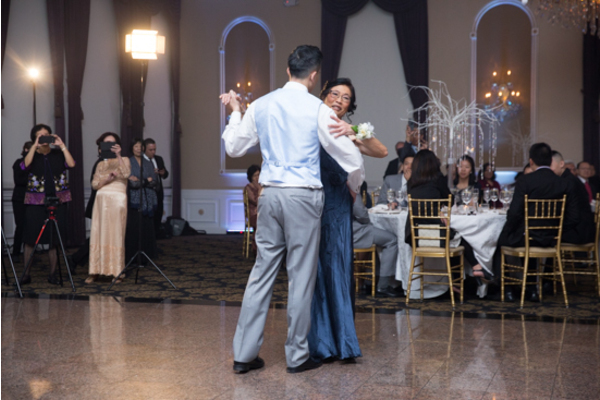 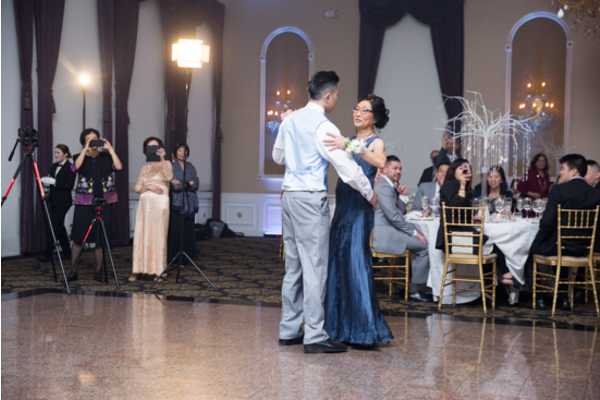 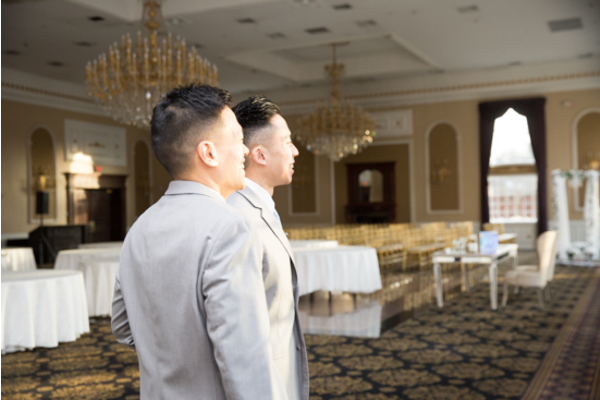 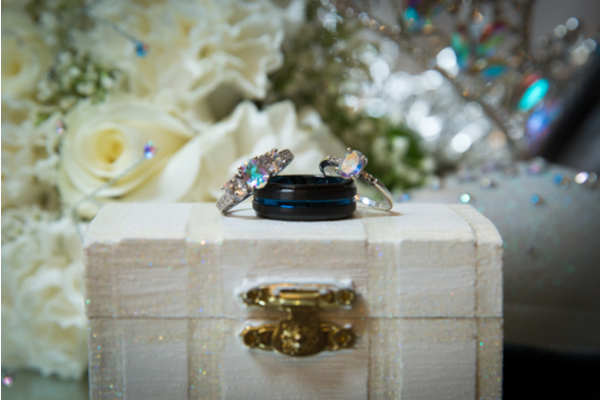 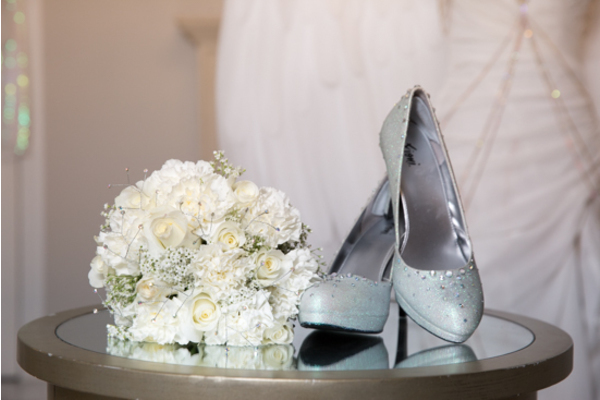 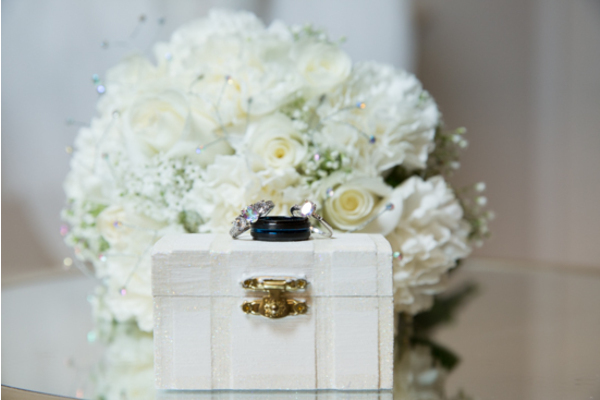 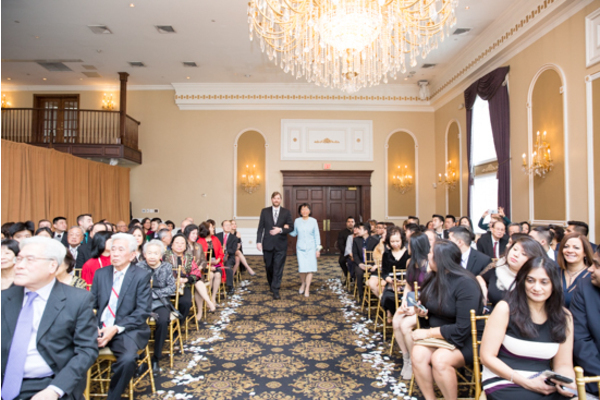 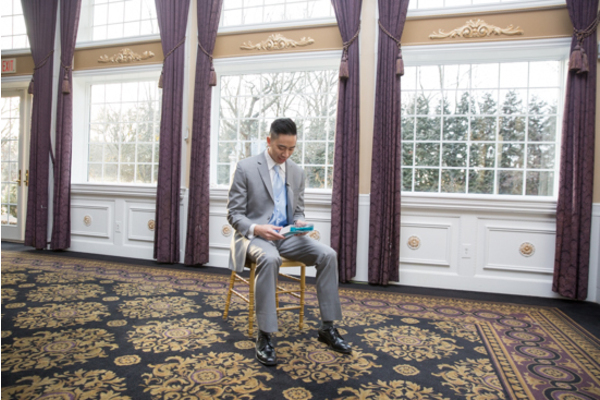 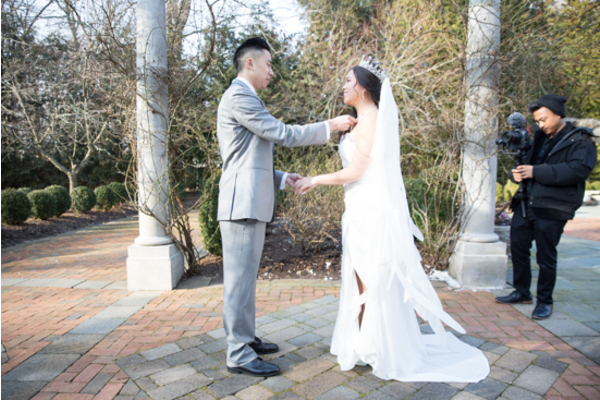 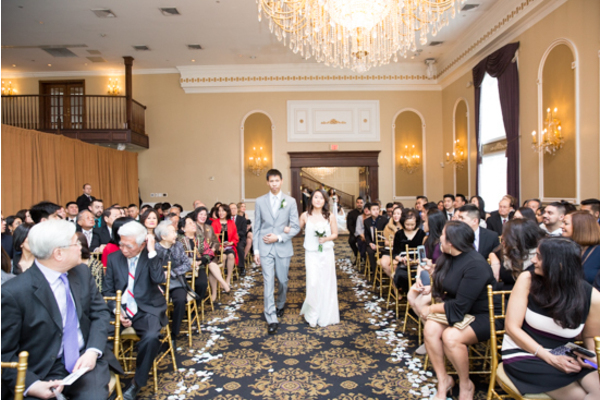 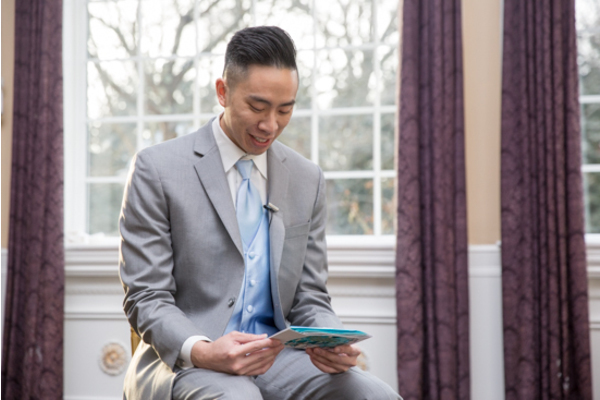 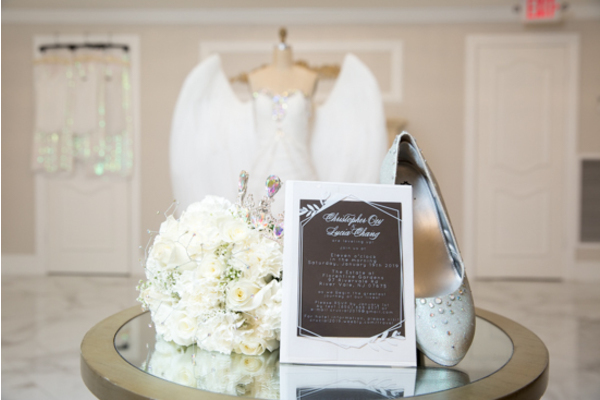 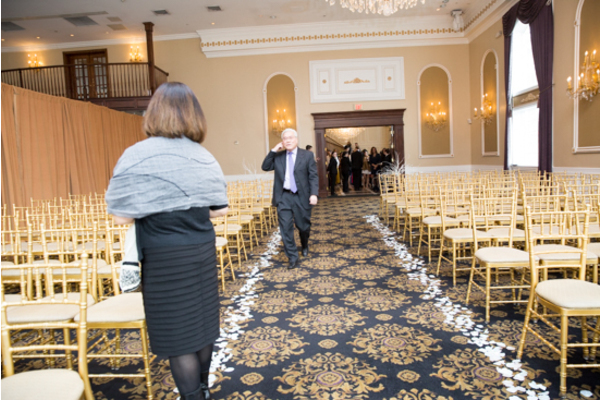 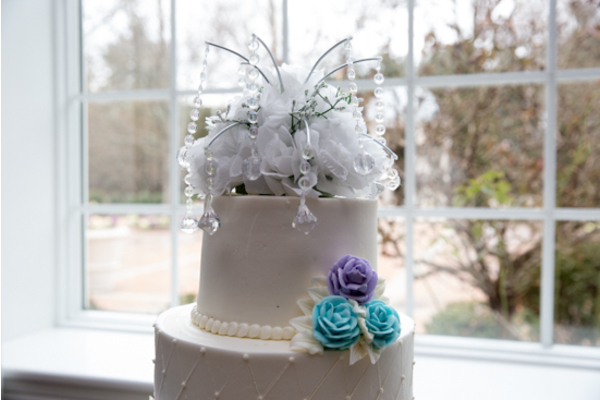 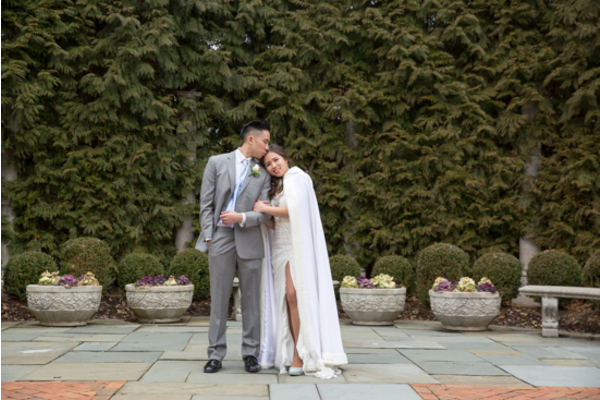 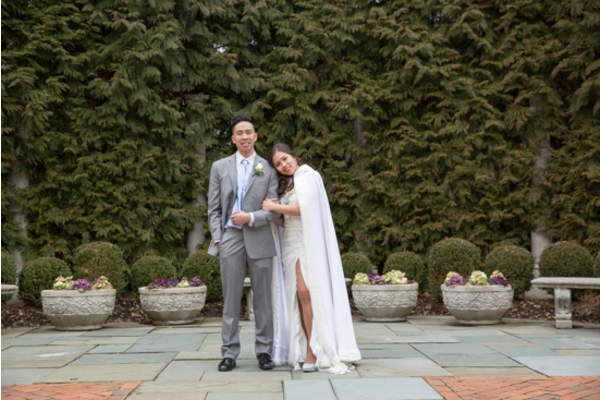 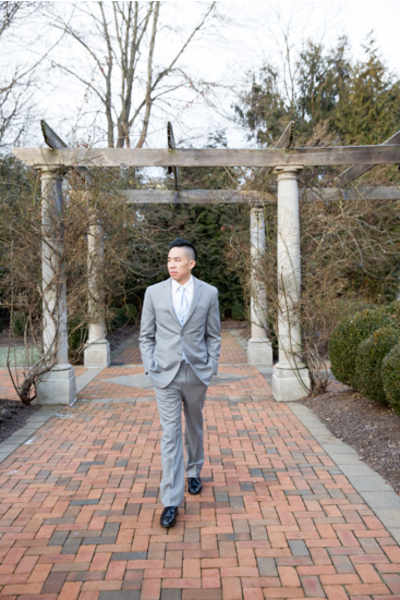 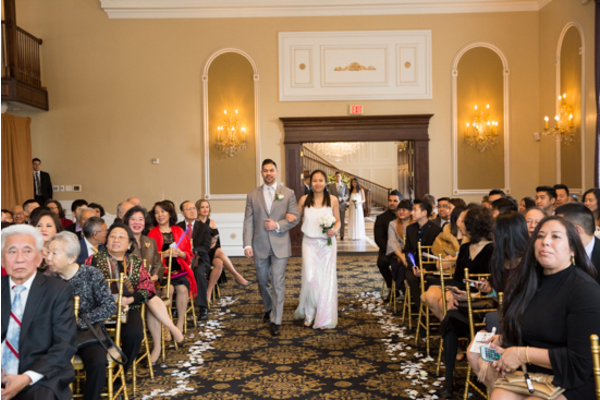 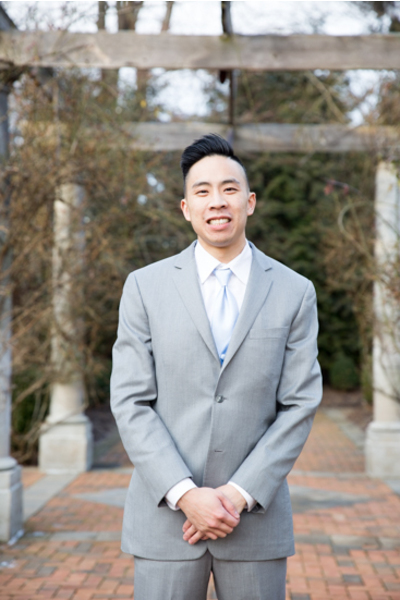 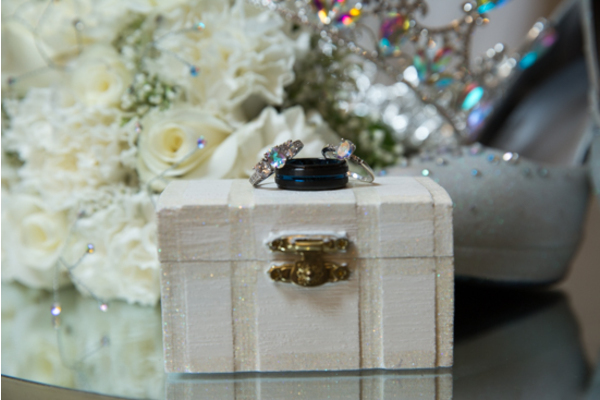 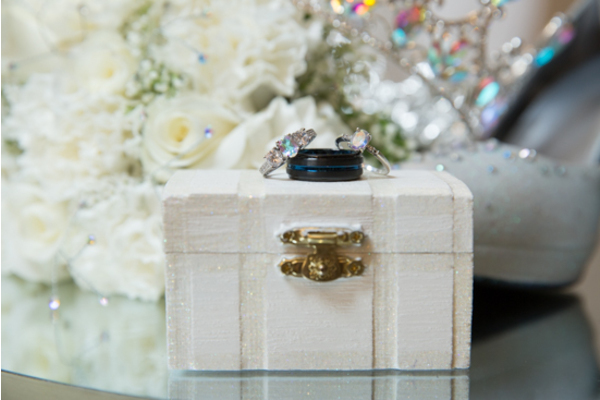 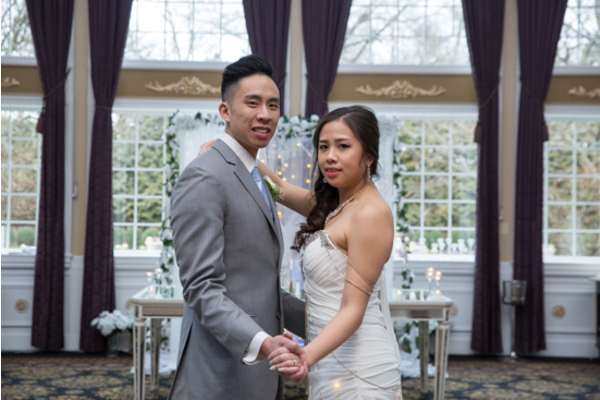 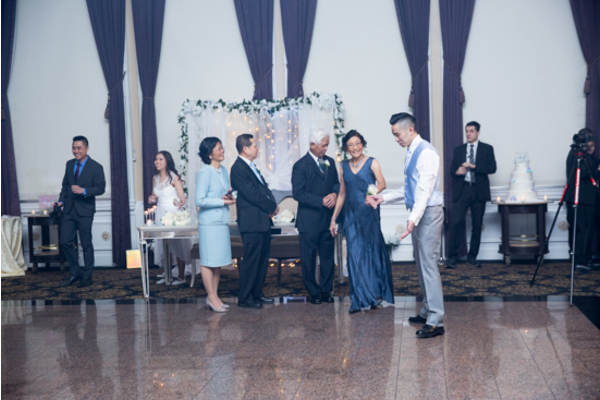 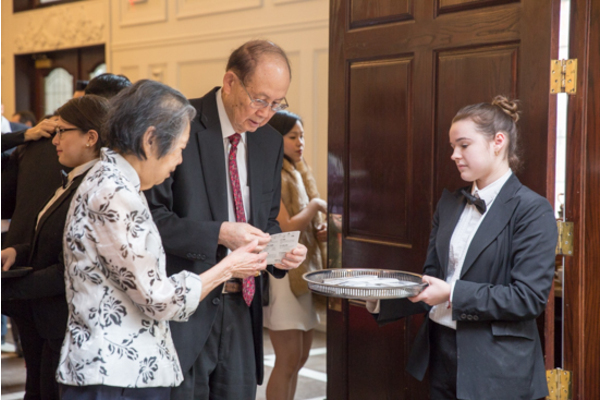 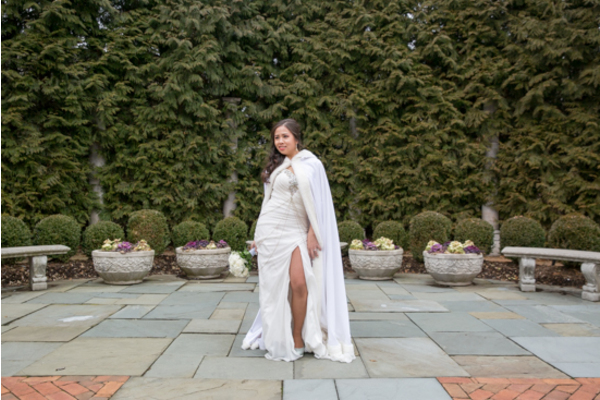 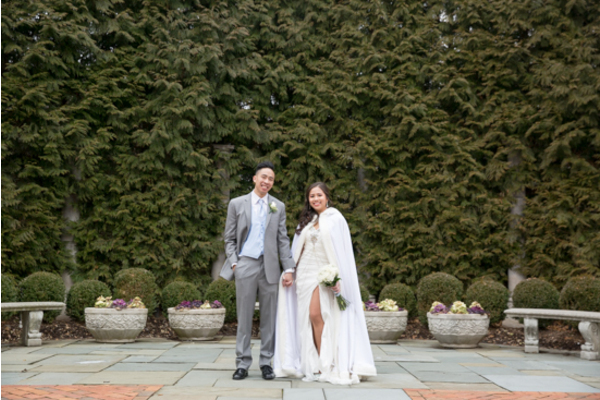 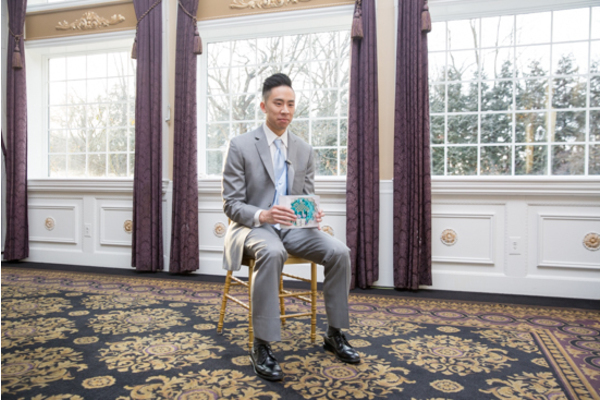 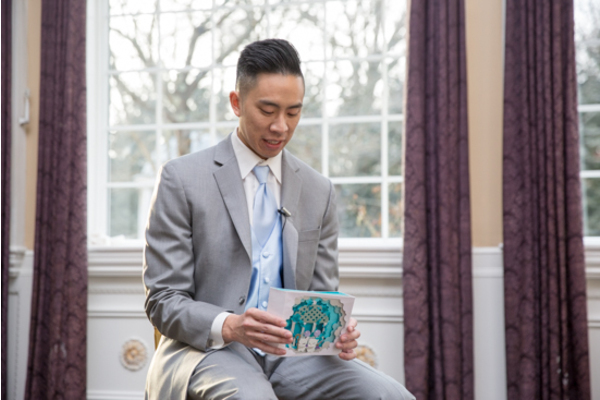 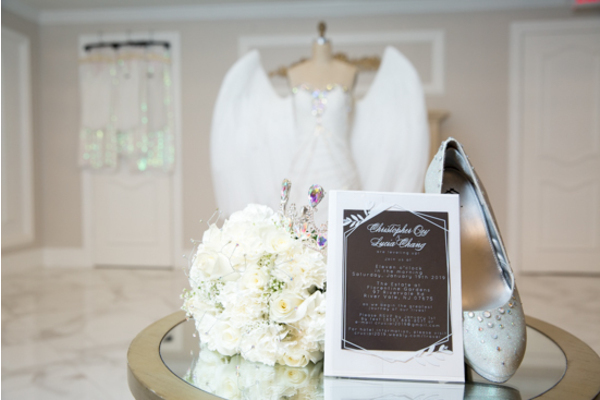 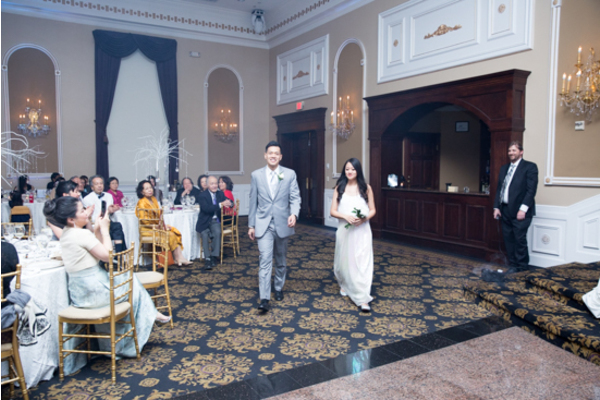 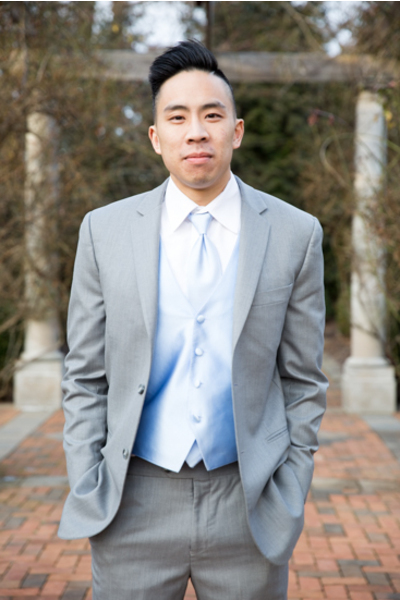 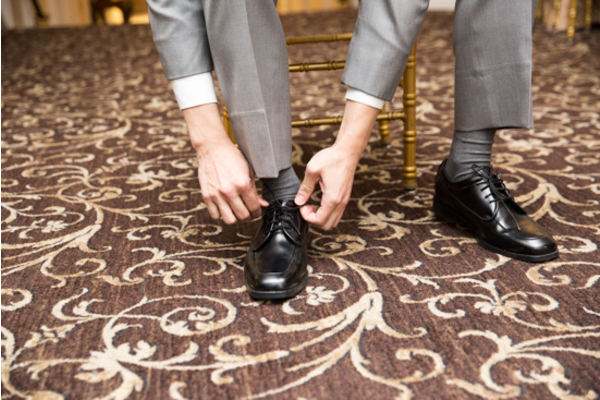 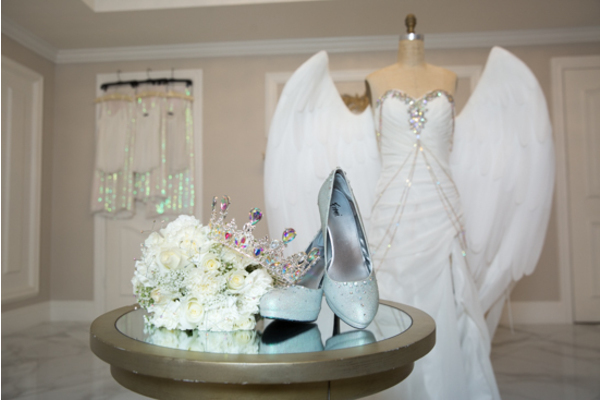 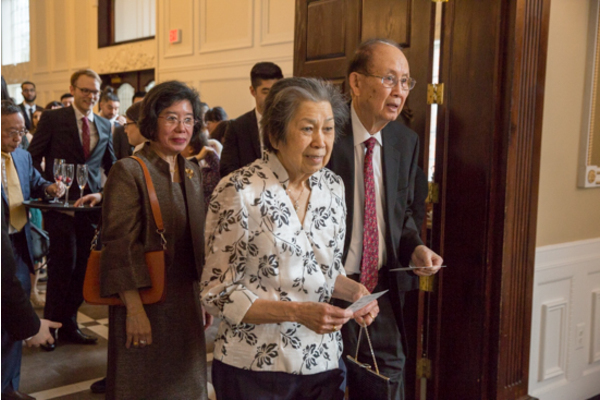 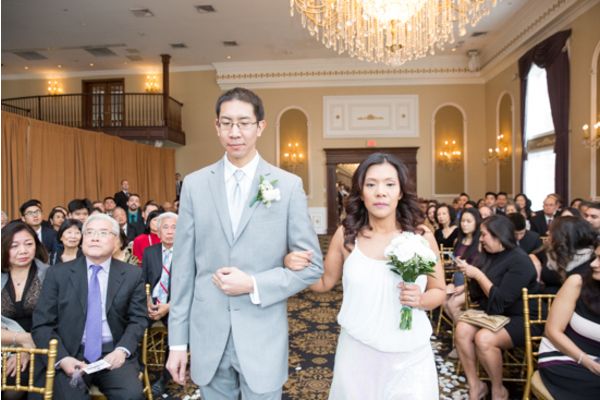 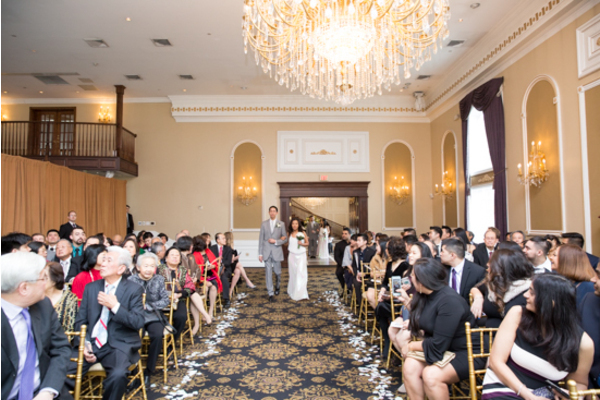 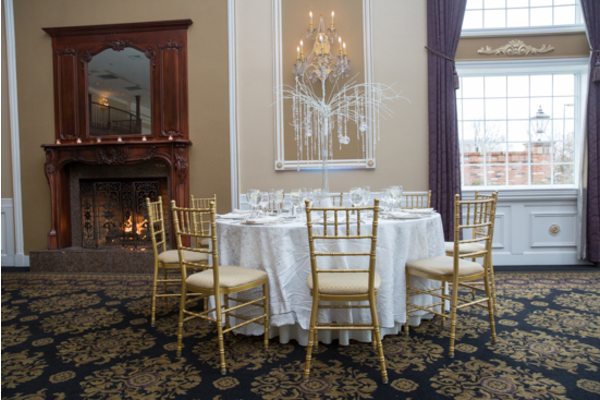 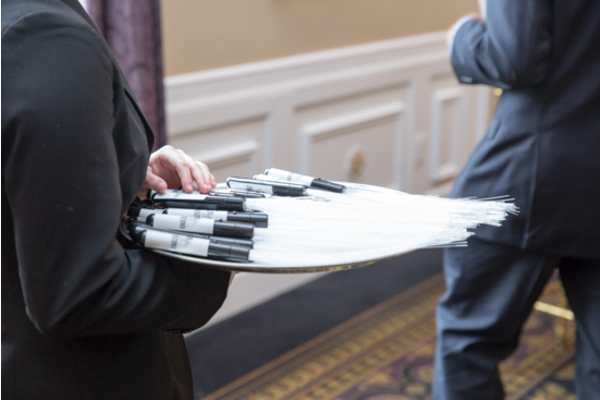 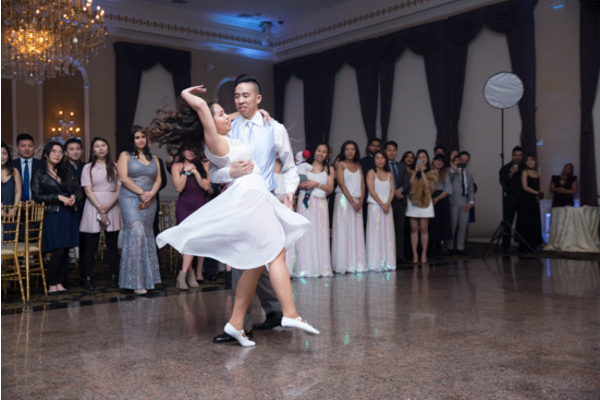 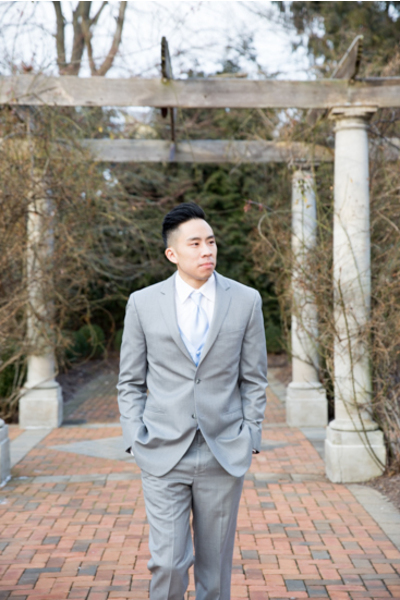 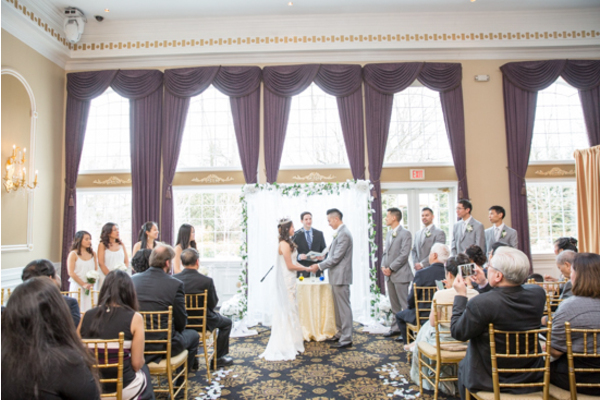 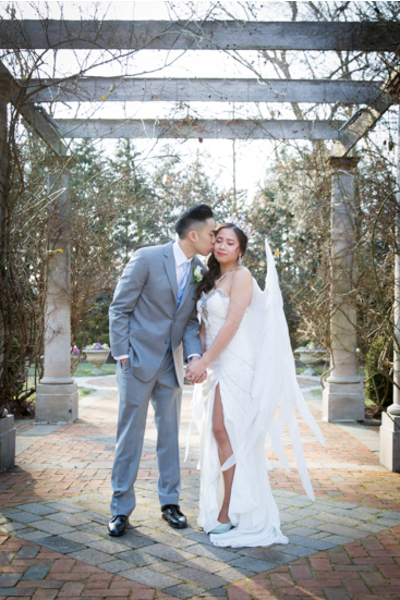 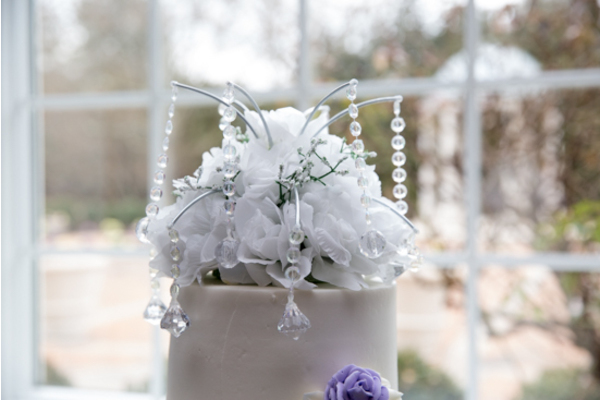 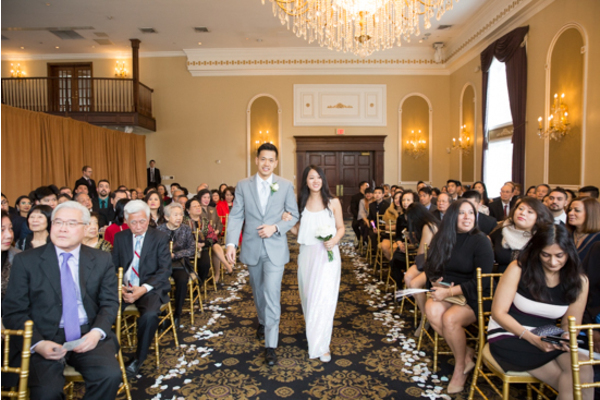 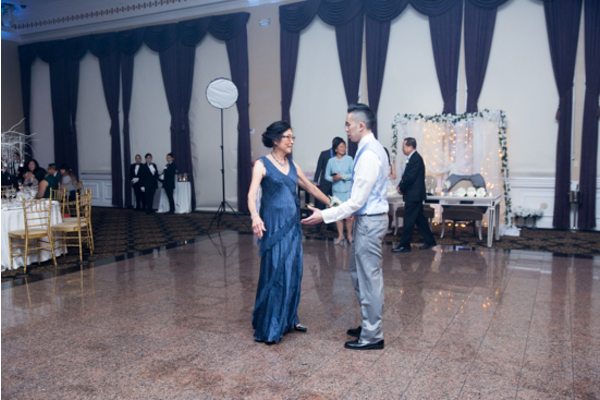 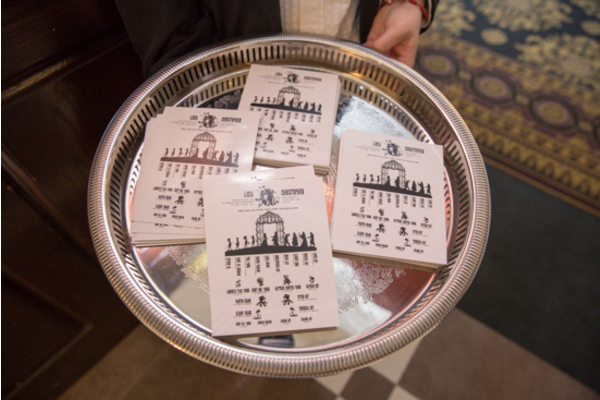 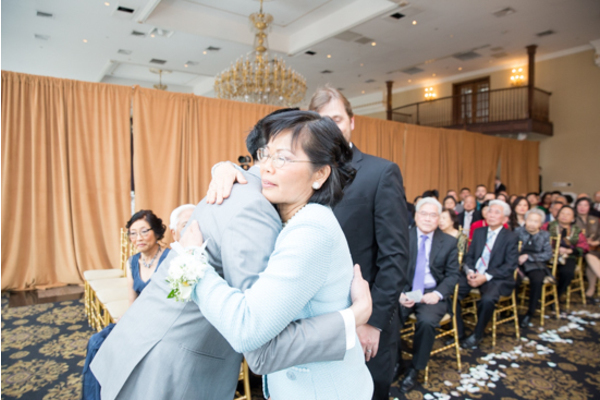 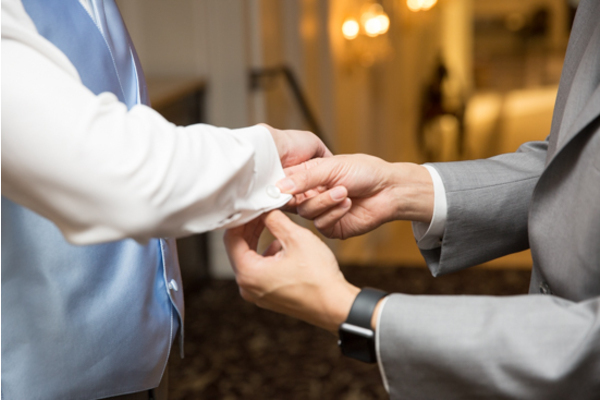 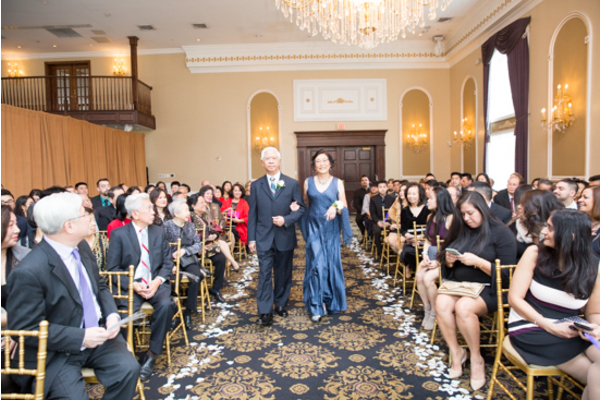 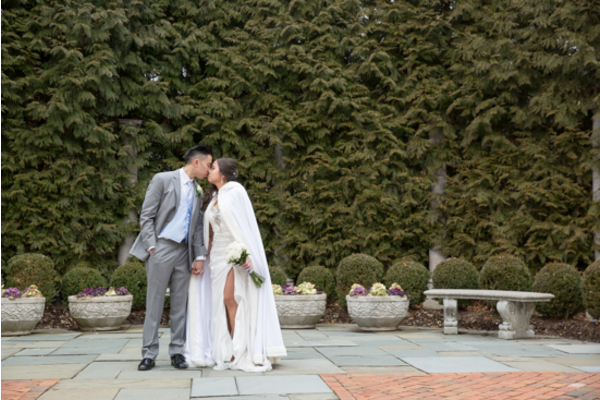 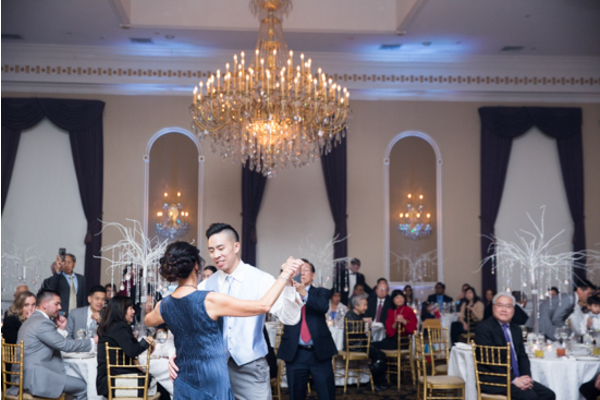 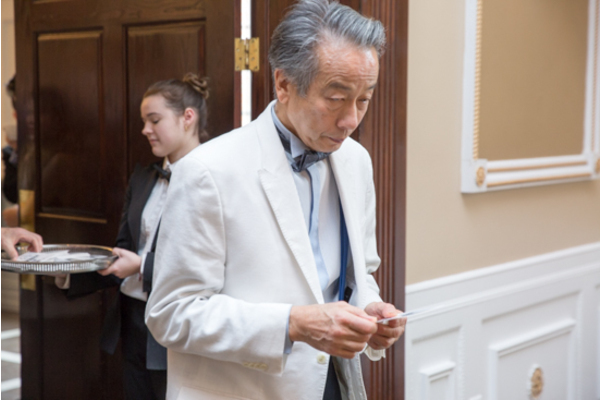 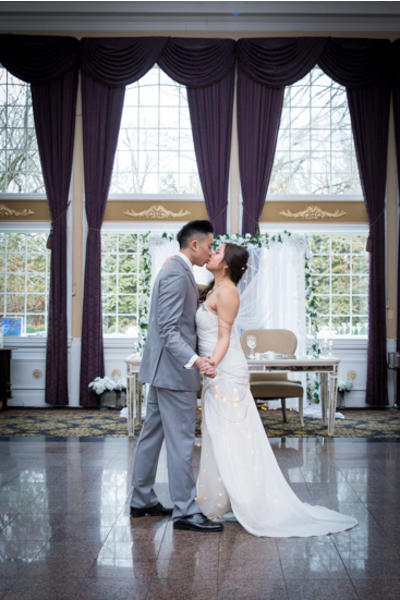 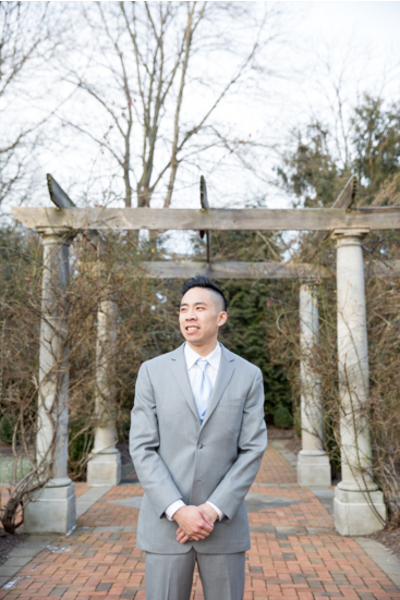 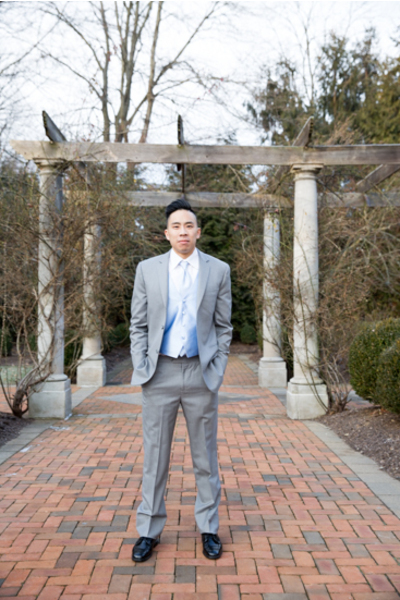 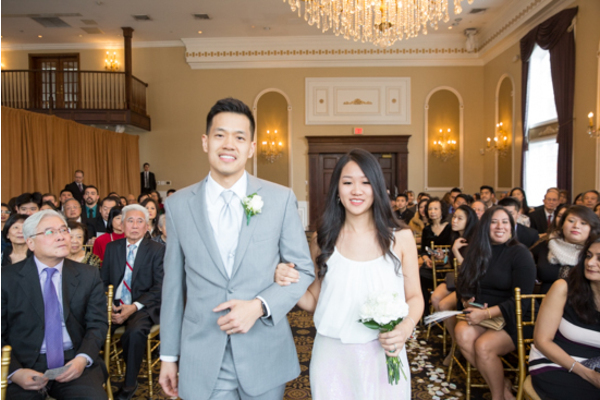 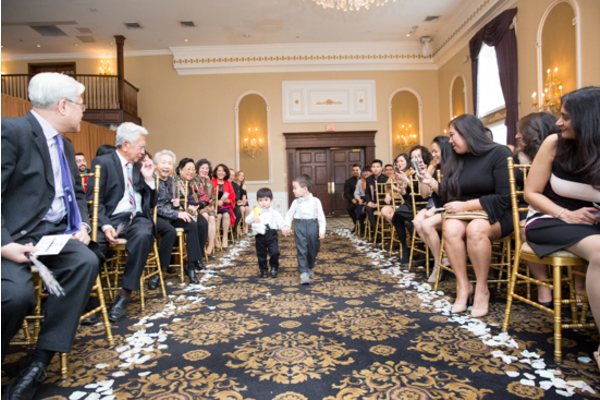 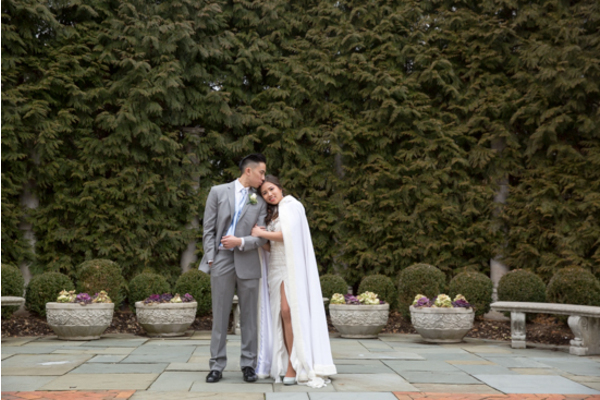 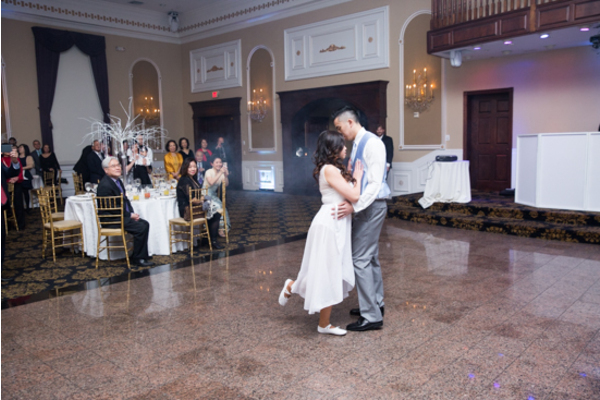 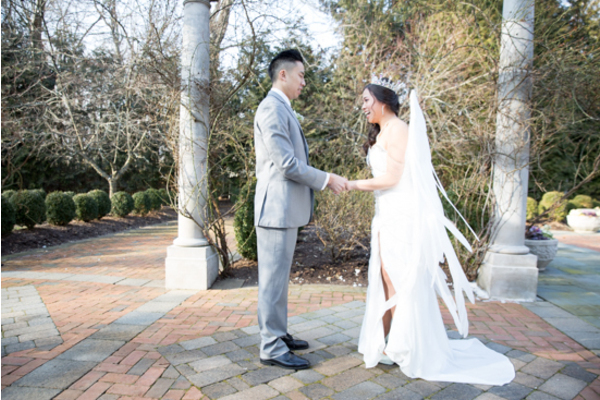 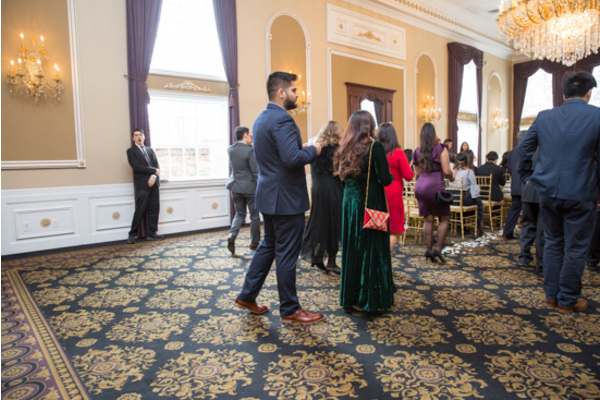 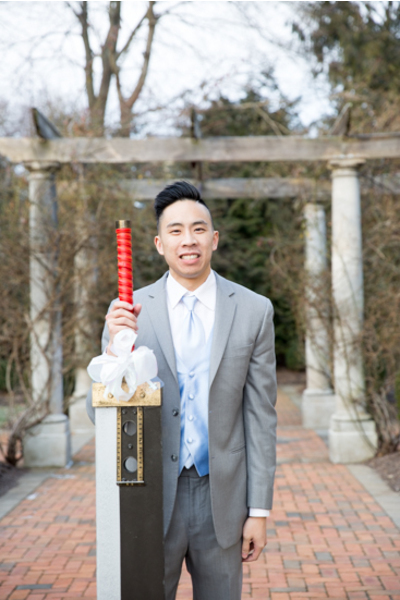 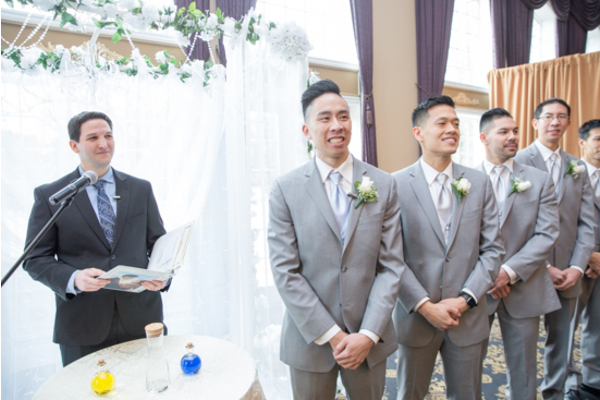 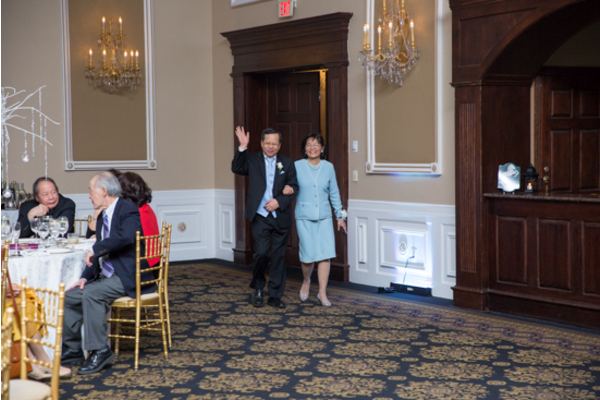 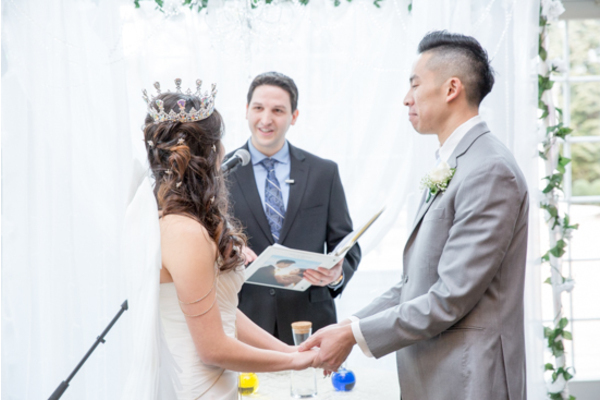 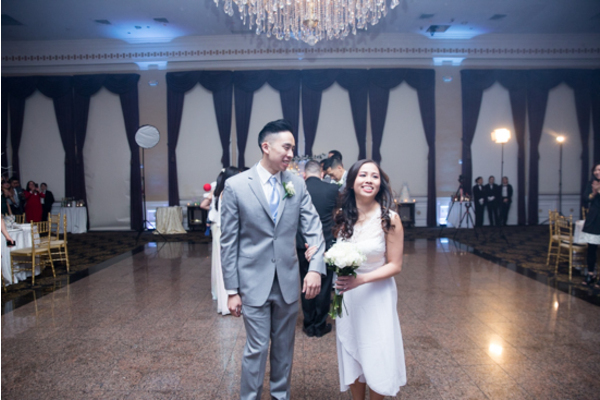 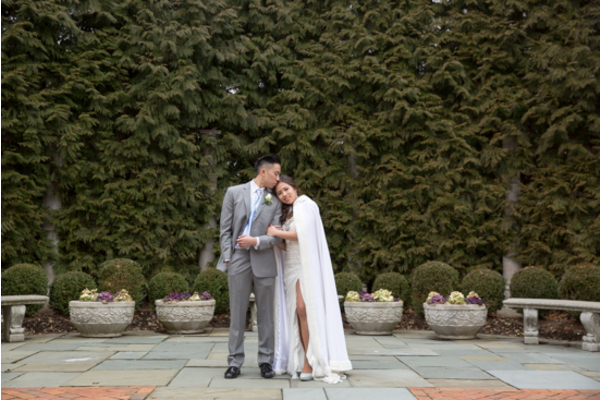 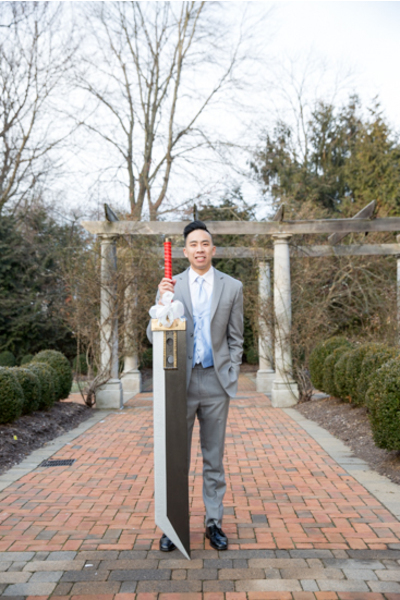 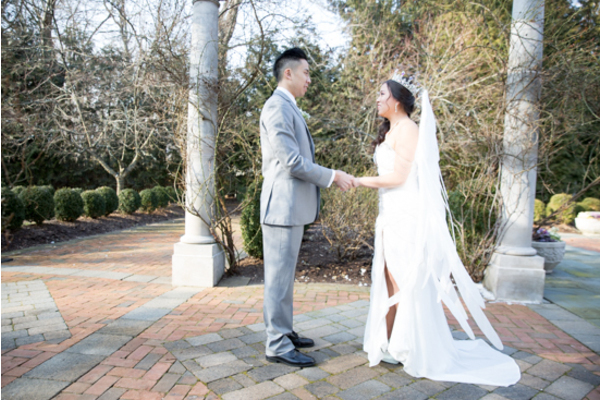 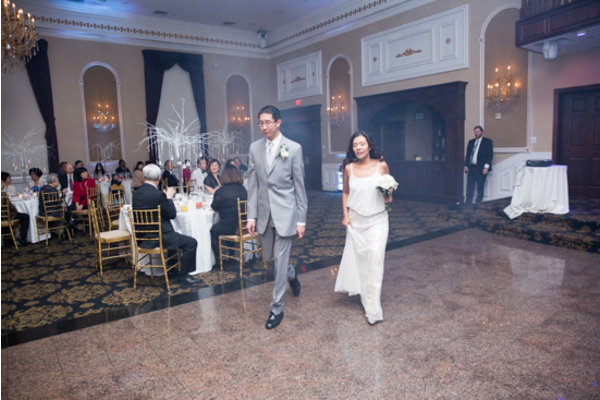 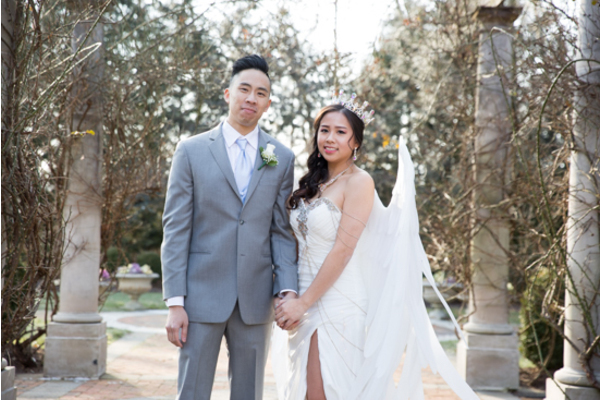 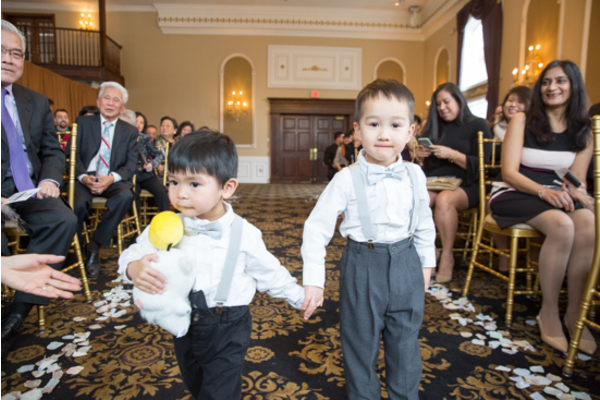 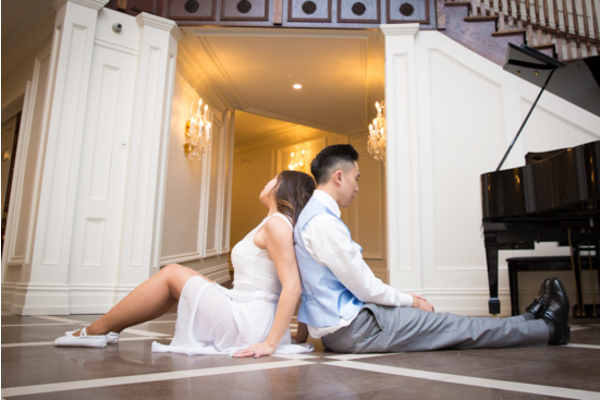 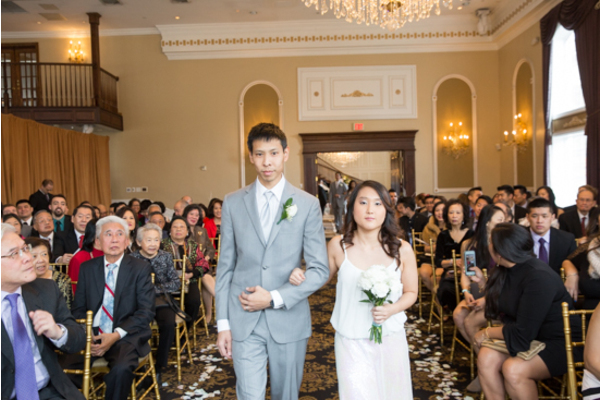 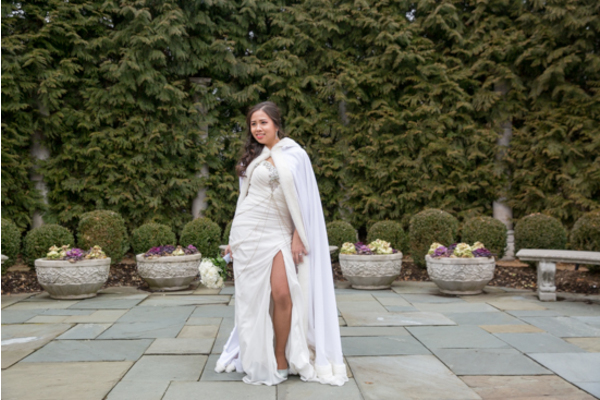 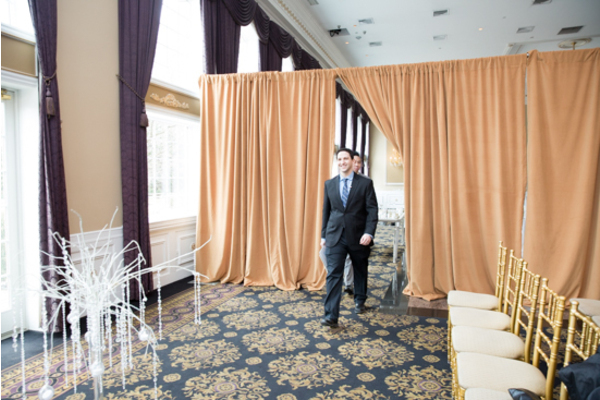 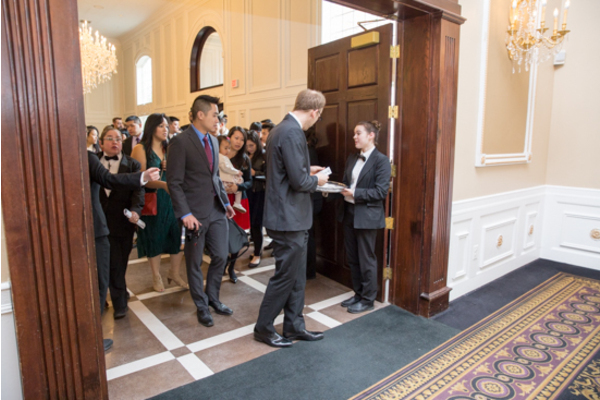 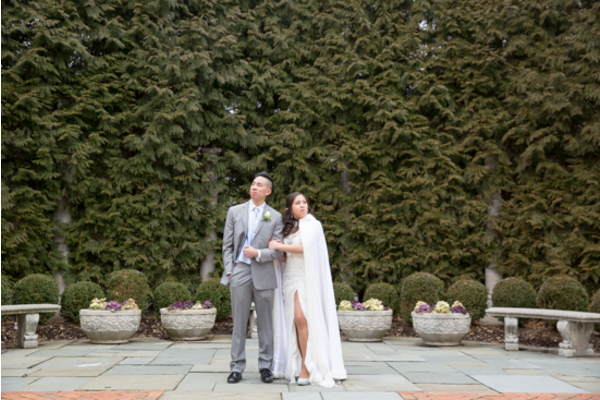 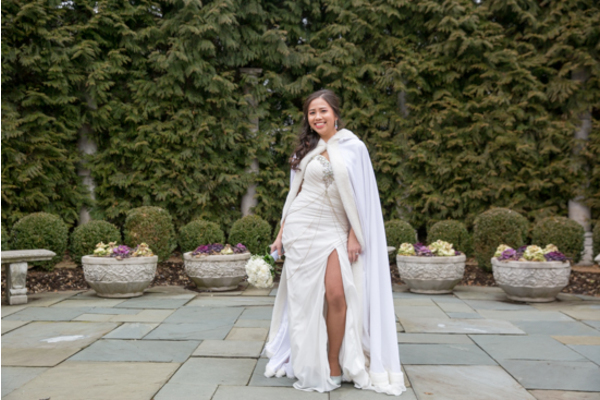 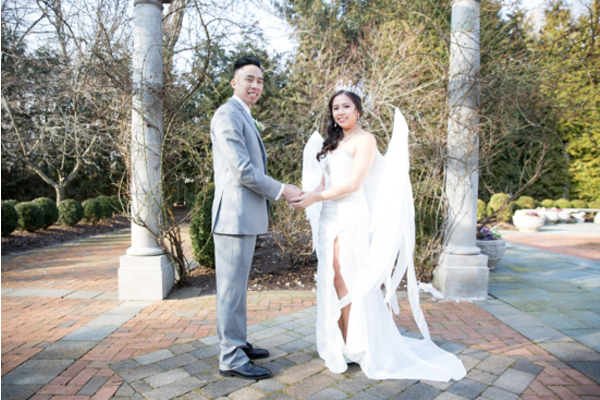 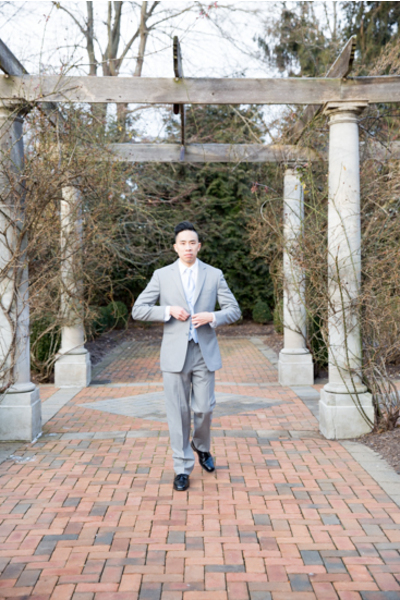 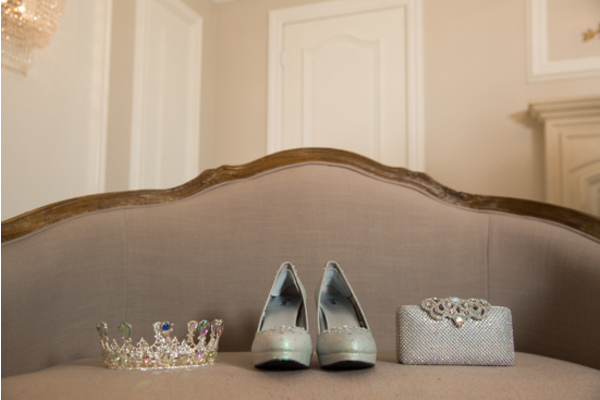 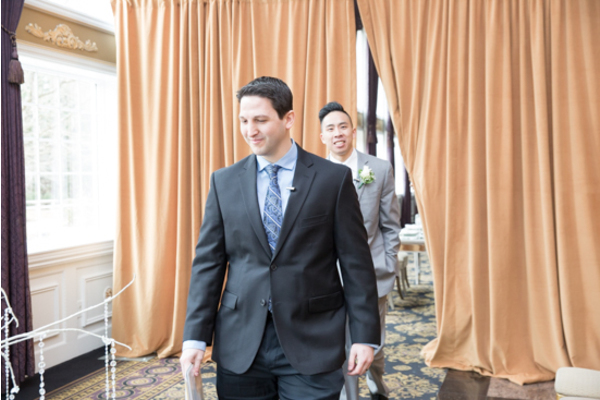 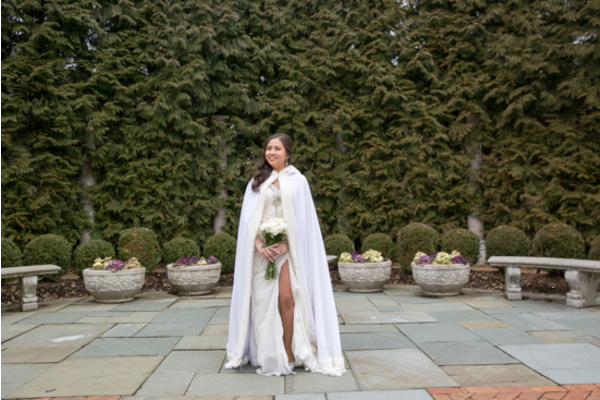 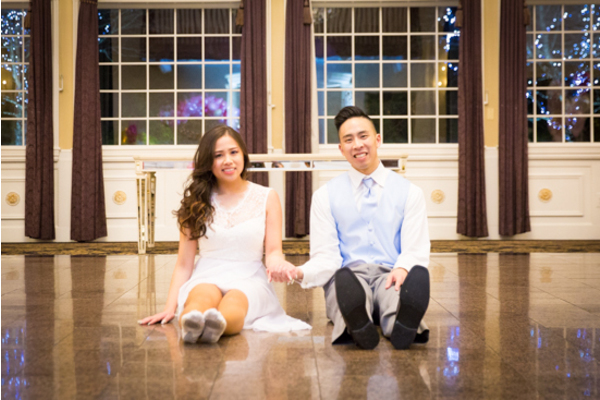 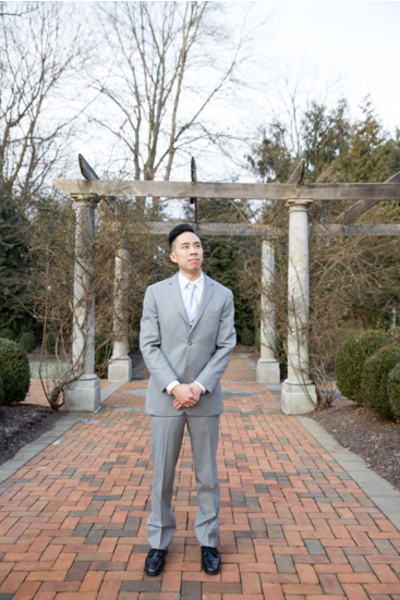 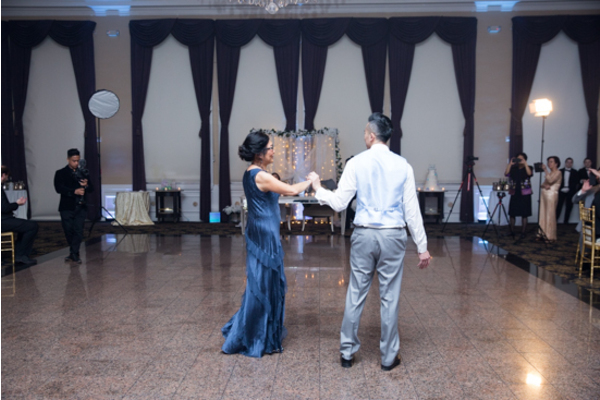 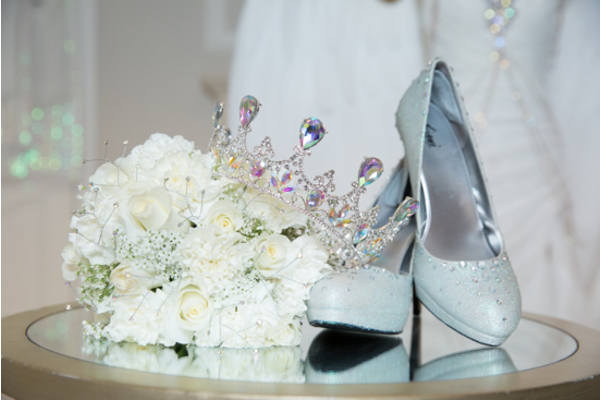 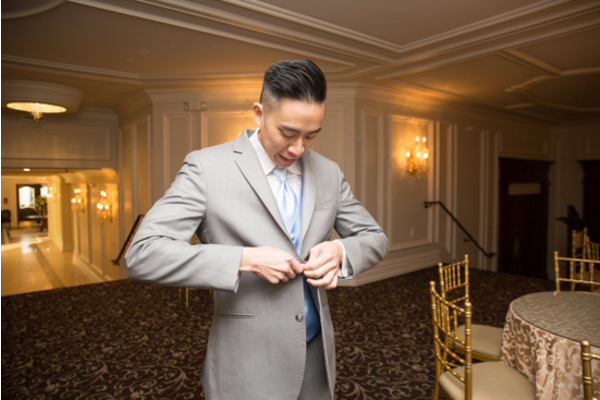 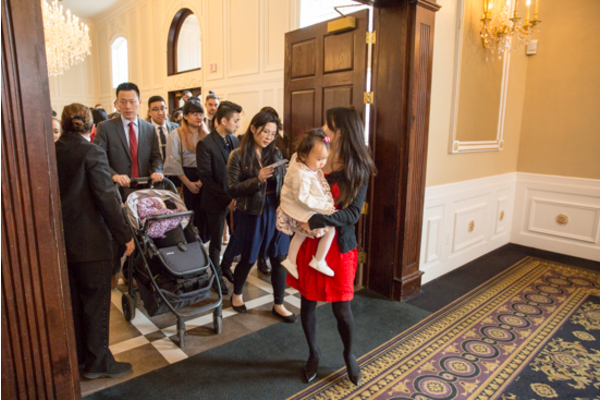 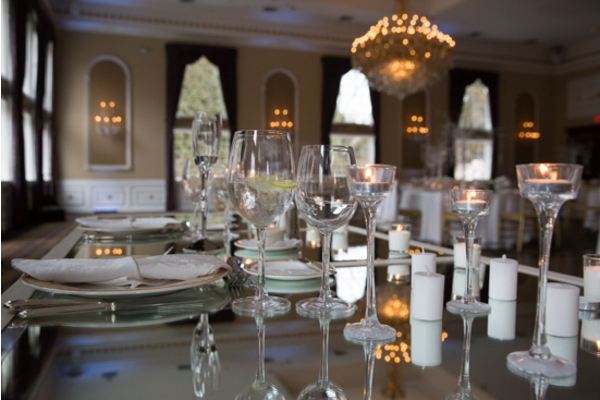 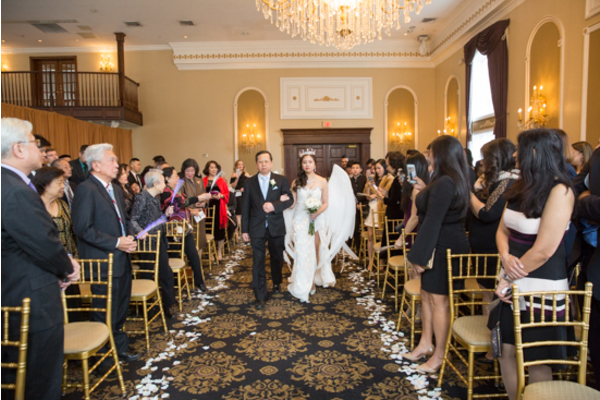 Our NJ Wedding Photographer was there every step of the way to capture the special memories. 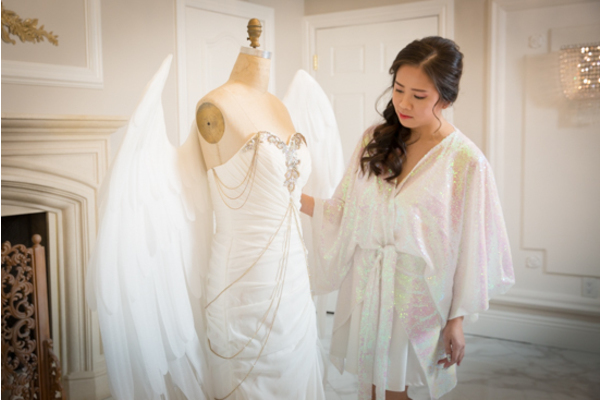 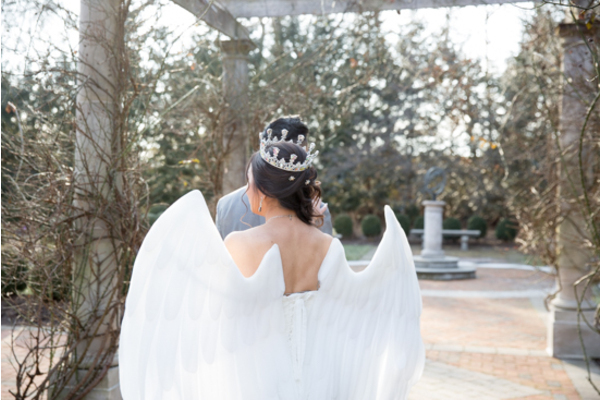 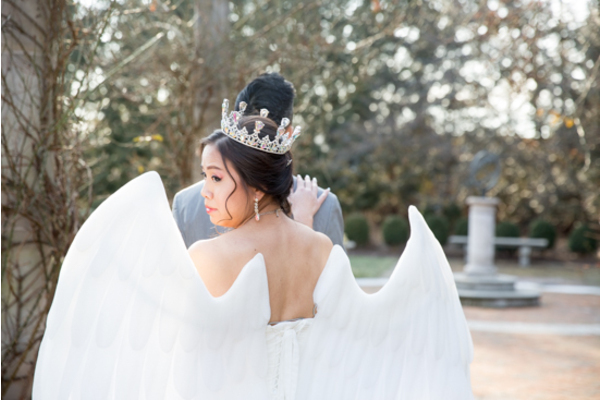 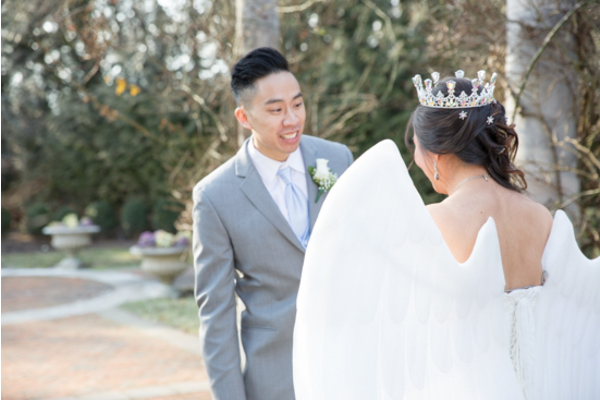 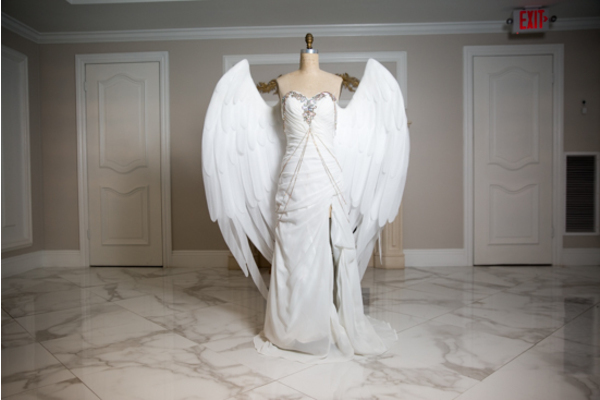 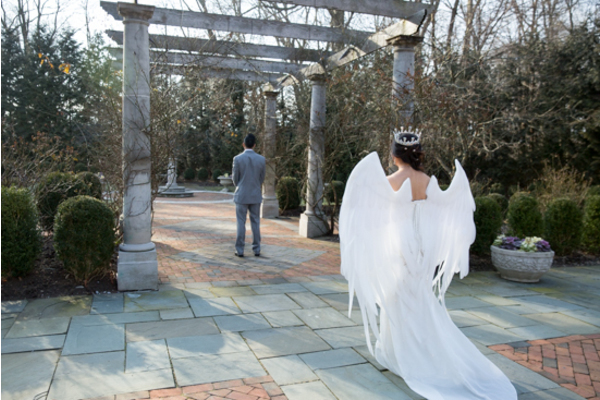 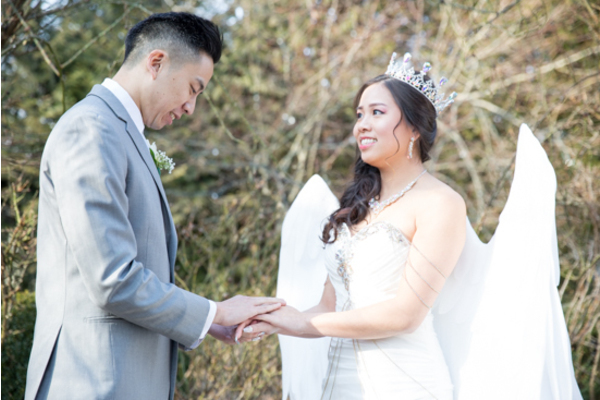 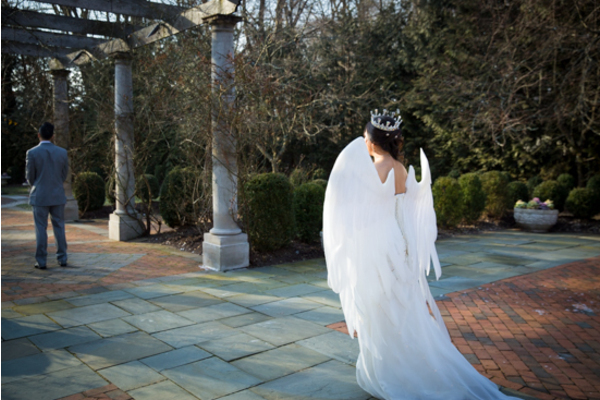 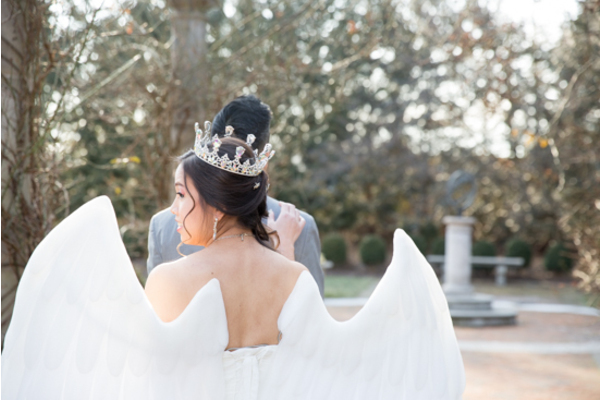 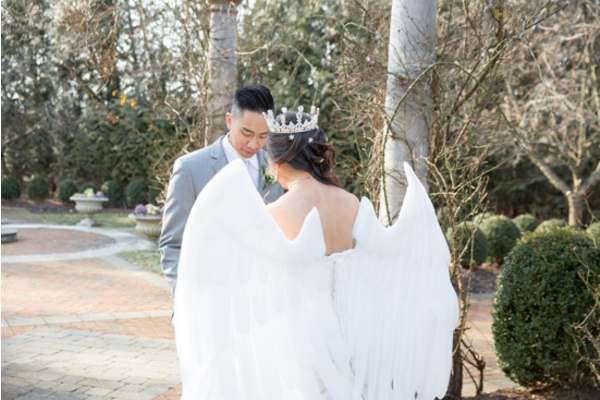 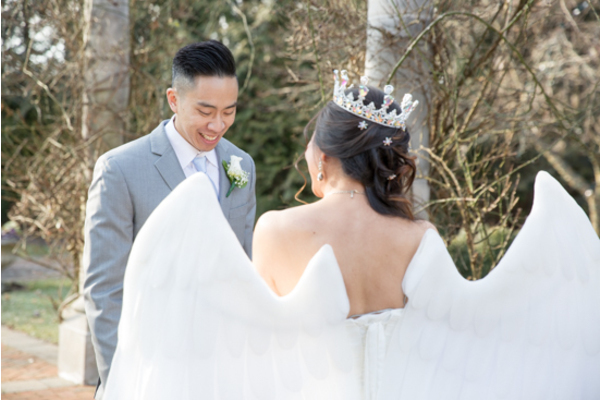 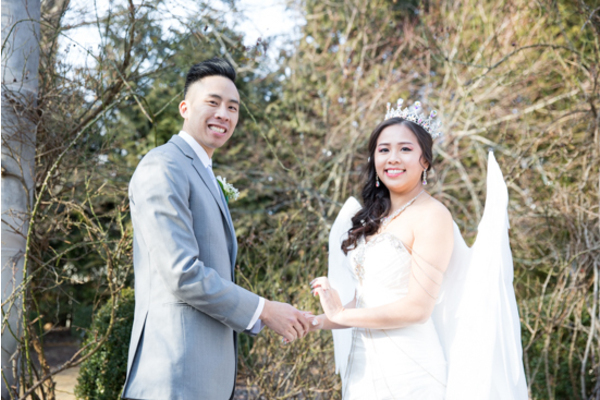 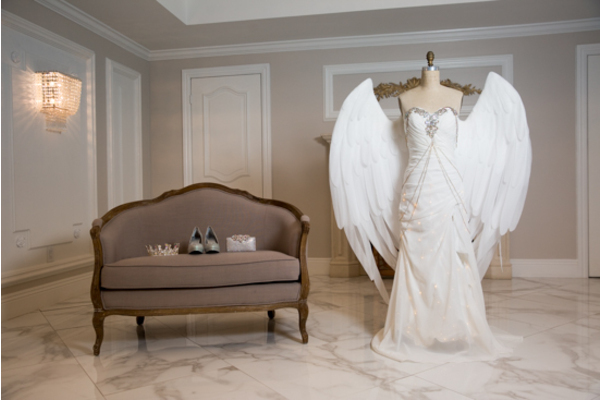 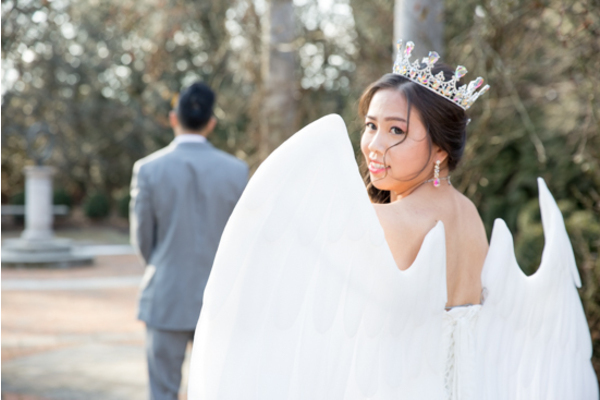 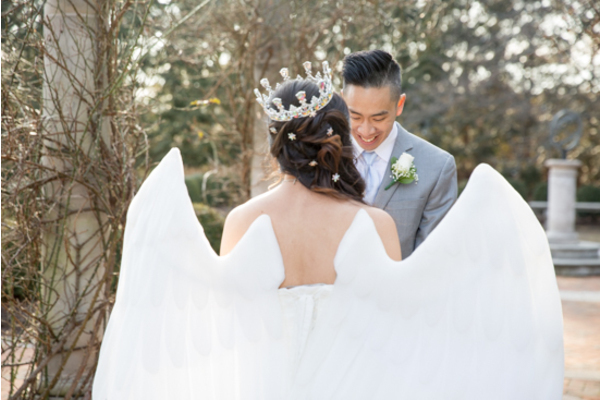 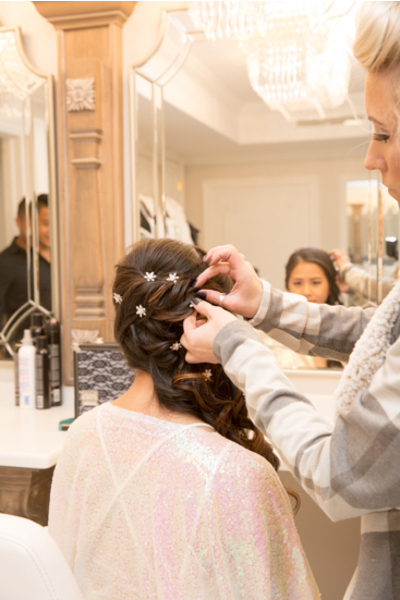 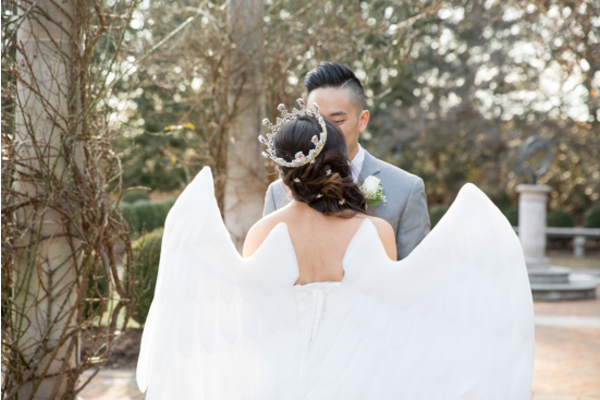 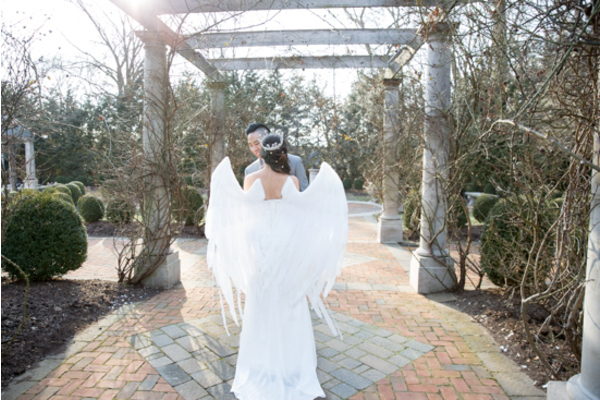 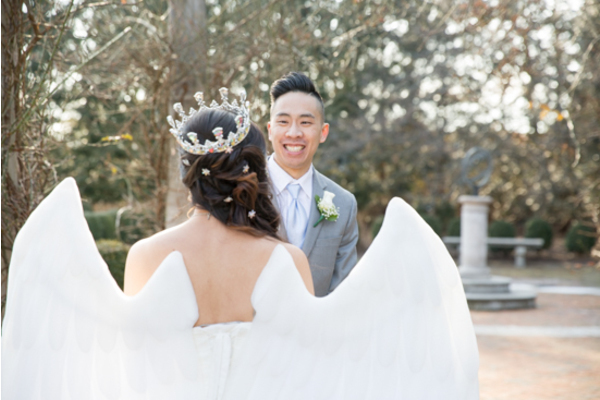 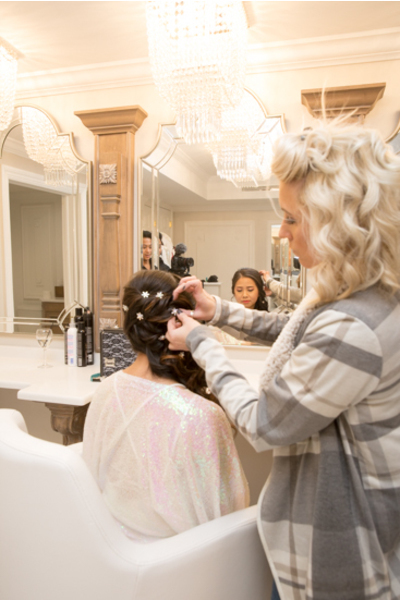 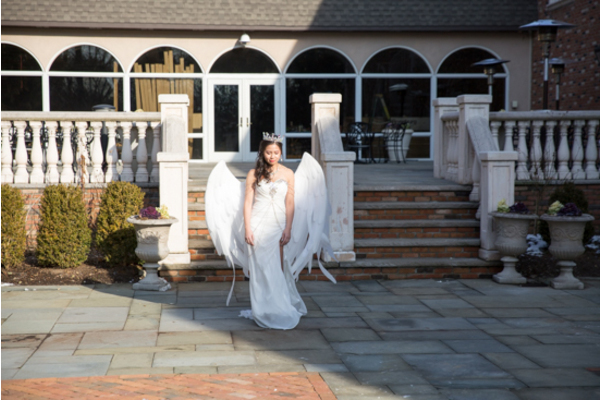 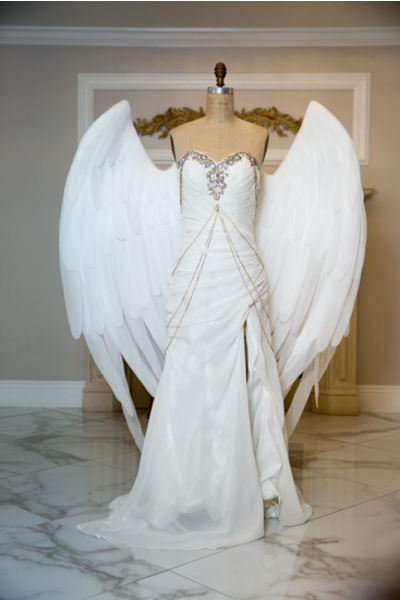 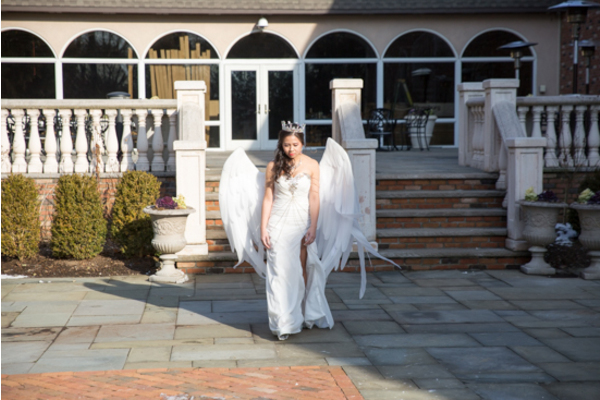 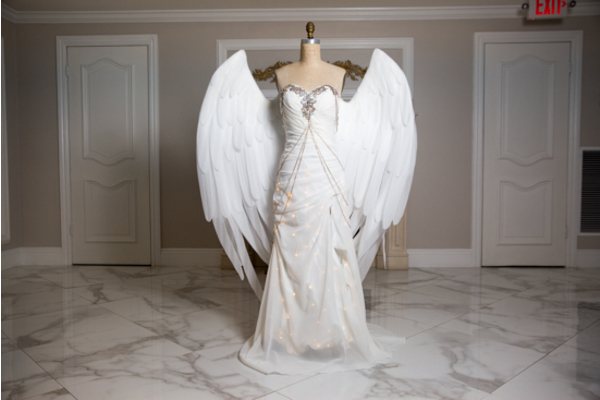 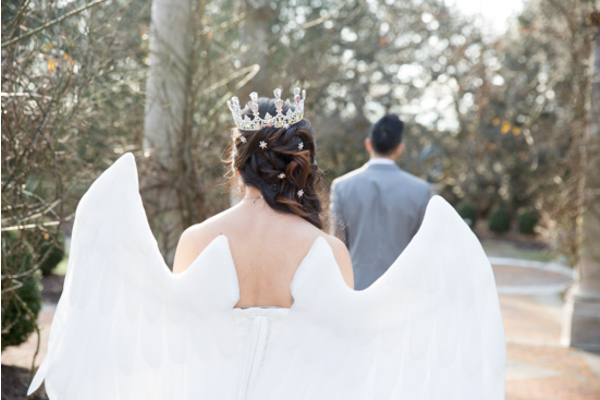 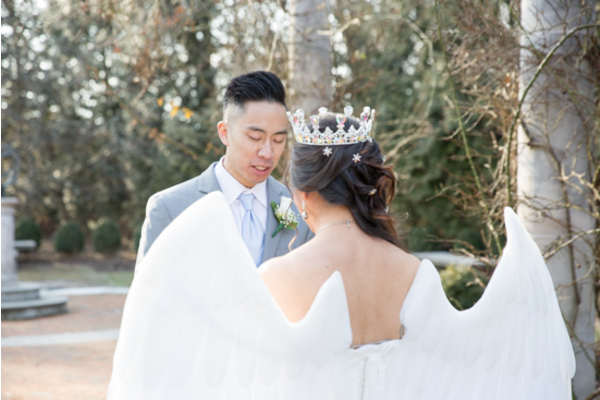 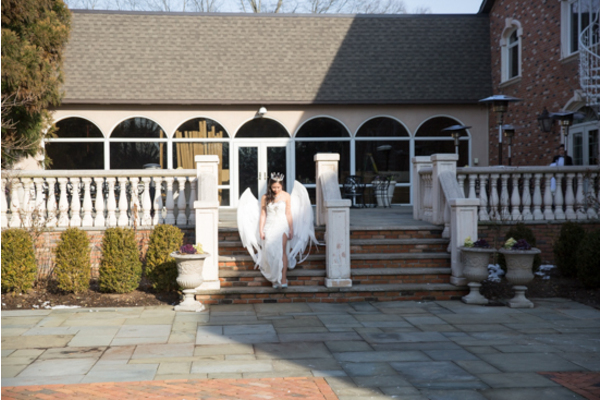 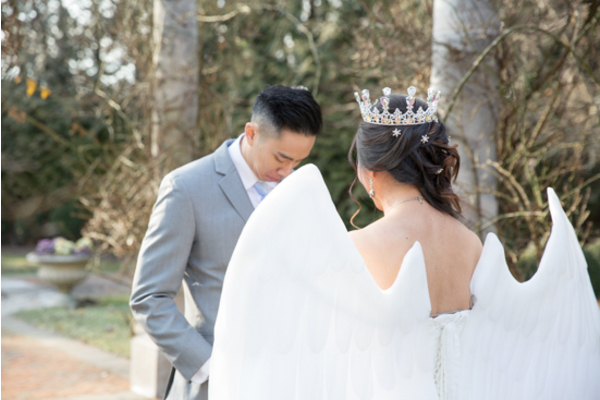 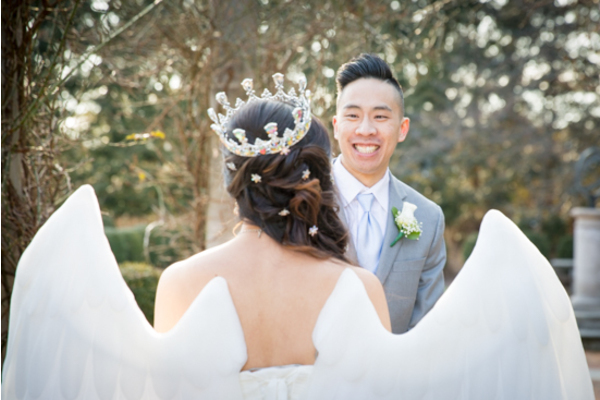 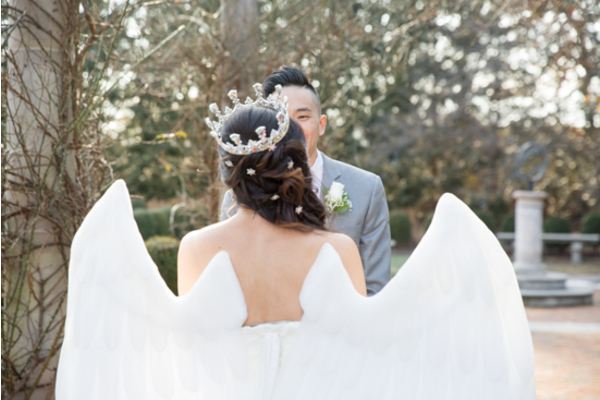 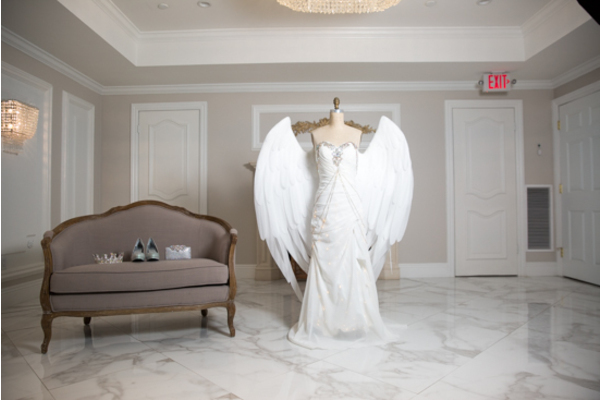 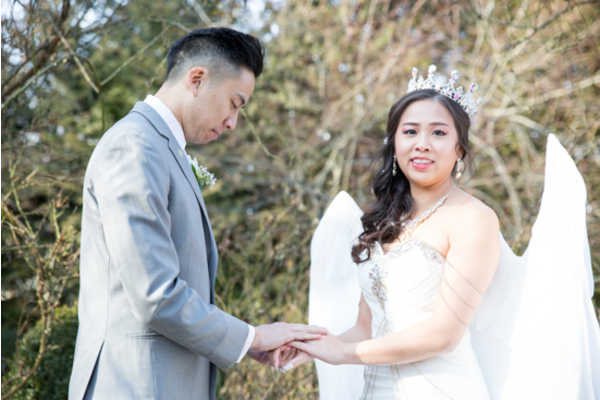 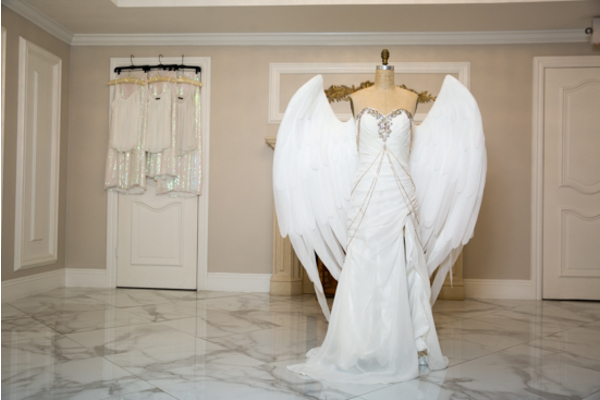 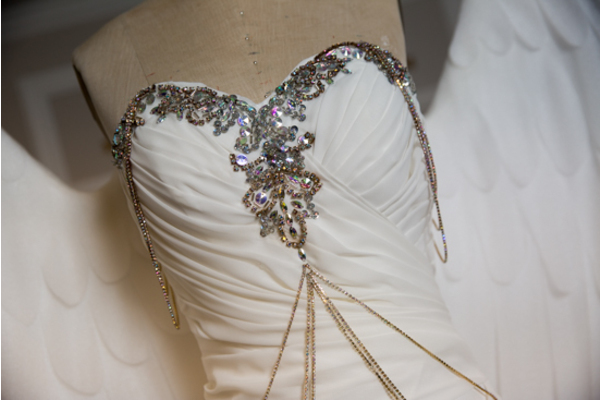 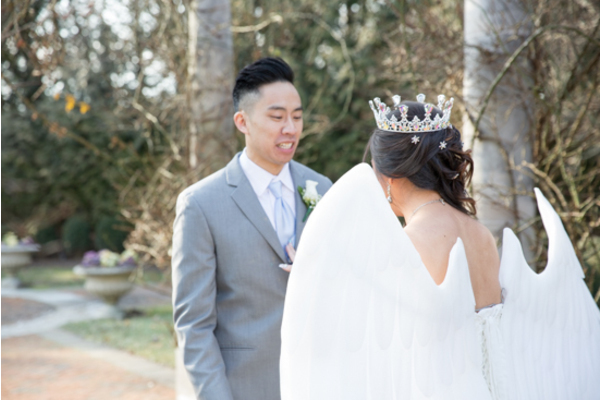 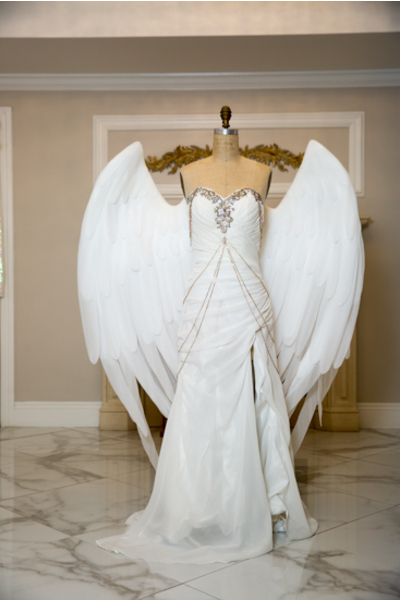 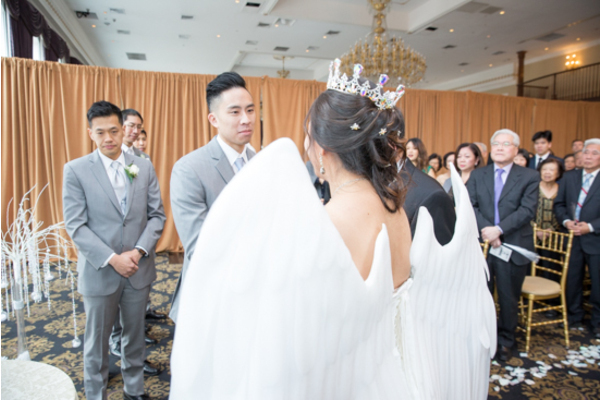 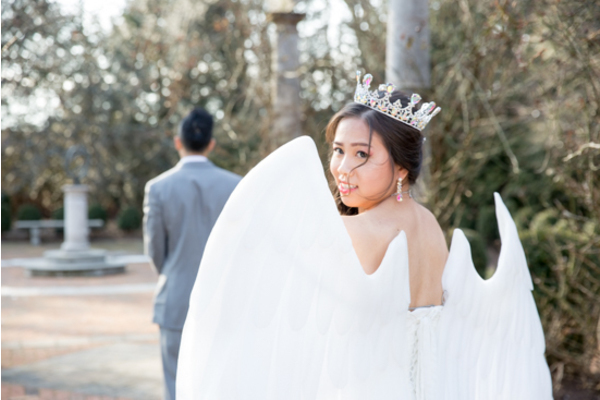 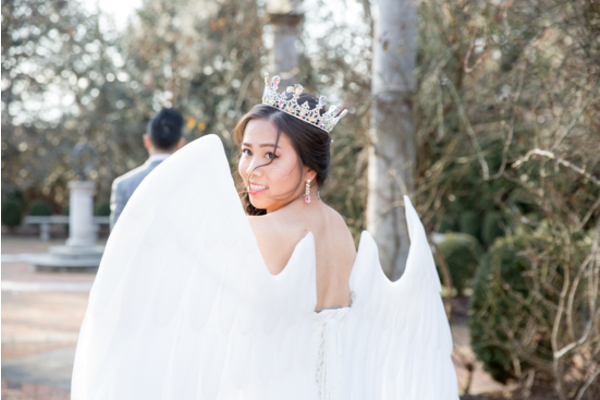 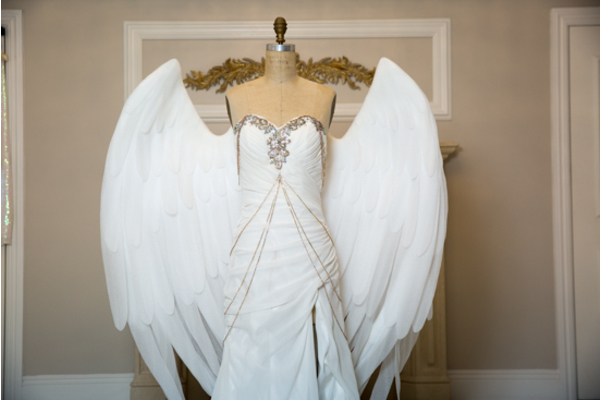 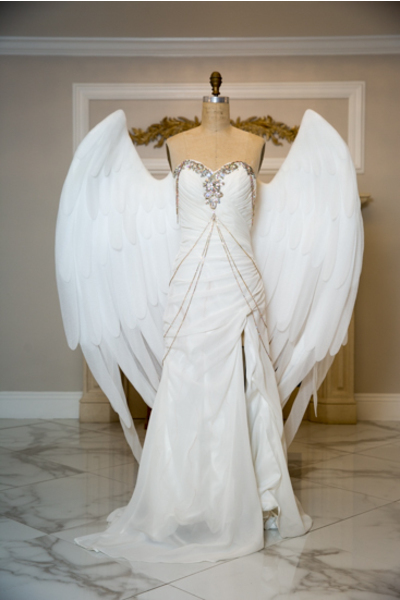 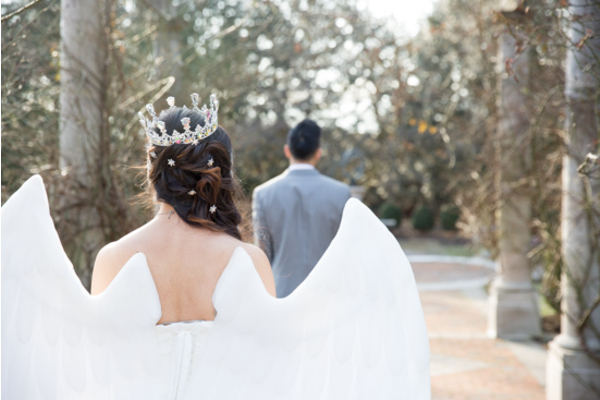 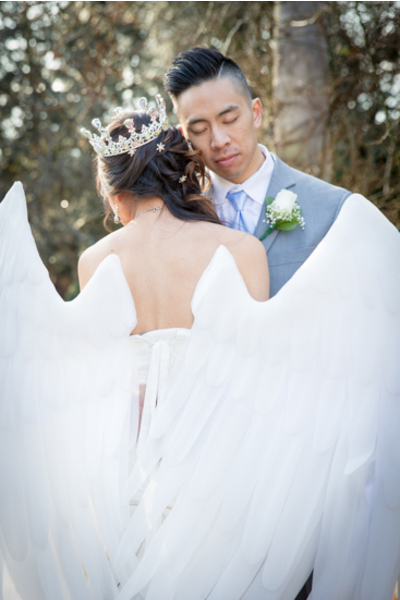 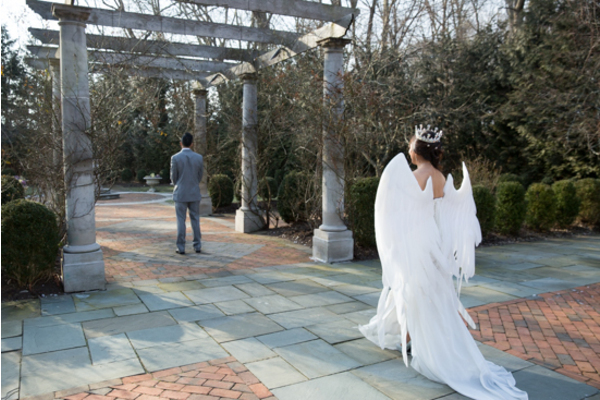 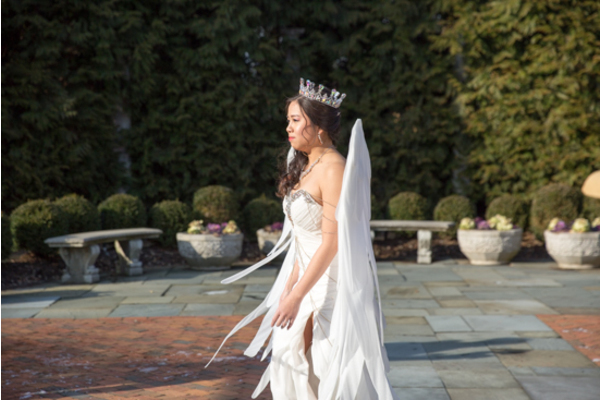 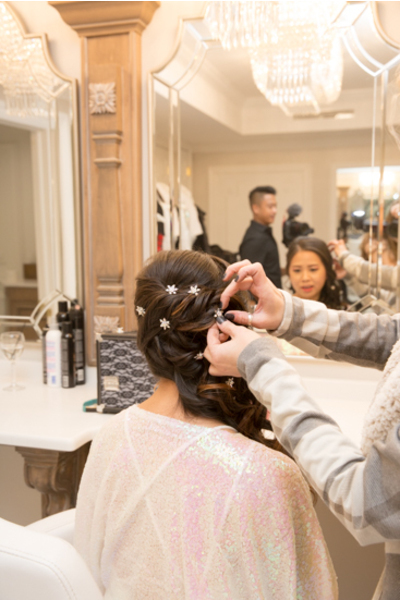 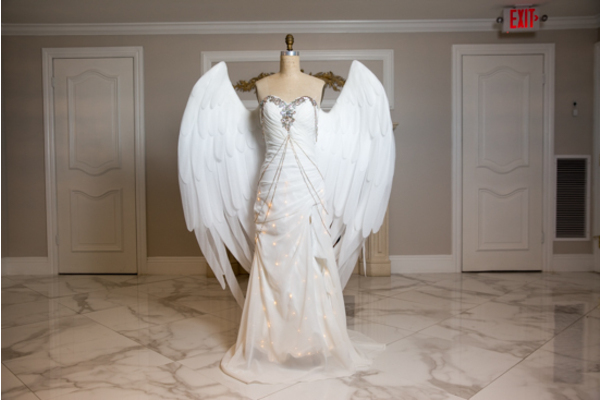 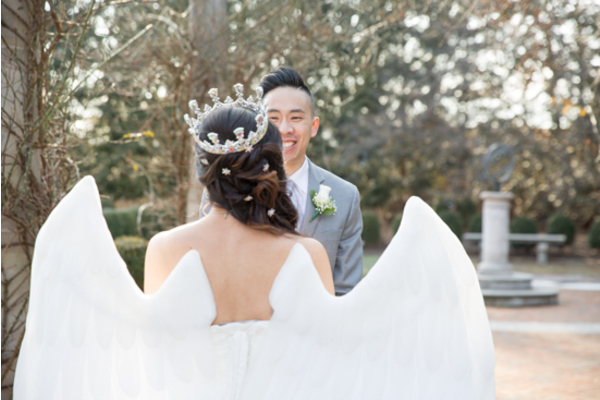 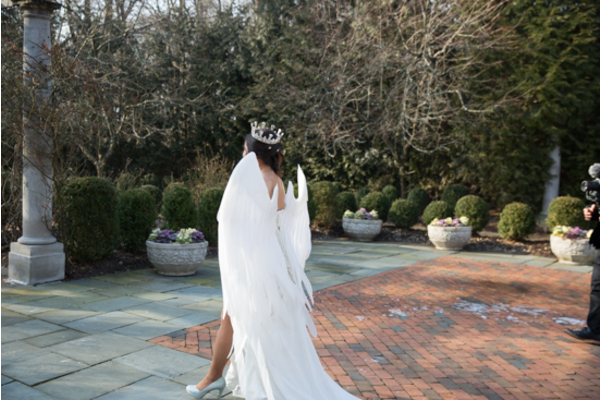 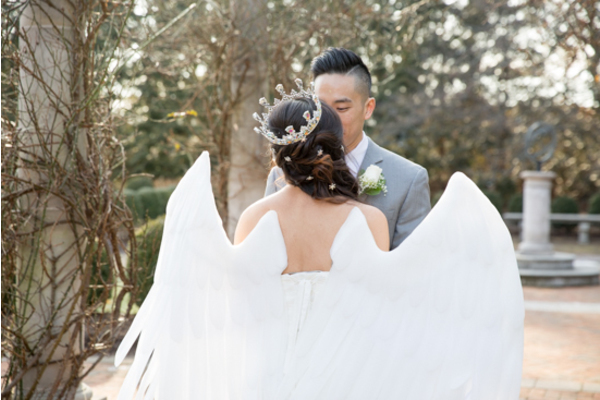 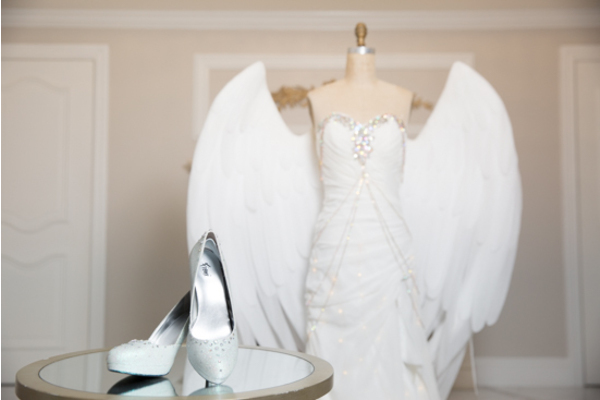 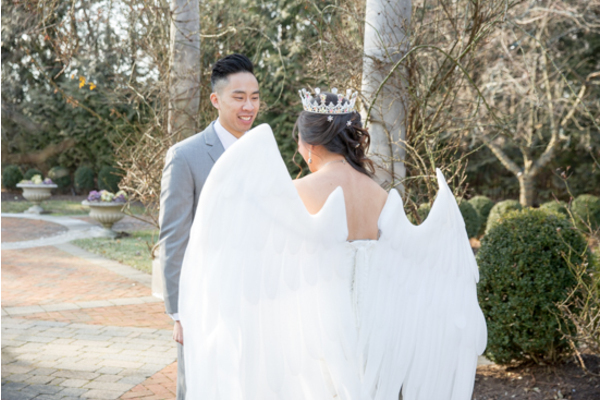 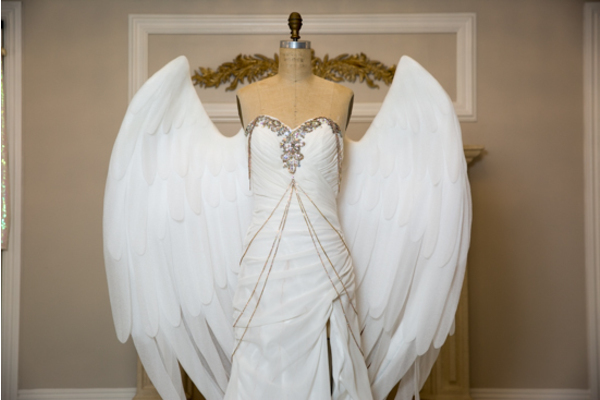 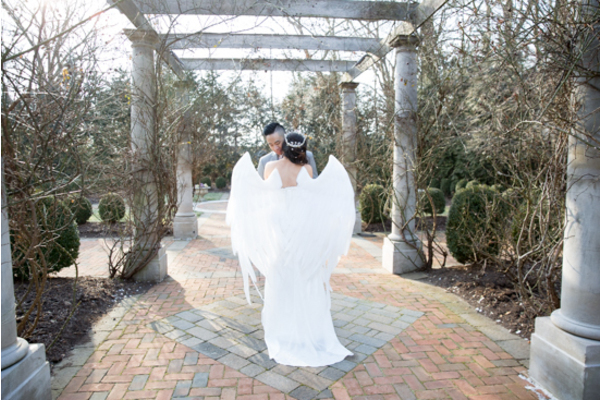 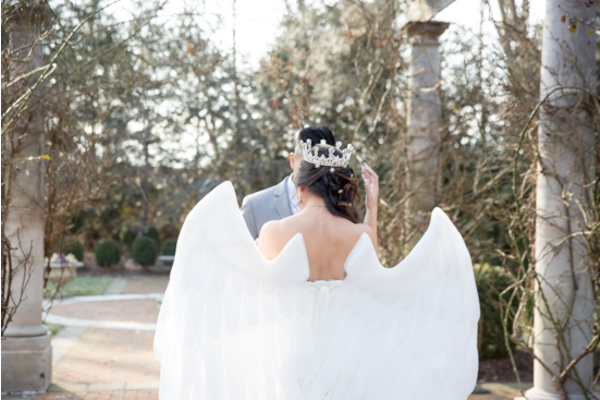 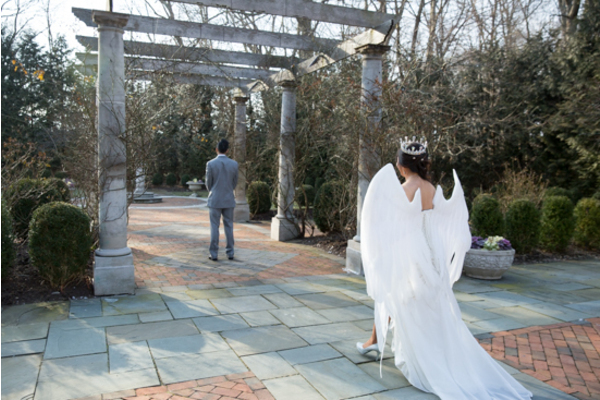 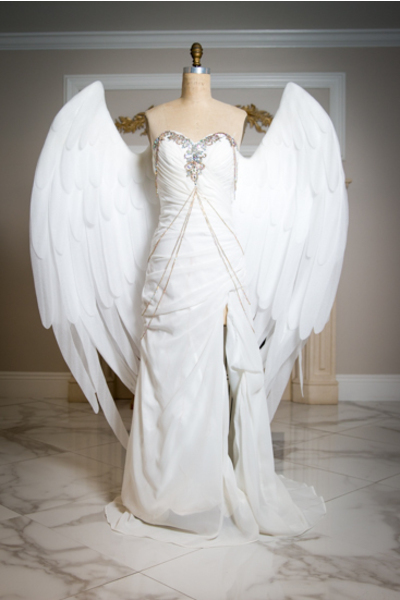 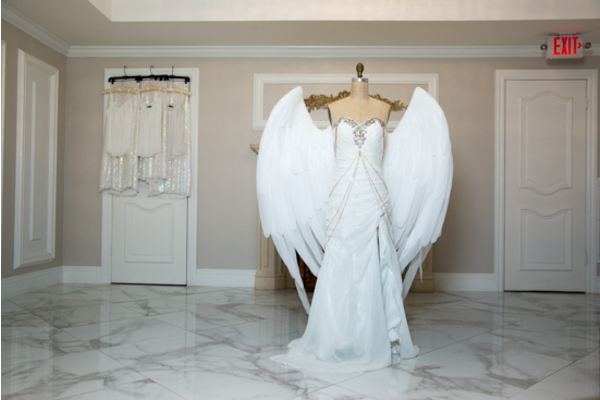 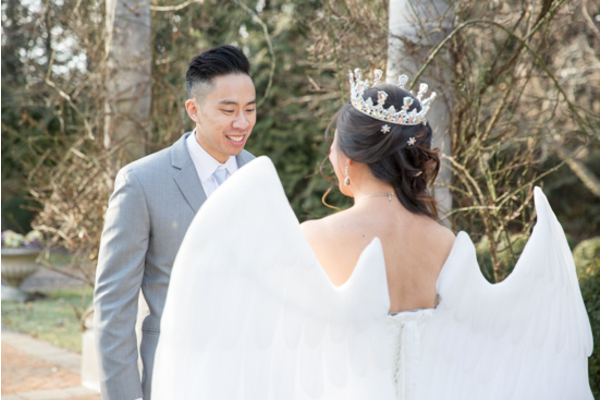 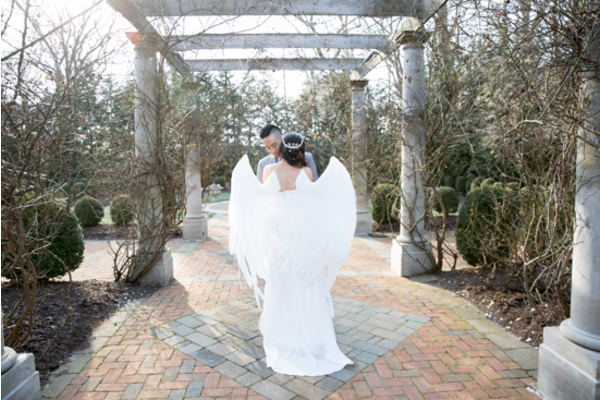 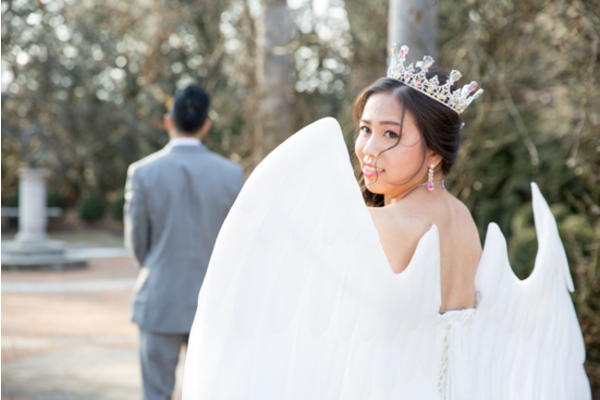 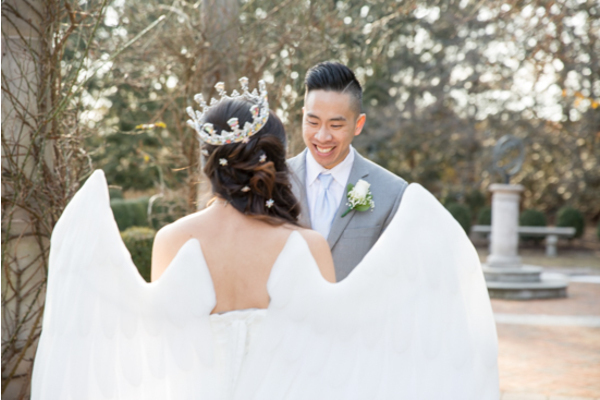 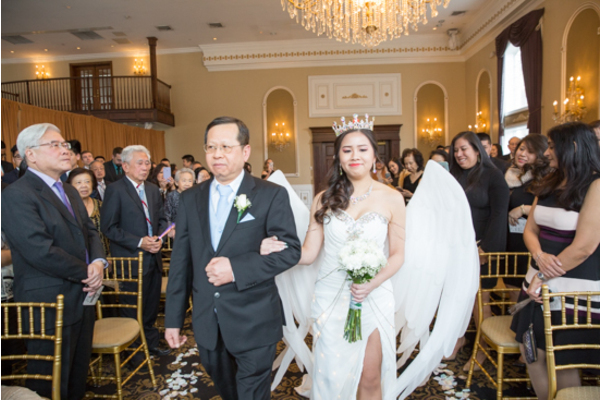 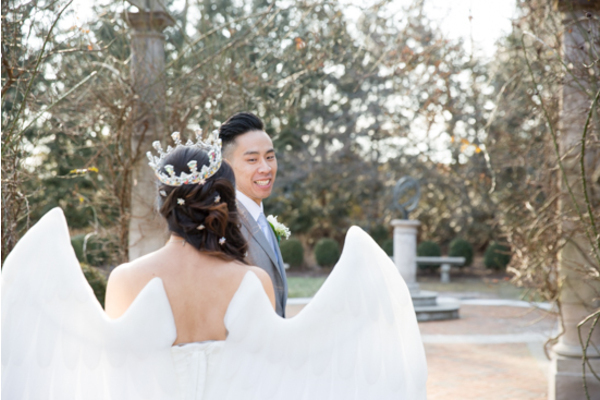 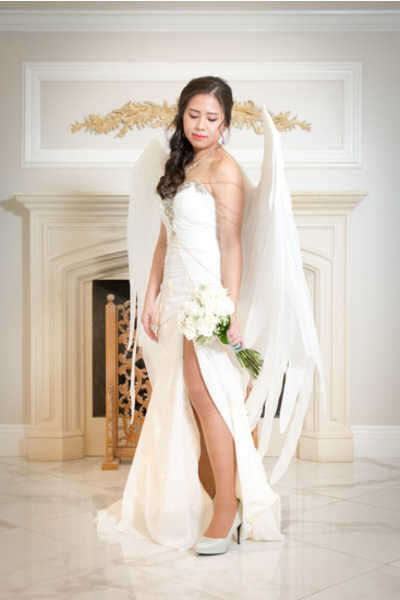 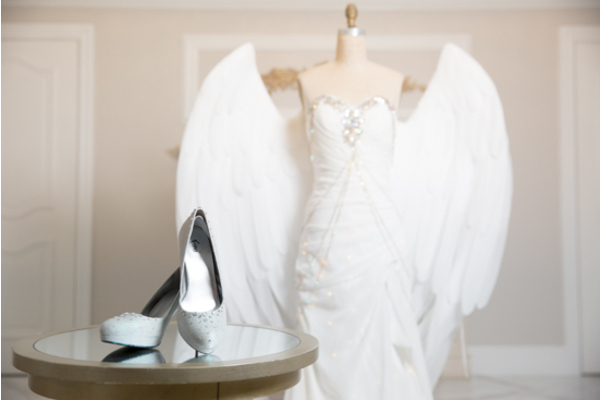 After Lucia’s hair and makeup were finished, the bride stepped into her luxurious gown, which was accented with angel wings! 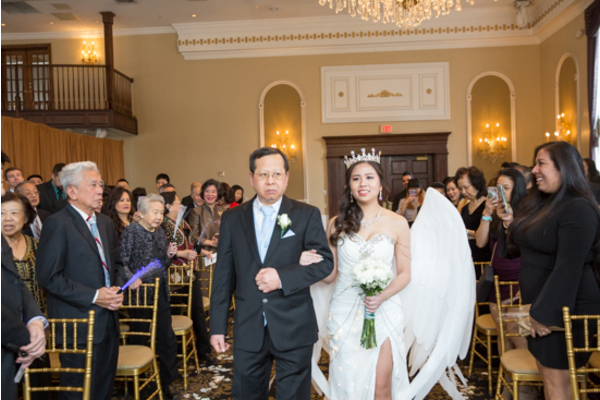 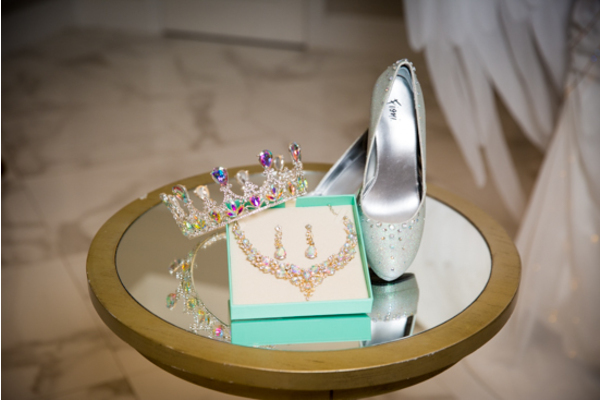 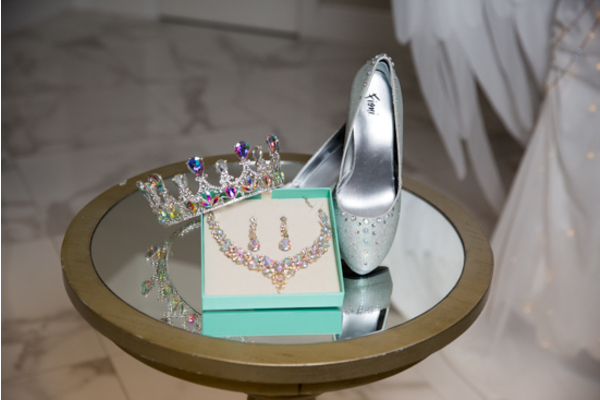 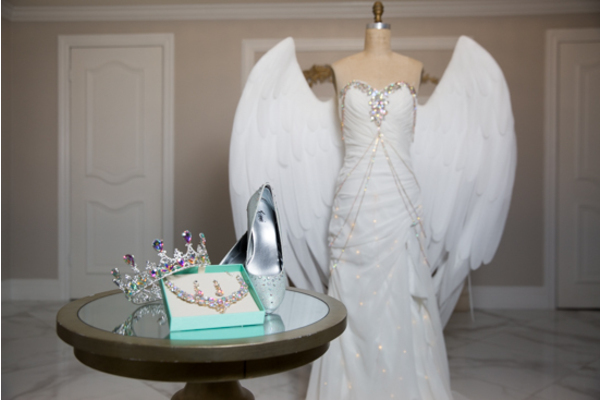 Once she topped off her look with a tiara, it was time for her to rock that aisle! 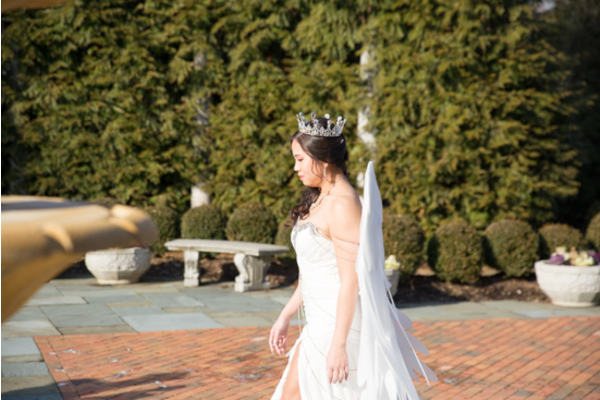 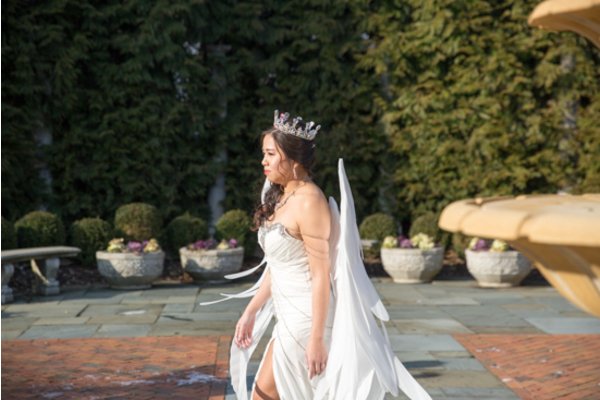 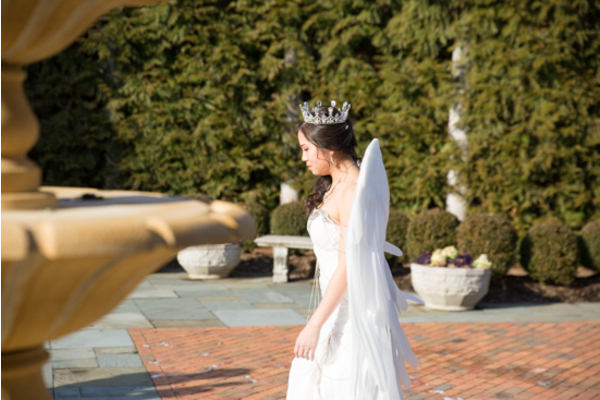 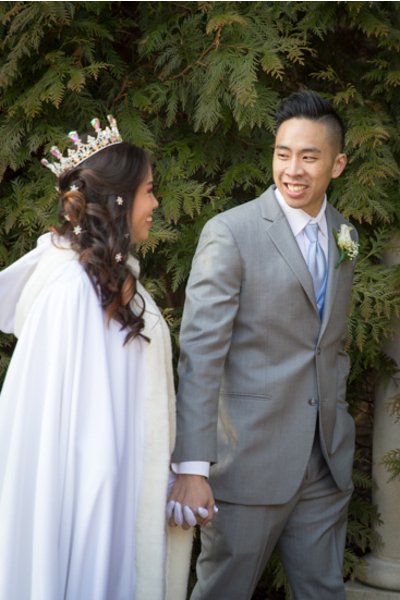 Lucia was sparkling in her wedding gown during her walk to Chris. 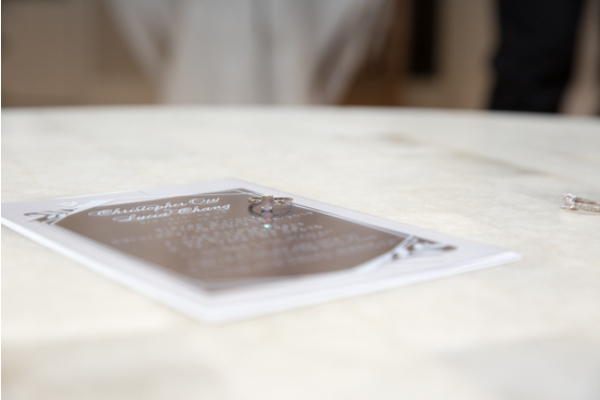 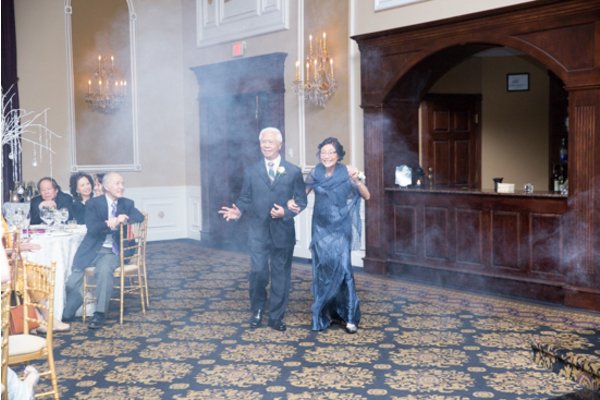 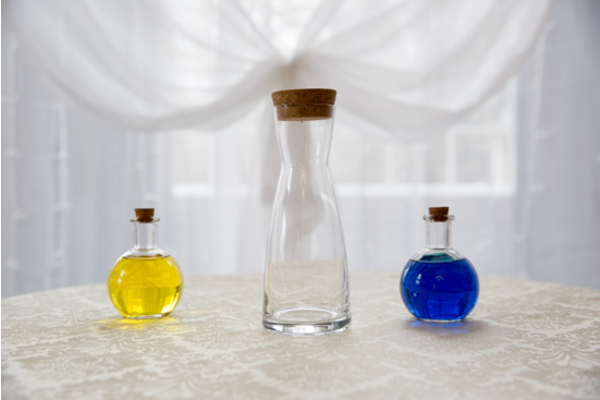 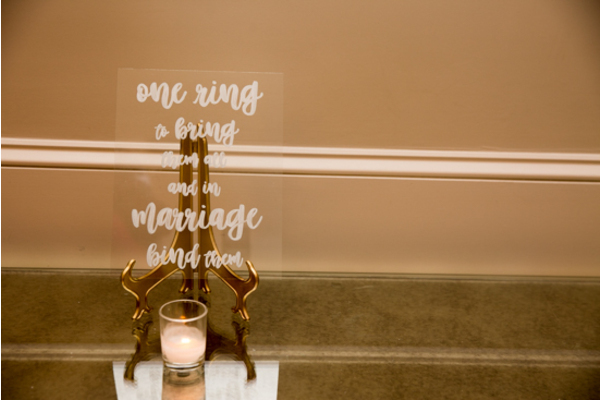 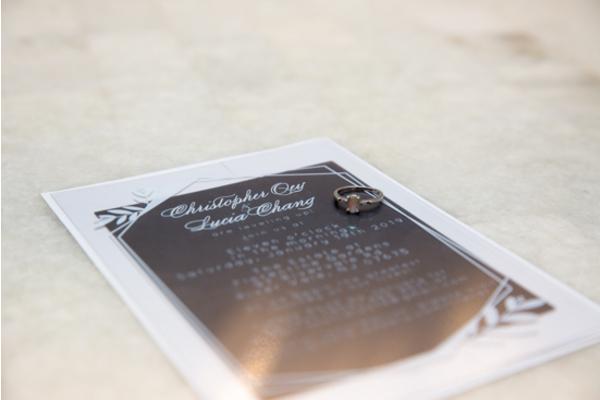 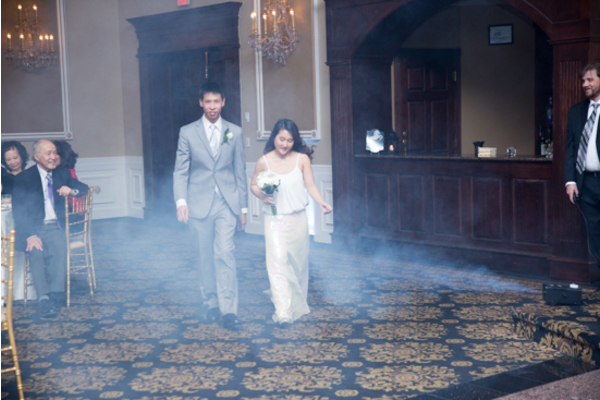 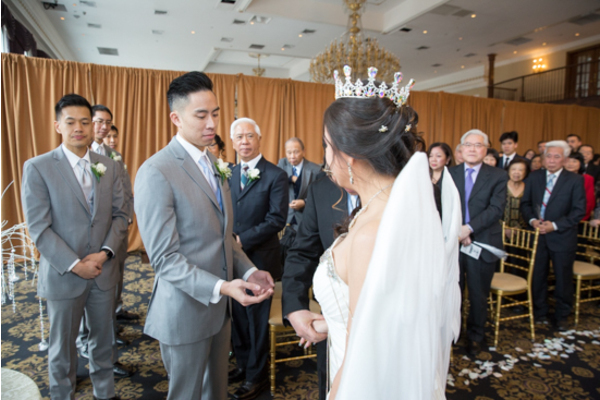 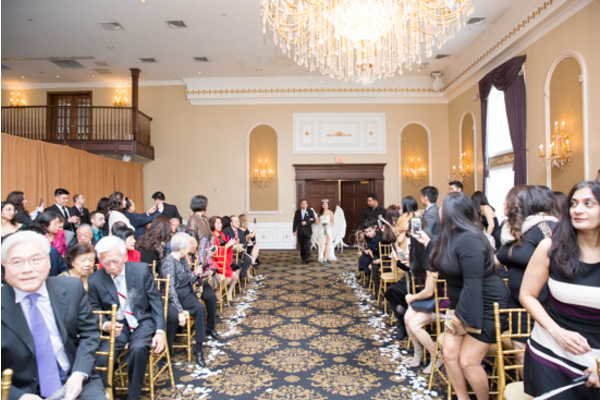 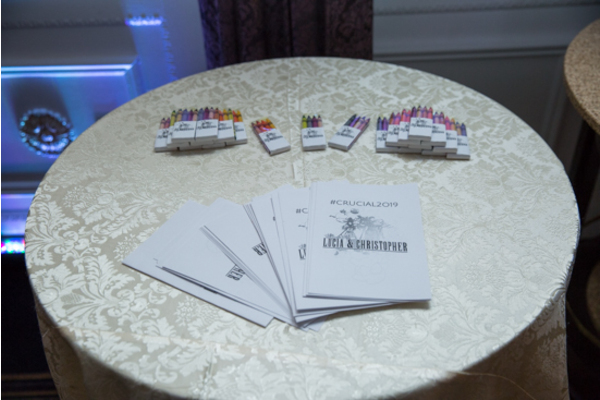 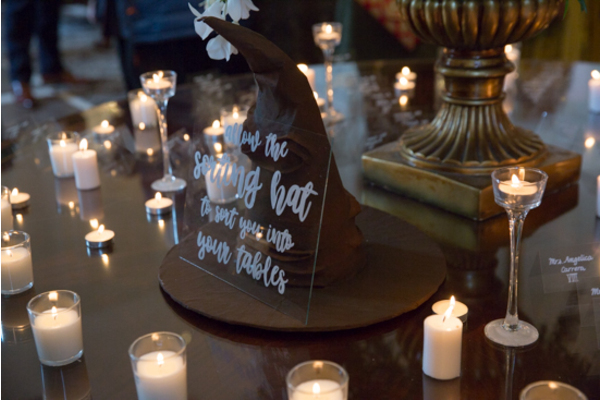 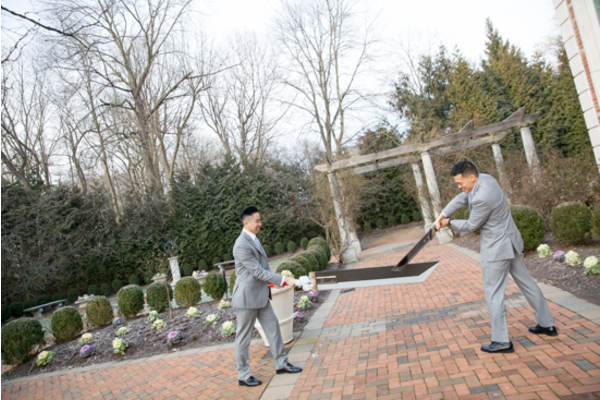 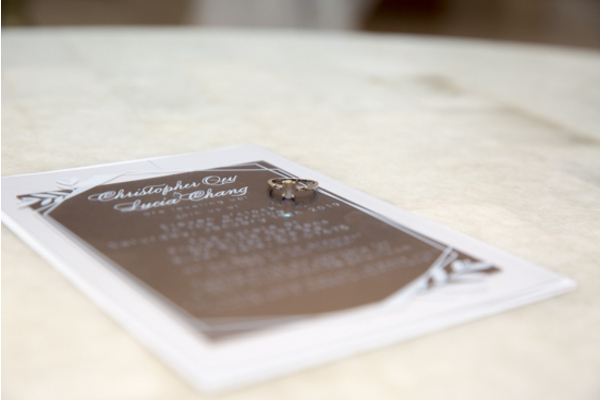 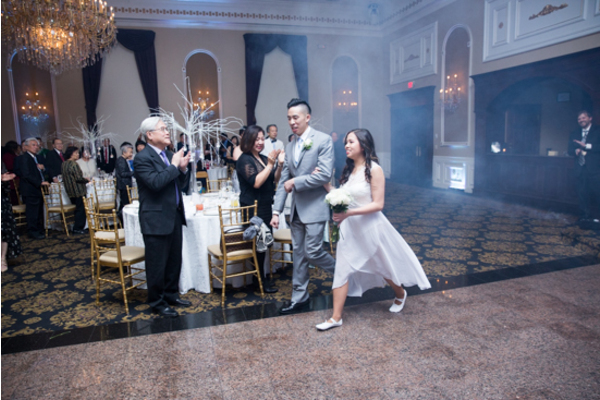 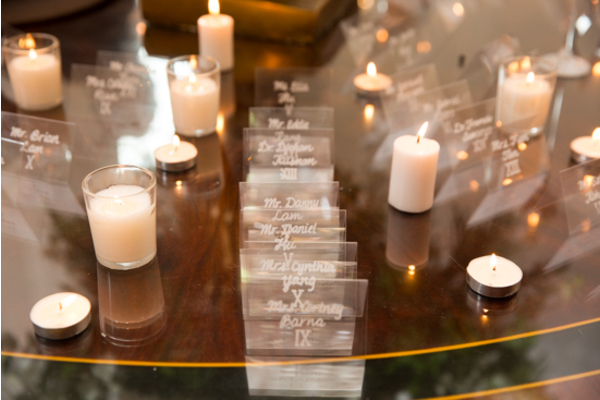 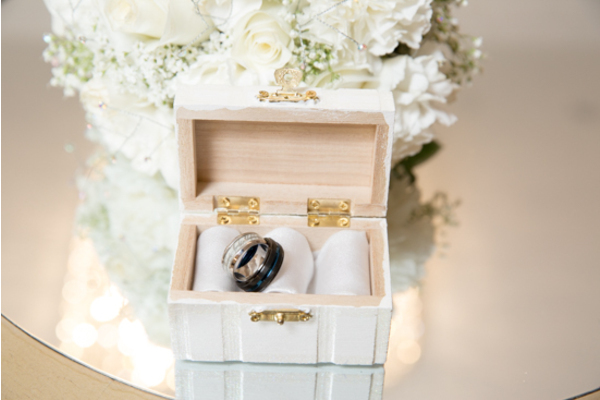 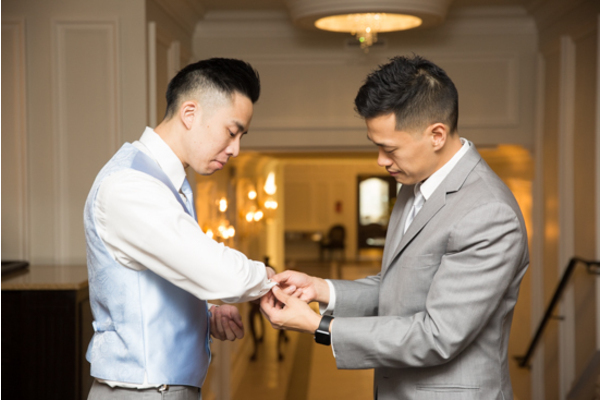 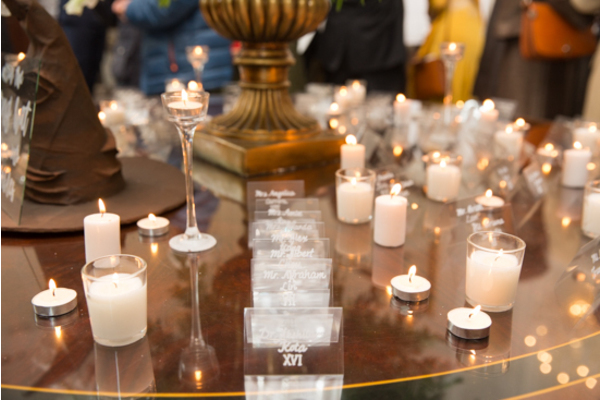 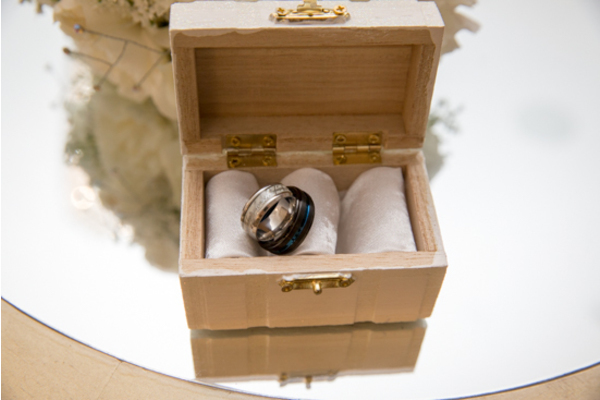 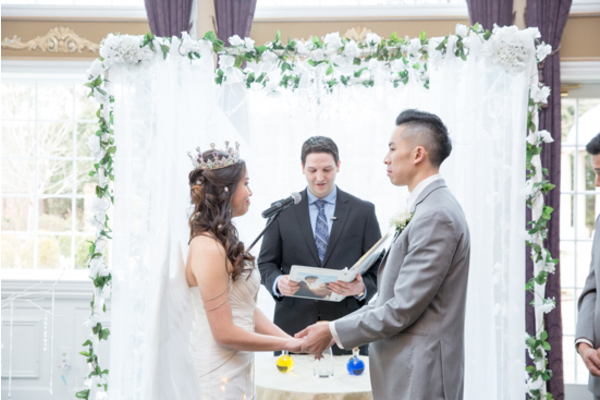 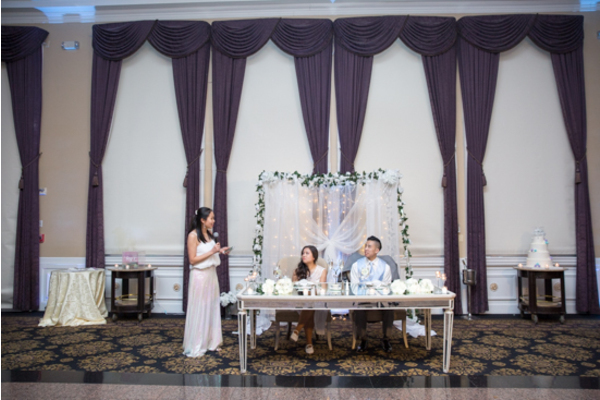 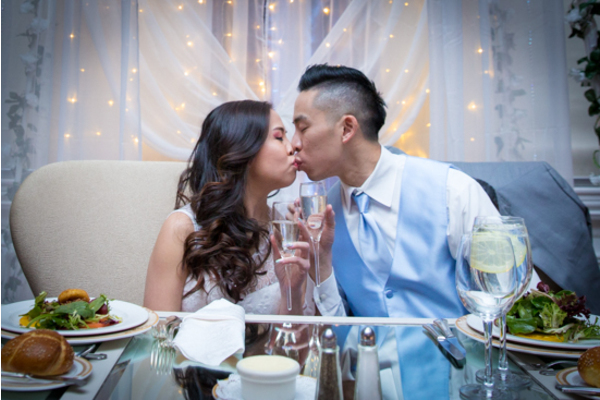 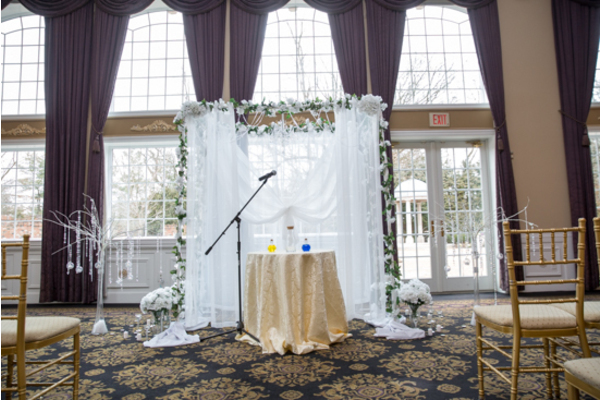 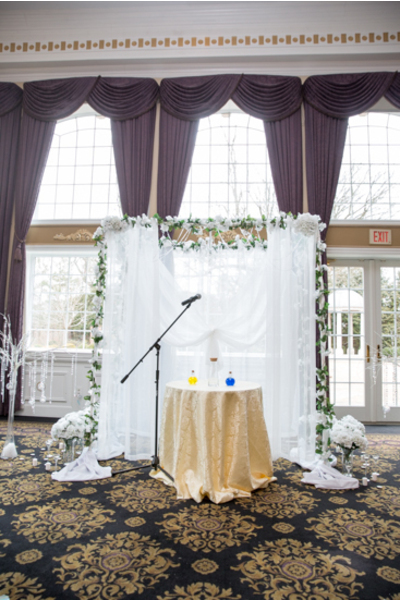 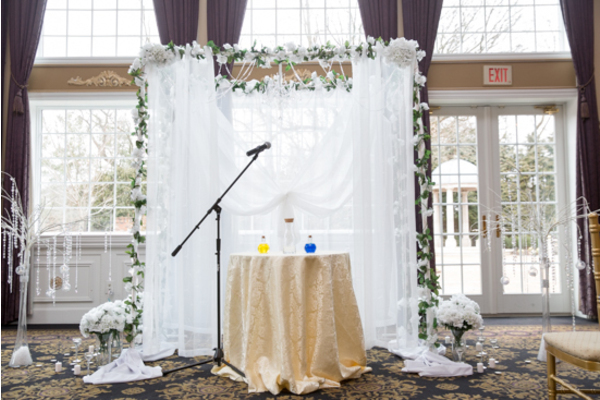 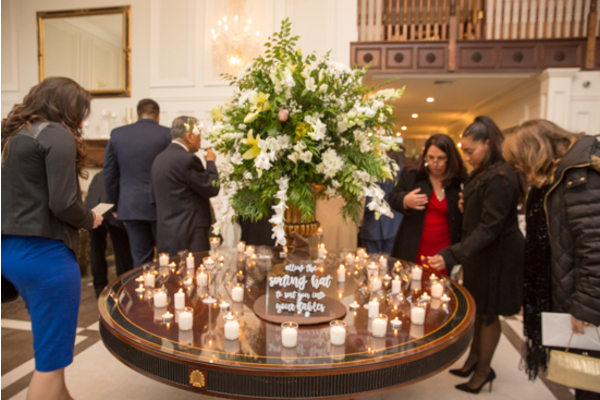 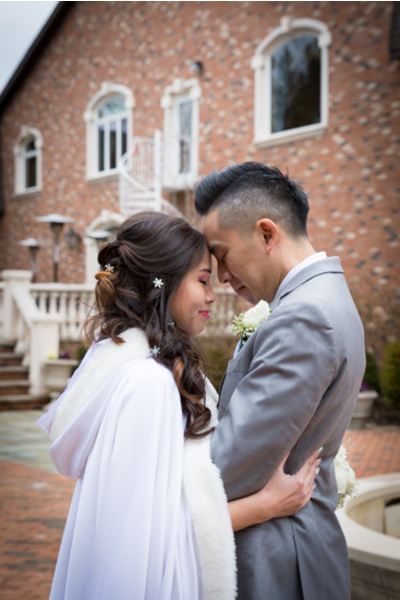 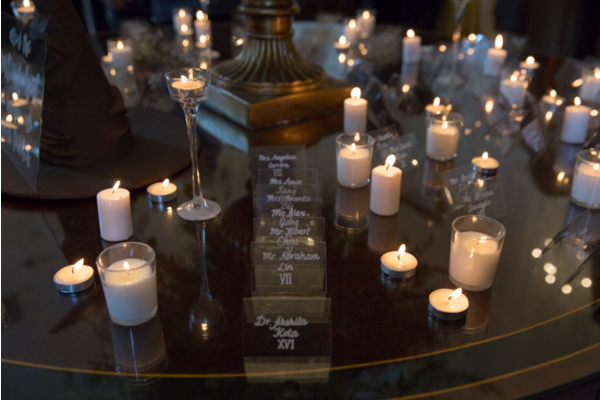 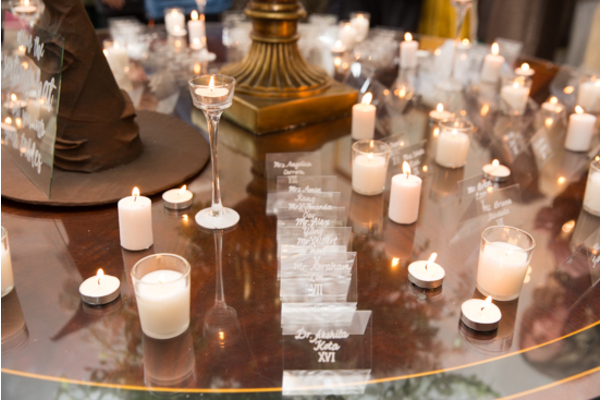 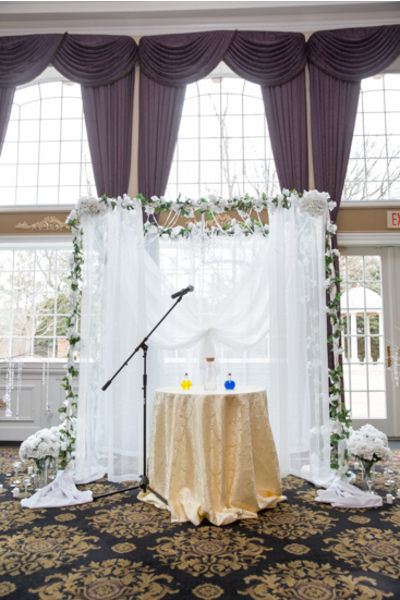 The two started their ceremony making a special love potion that our NJ Wedding Photographer got a beautiful shot of. 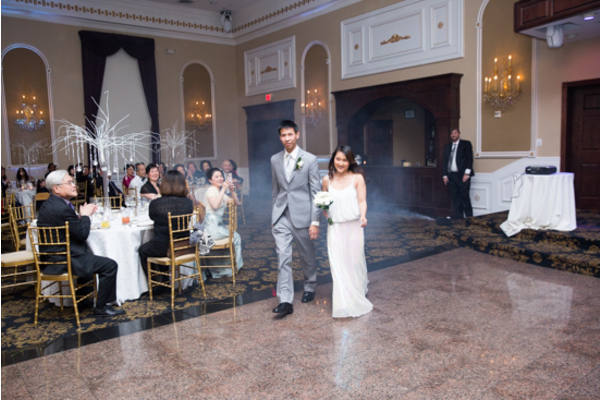 After their potion was mixed, the bride and groom proceeded to speak their heartfelt vows to each other. 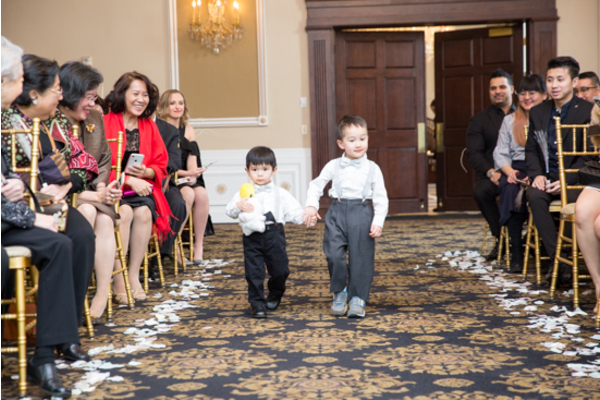 Finally, the two sealed it with kiss and had a big surprise in store for guests! 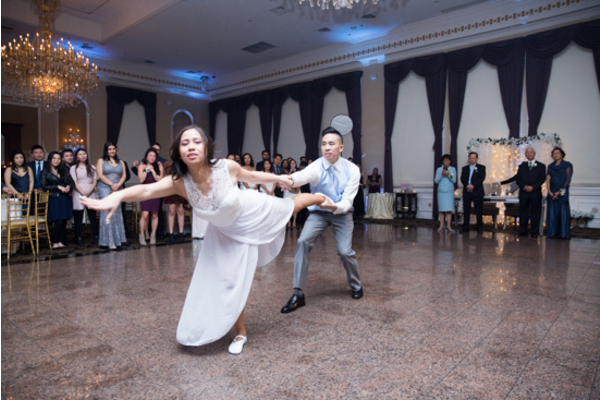 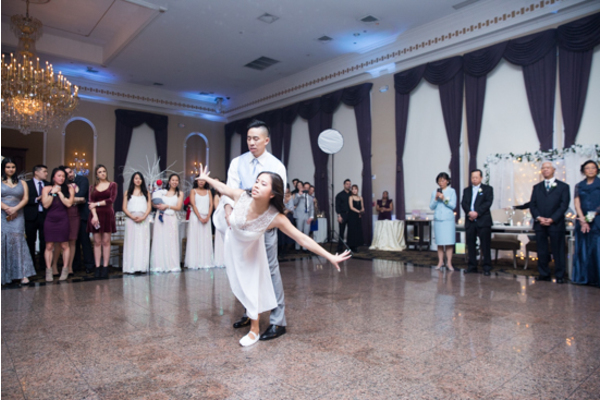 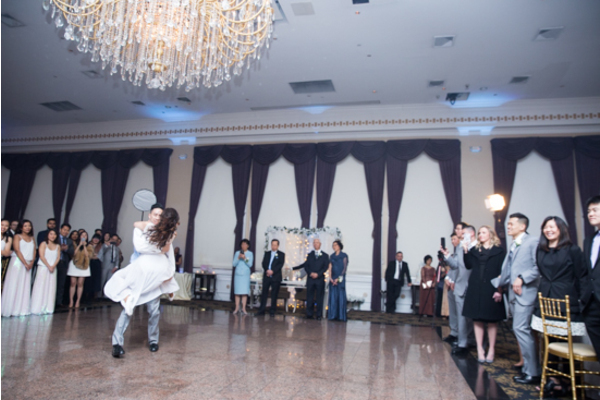 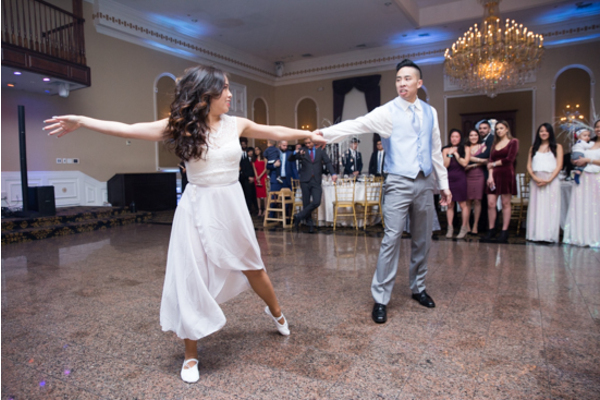 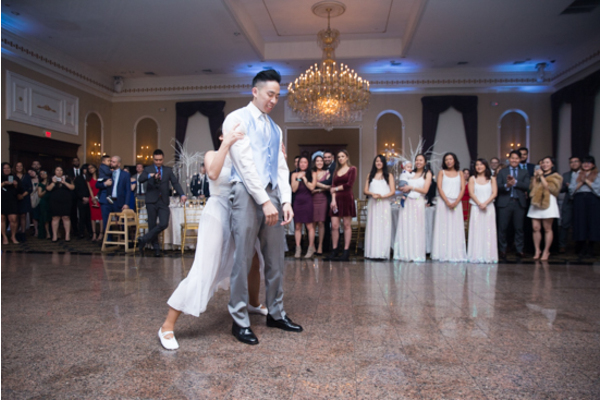 The bride and groom did a beautiful choreographed dance inspired by Ed Sheeran’s music video. 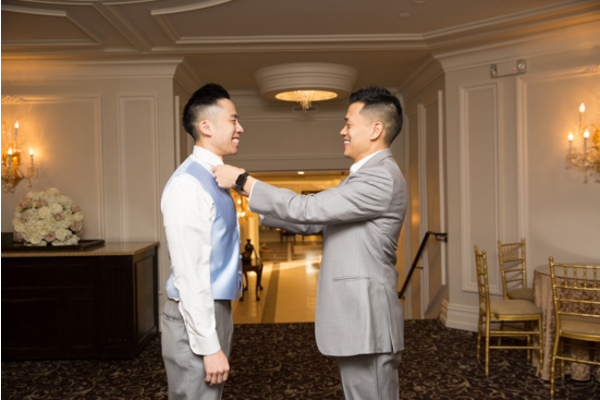 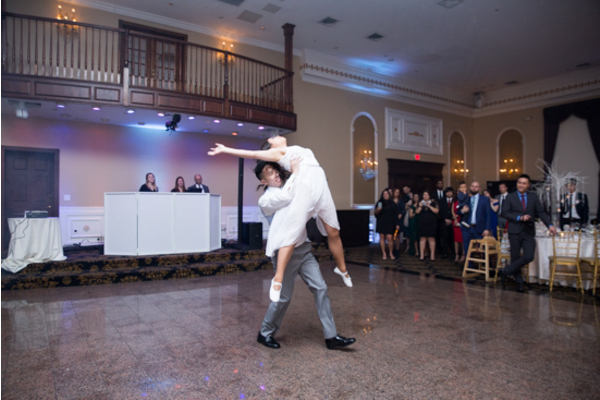 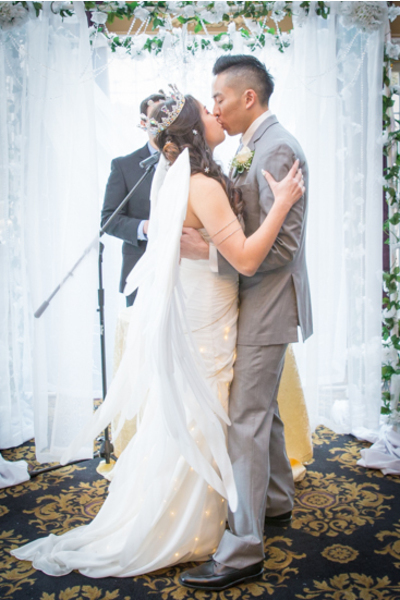 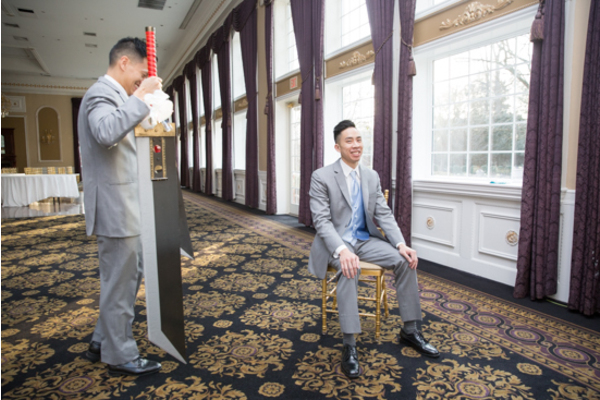 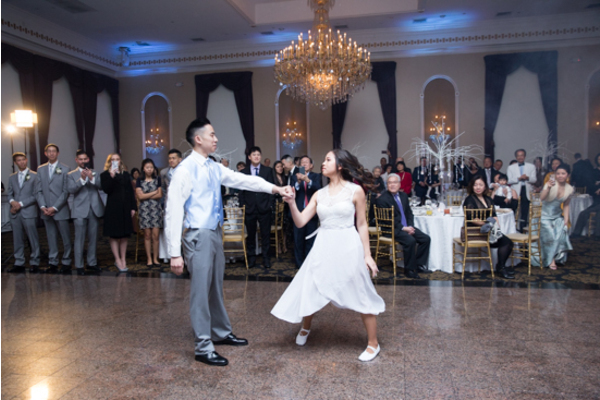 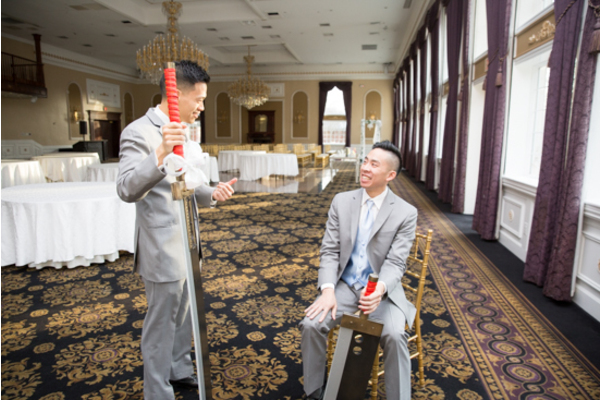 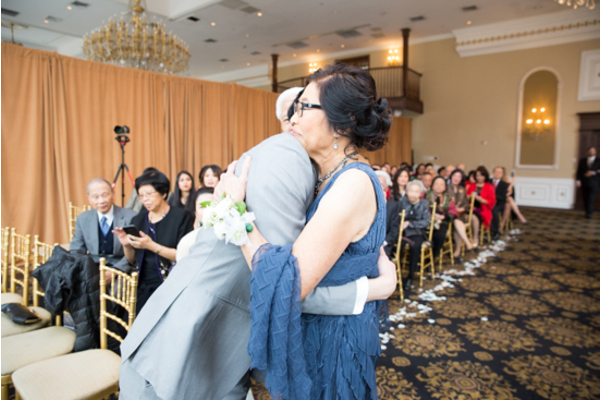 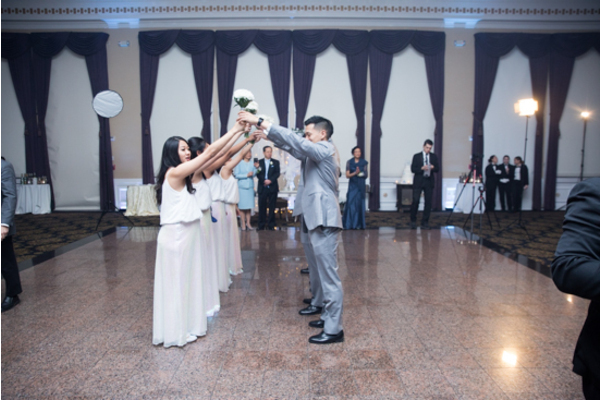 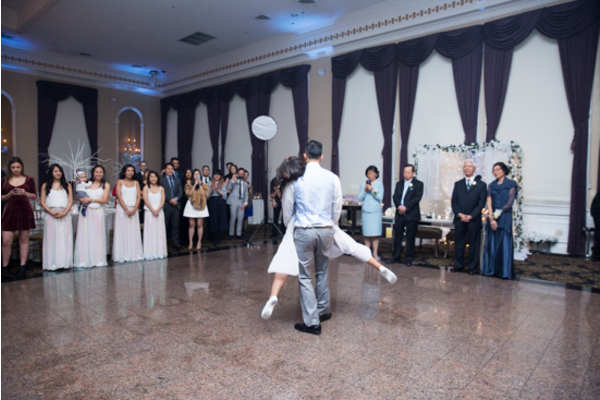 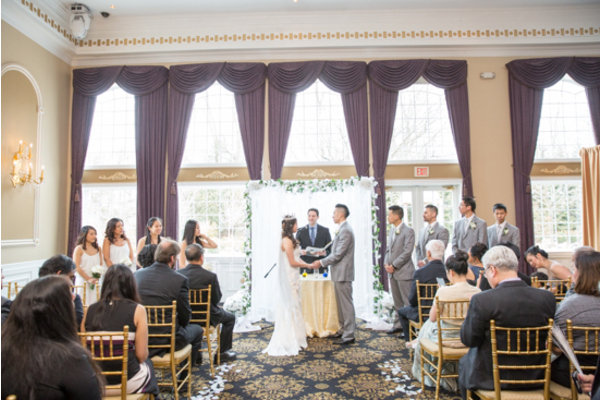 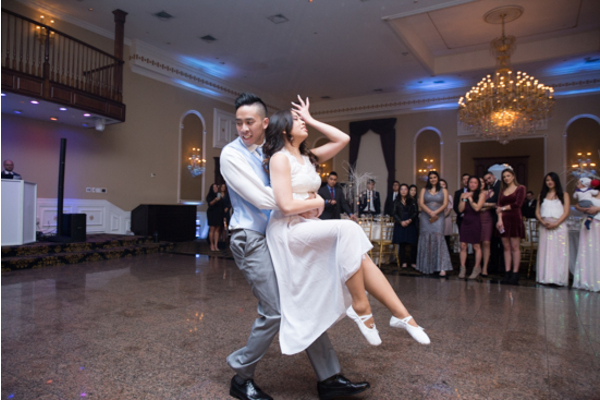 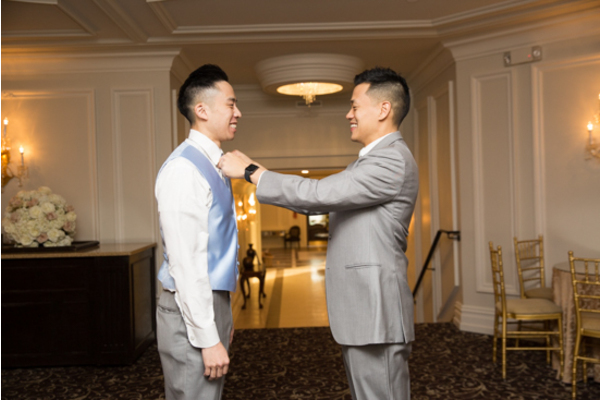 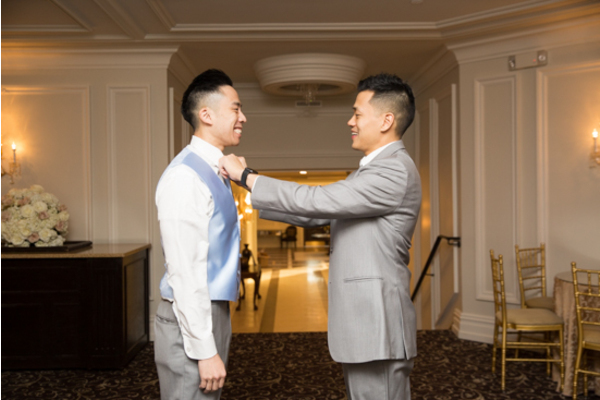 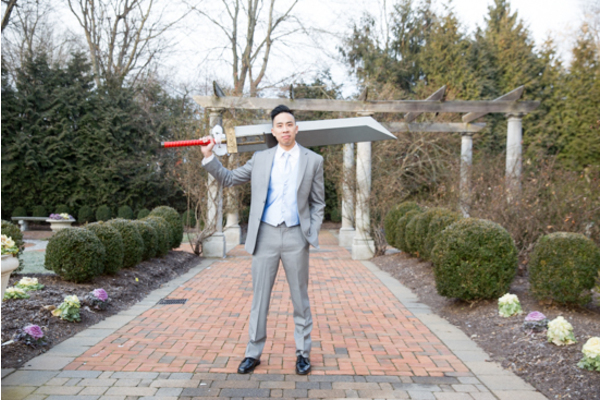 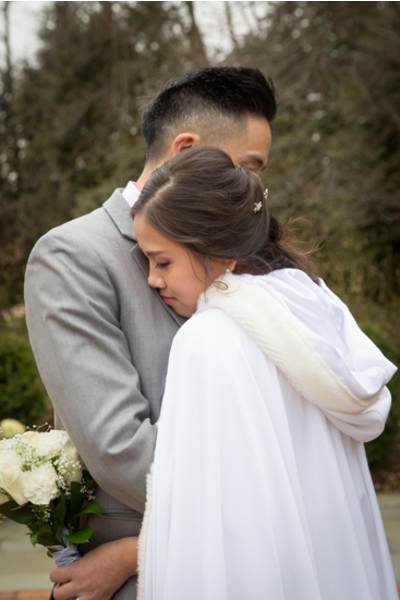 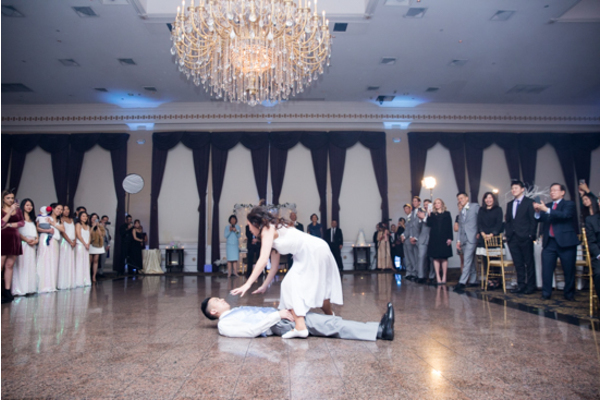 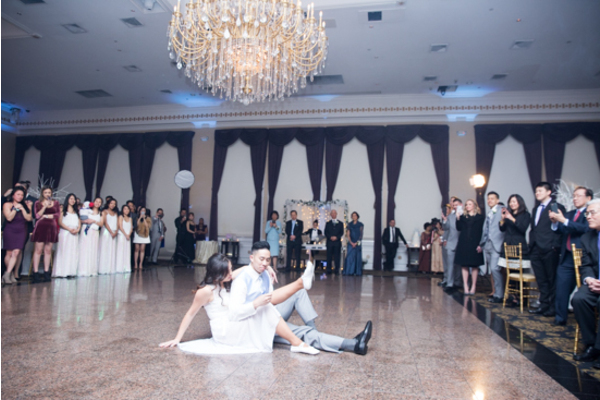 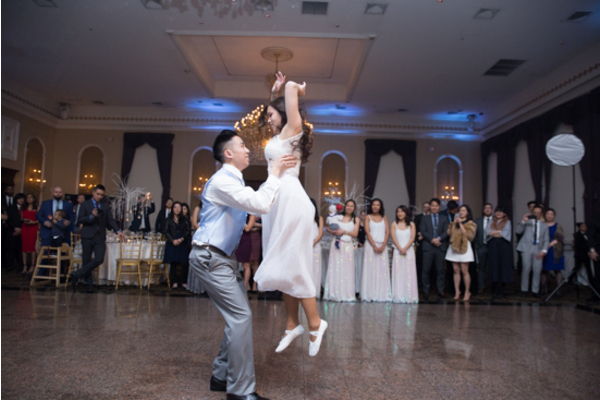 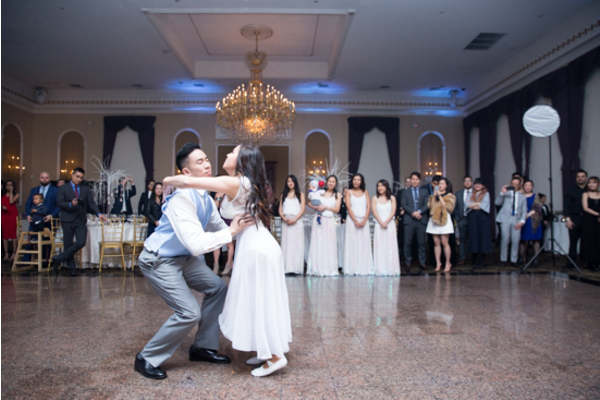 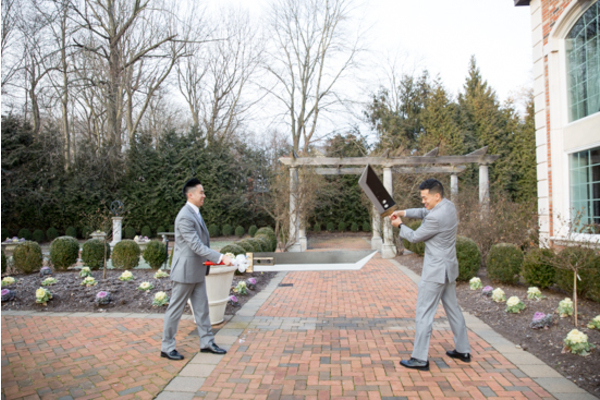 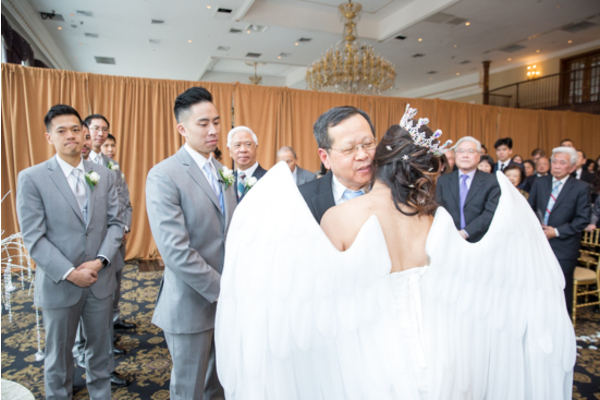 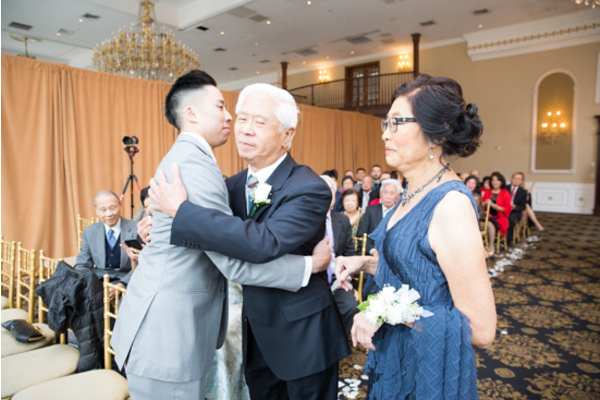 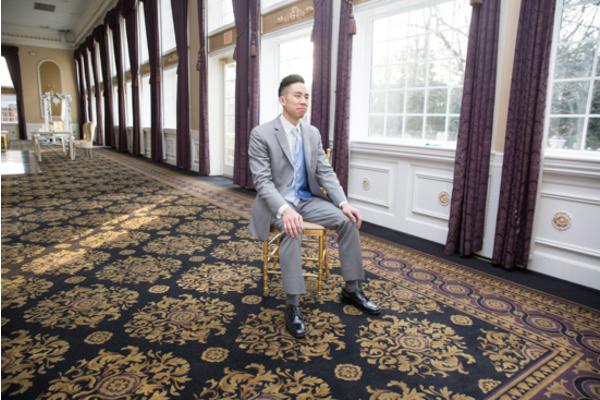 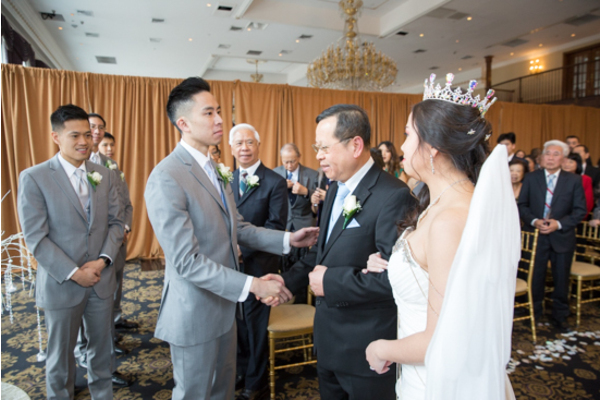 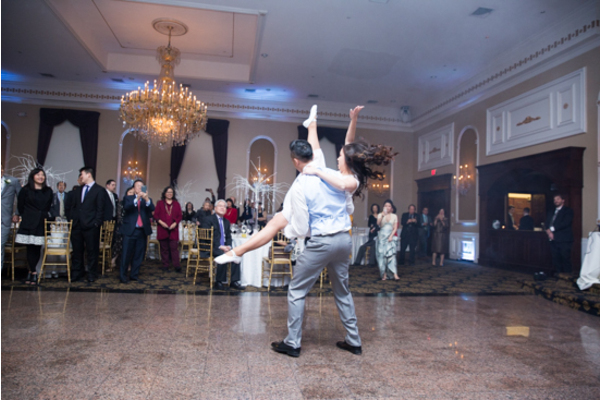 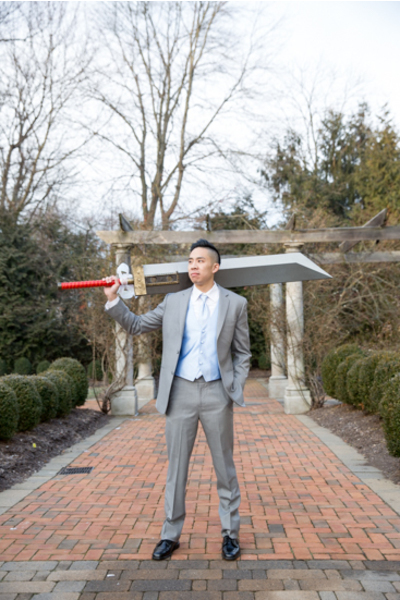 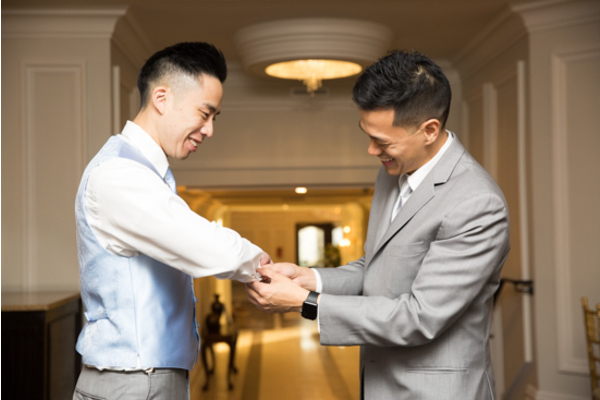 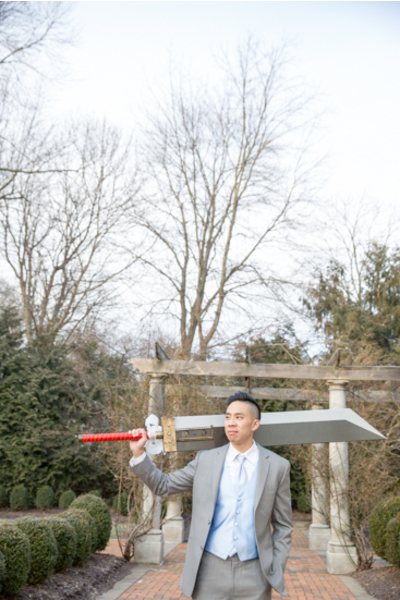 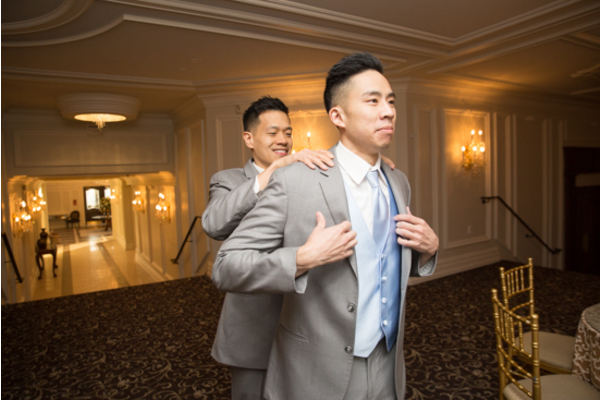 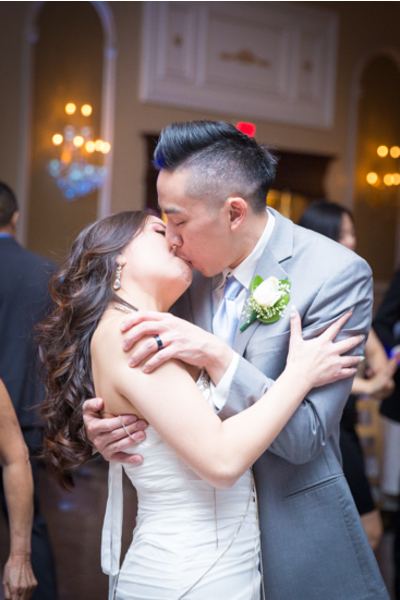 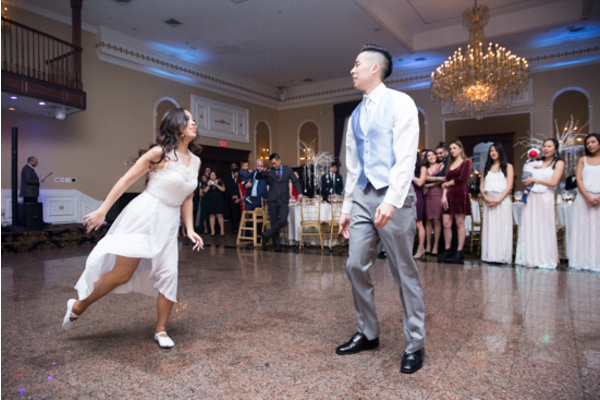 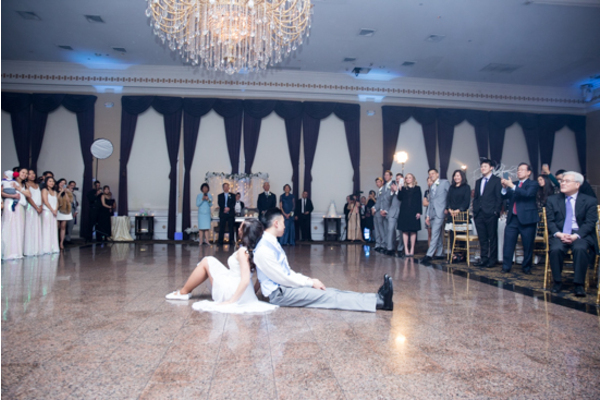 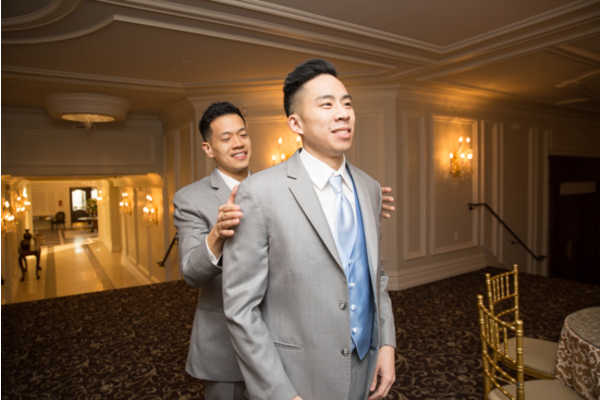 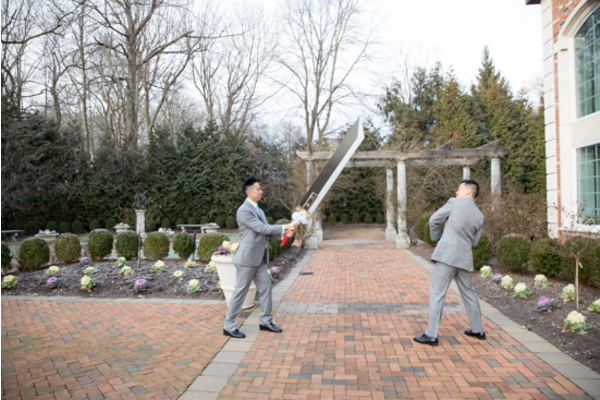 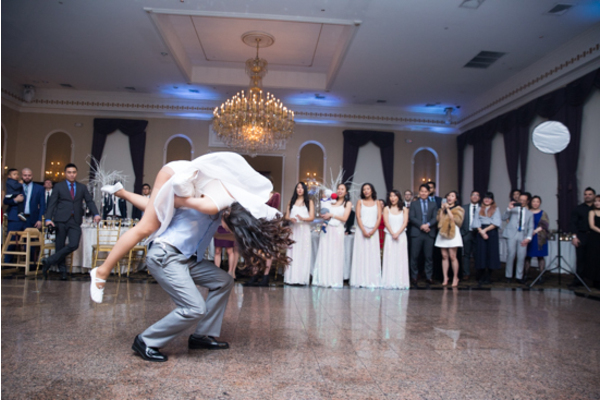 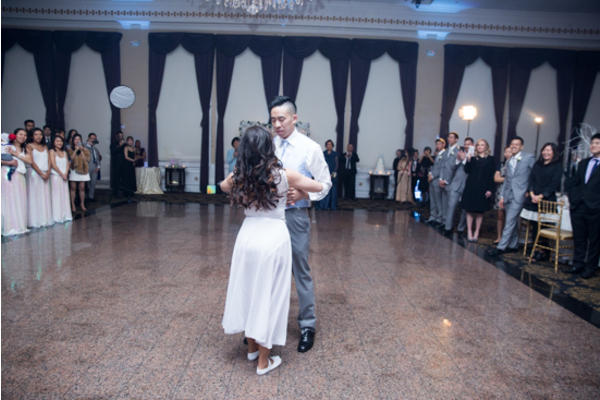 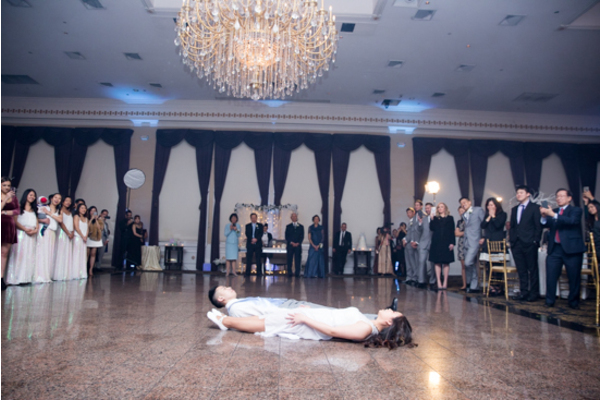 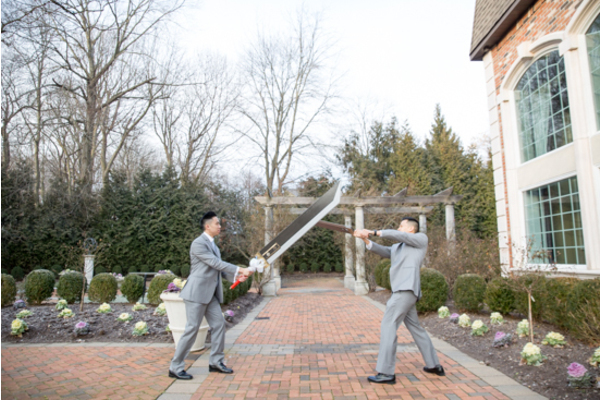 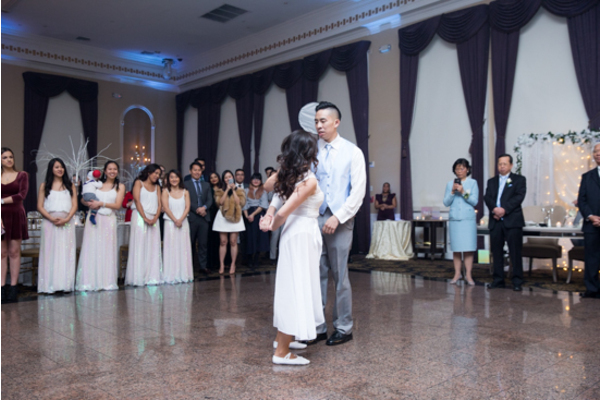 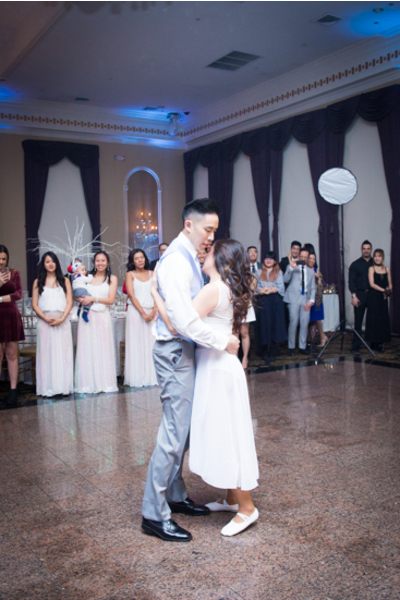 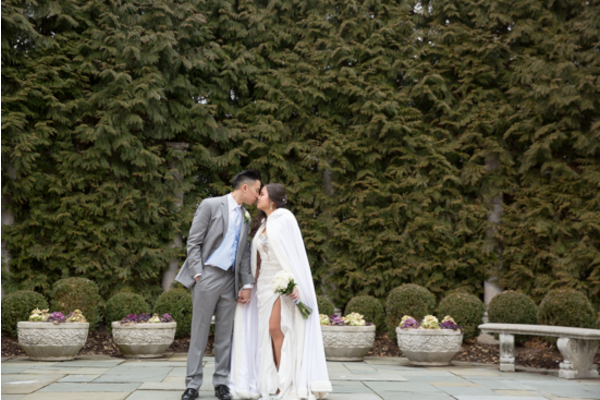 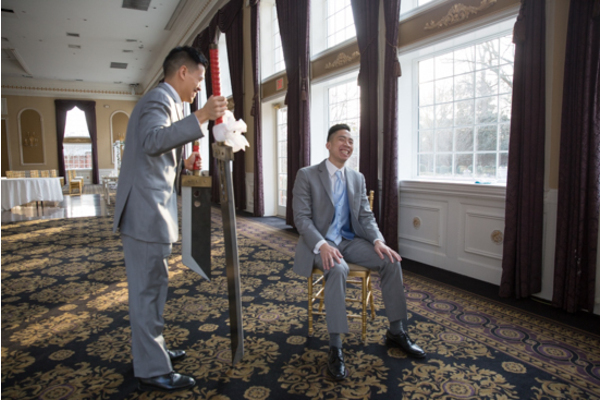 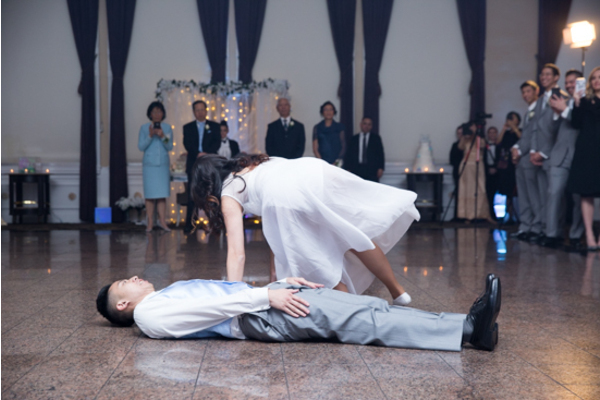 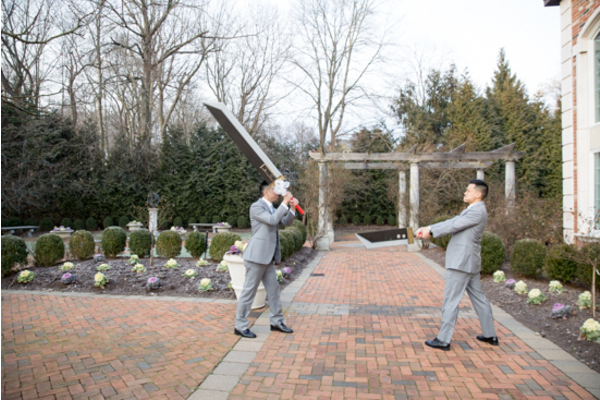 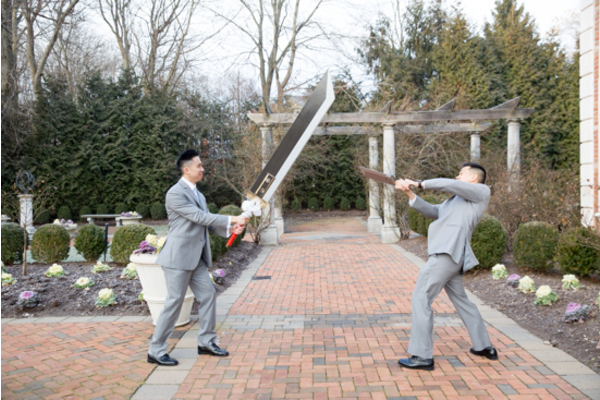 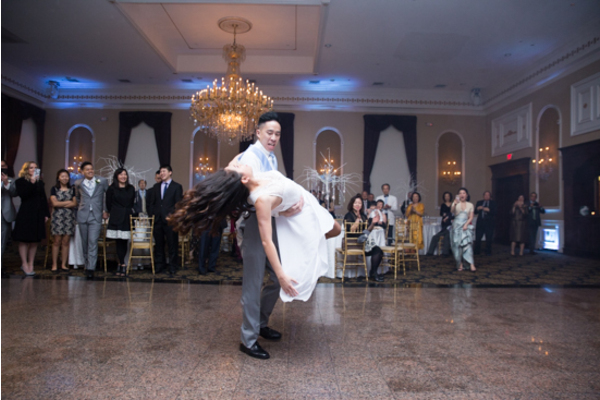 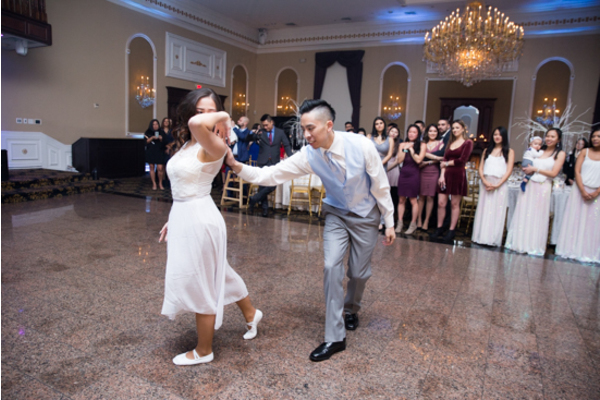 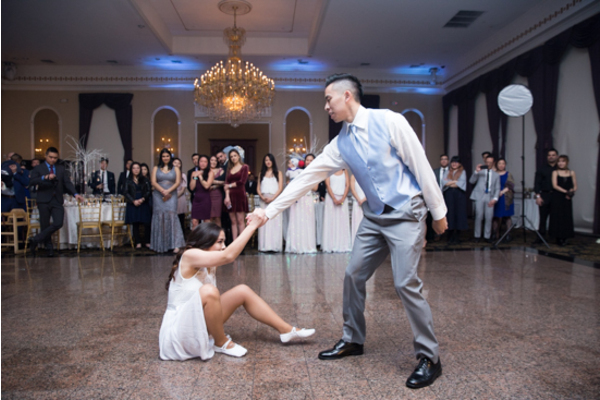 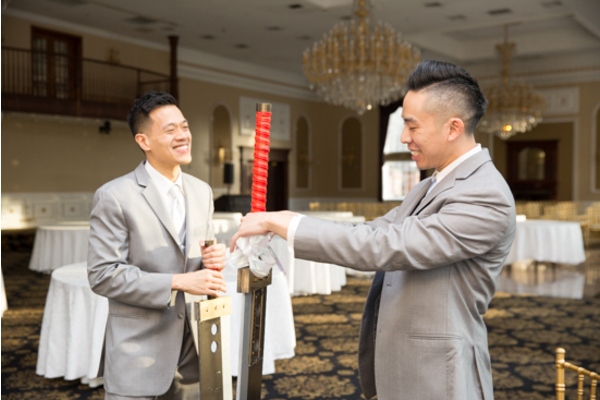 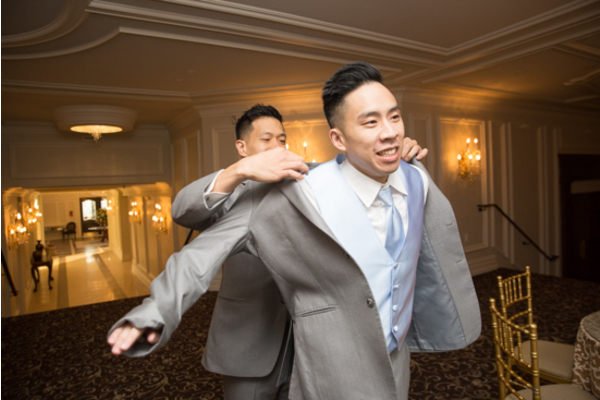 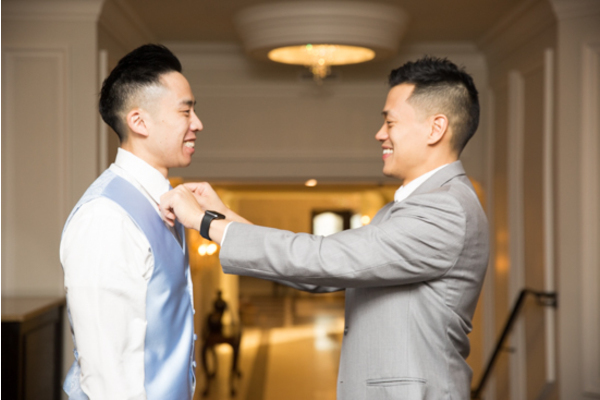 Our NJ Wedding Photographer made sure to catch this unforgettable moment for the newlyweds. 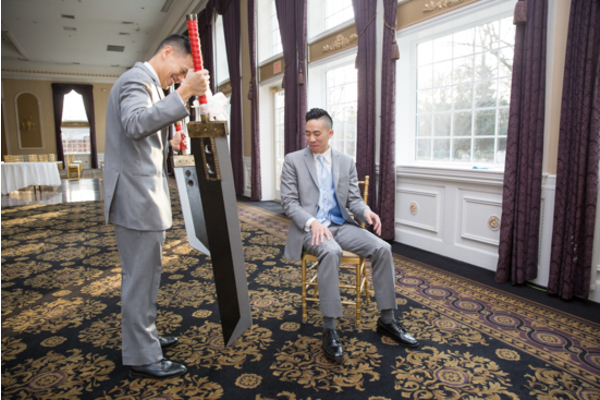 After the romantic first dance, the bride sang her own rendition of “Eyes On Me” from Final Fantasy Eight during dinnertime. 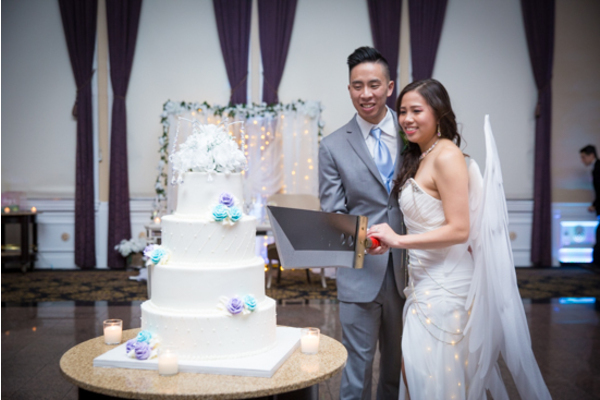 At the end of the night,Lucia and Chris cut their cake together and enjoyed the rest of their celebration. 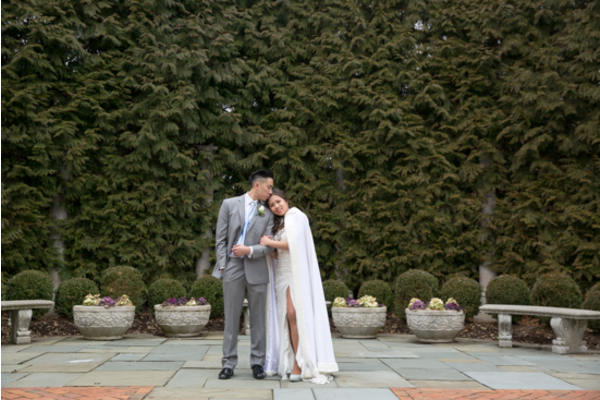 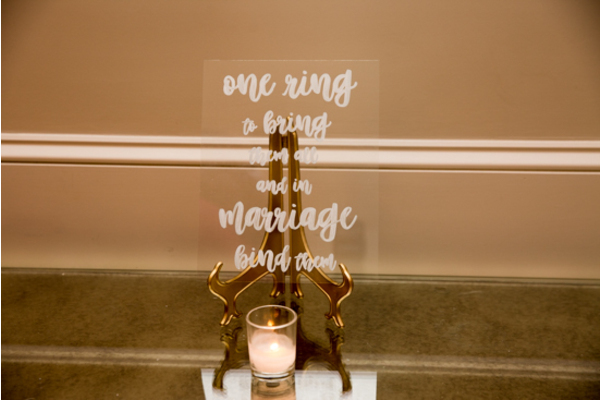 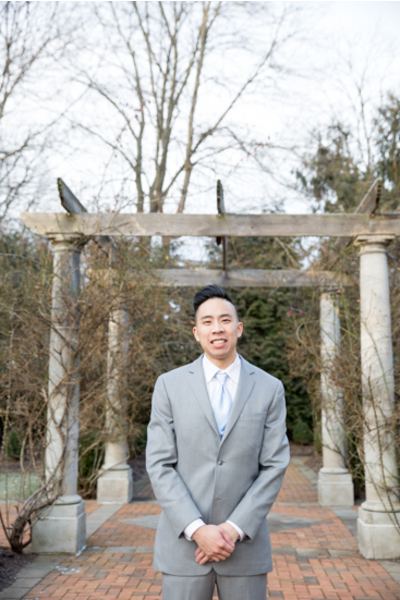 This wedding was one for the books, and we are so happy to have been there every step of the way! 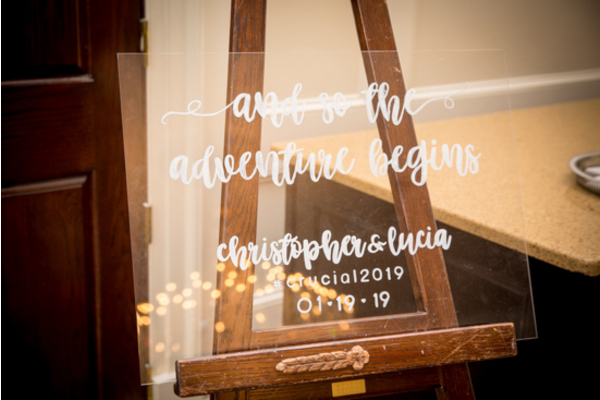 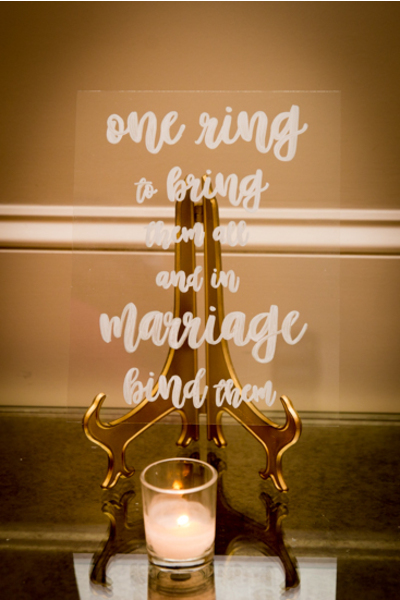 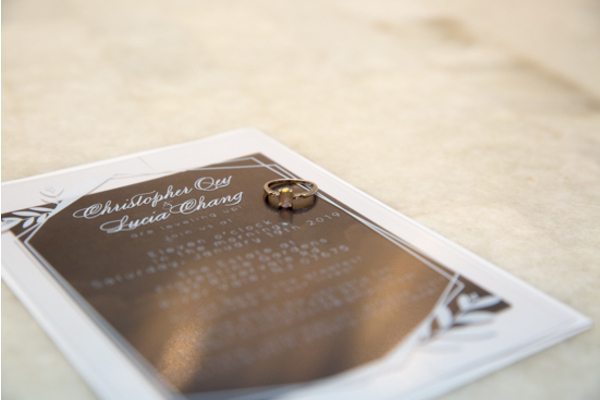 Congratulations once again to Lucia and Chris,and we truly wish you all the happiness together!